(1922)^ - Hollywood Bowl at the first Symphony Under the Stars. 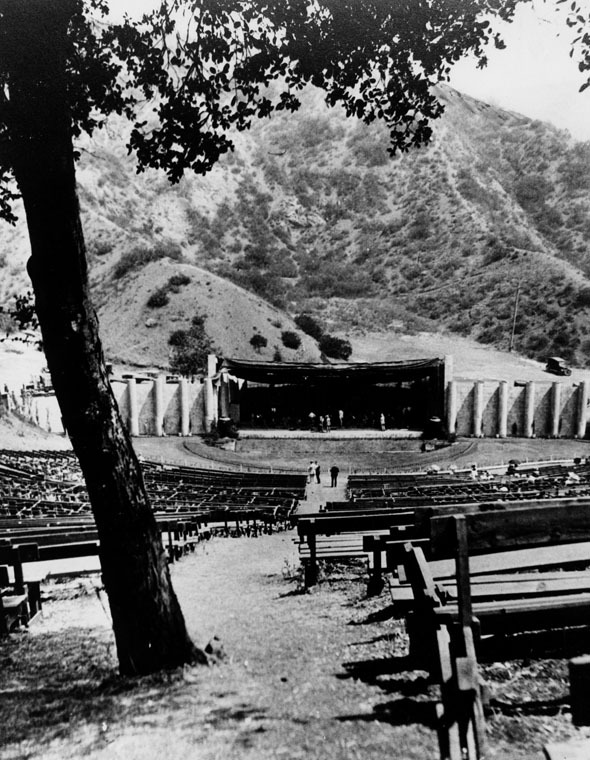 This was the "Bowl's" official opening and was on the site of a natural amphitheater formerly known as the Daisy Dell. 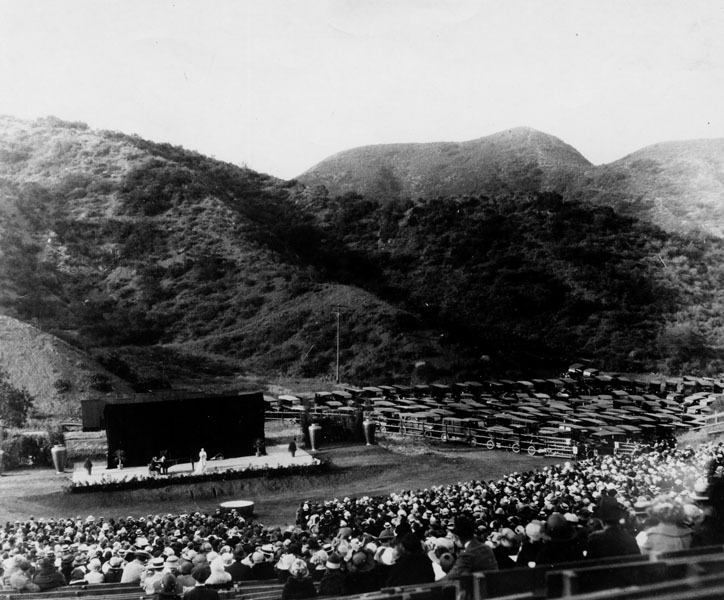 On July 11, 1922, with the audience seated on simple wooden benches placed on the natural hillsides of Bolton Canyon, conductor Alfred Hertz and the Los Angeles Philharmonic inaugurated the first season of music under the stars at the Hollywood Bowl. The Bowl was very close to its natural state, with only makeshift wooden benches for the audience, and eventually a simple awning over the stage. (ca. 1922)^ - Concert by Rosa Paniella at the Hollywood Bowl. Note the location of the parked cars. In 1922 the price of admission to the Hollywood Bowl was only 25 cents. (ca. 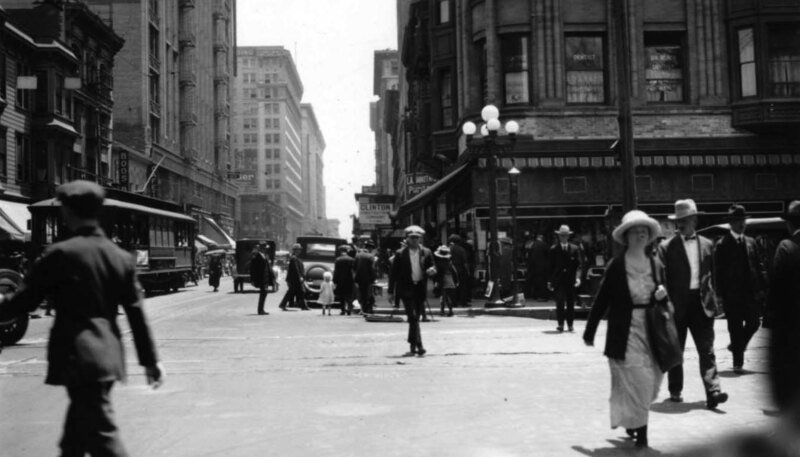 1920)^ - View of Los Angeles Street, looking north from 3rd Street. Horse drawn vehicles as well as automobiles travel on this busy street. Note how some of the cars are parked perpendicular to the curb. 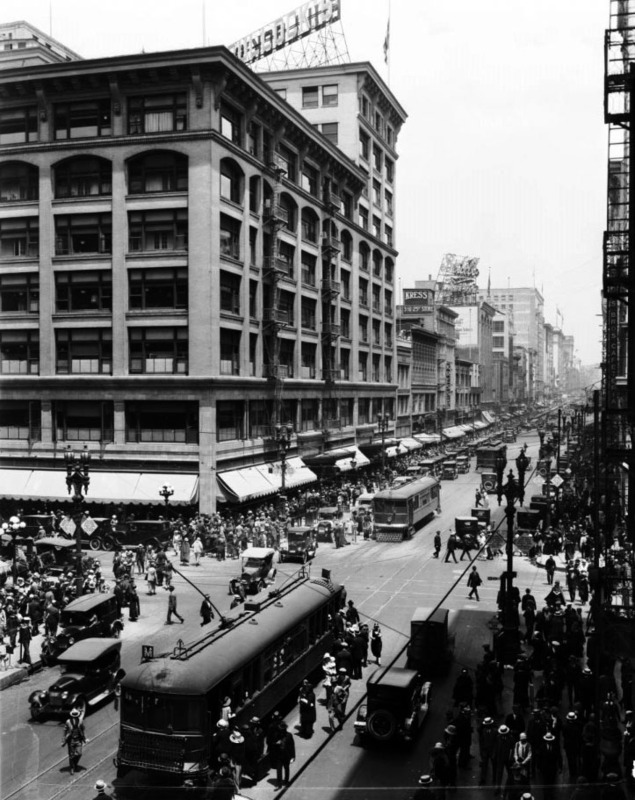 (1920s)^#^ – View looking at the northwest corner of 2nd and Los Angeles streets. They're advertising clean beds in the upstairs windows. (ca. 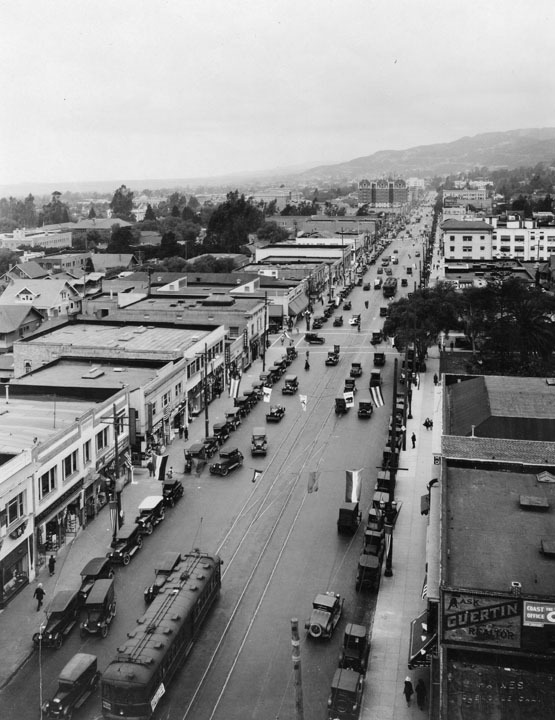 1922)^^ - View of Western Avenue looking north from Pico Street. Billboard signs can be seen along the street advertising various business from gasoline to real estate. 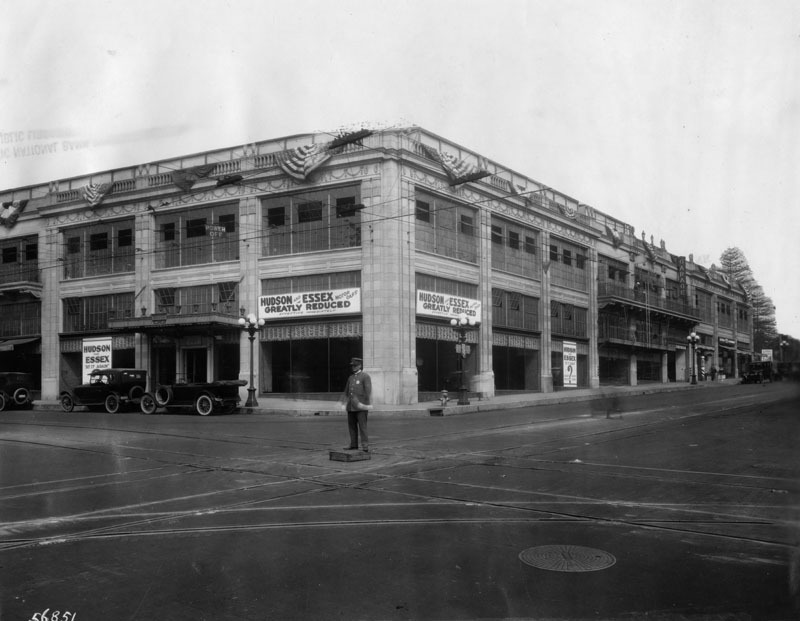 (1922)^ - View of the Arnold Building on the northwest corner of 7th and Figueroa. Several banners hang outside of the building. They read: "Hudson and Essex motor cars. Greatly reduced. Effective immediately", and "Hudson and Essex. At it again. Lower prices. Easier terms". Electric car tracks and wiring can be seen on the streets and above, and a police officer stands in the middle of the street directing traffic, although there is none. (1921)^^ - Birdseye view of Seventh Street looking west from Broadway, showing the Vogel Block on the corner at left. The three-story building is topped by a spired dome and covered with signs. Its windows have molding reminiscent of Victorian architecture. 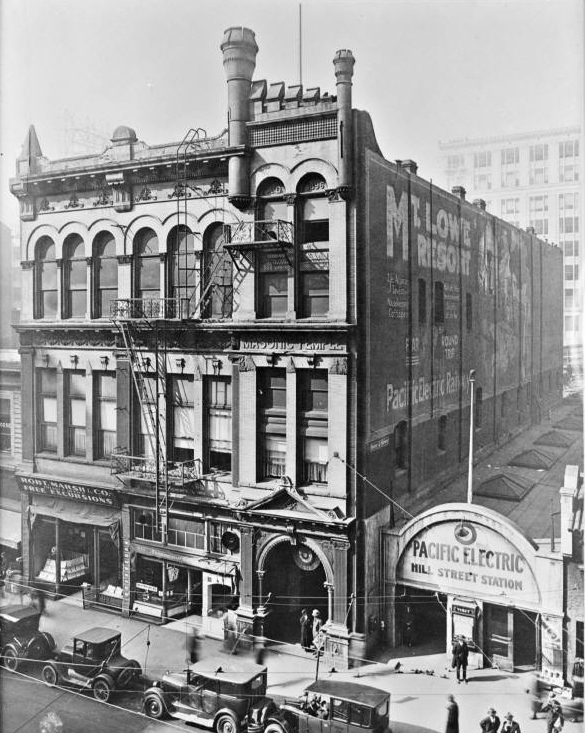 In 1921 the 1893-built Vogel Block would be demolished to make room for Loew's State Theatre (currently United Building). (ca. 1921)^^ – View of the Loew's State Building (Loew's State Theatre) at the southwest corner of Seventh Street and Broadway. Many streetcars can be seen operating here as thousands crowd into the theatre. (1922)^ - Exterior view of Loew's State Theatre building located at the intersection of Broadway and 7th Streets. Entrance to the theatre is on the left of this photo. Marquee reads: Now- Flapper week-Doris May in "Gay and Devilish." Occupants of the building also includes a dentist, Headquarters for Moore for Senator campaign, Star Shoe Co. and the Owl Drug. Co. The streets are crowded with pedestrians crossing and standing along the sidewalks. The Loew's State Theater is noted for the seated Buddha located in a niche above the proscenium arch. The exterior has an elaborate "silver platter" chased ornamentation above the ground story. (ca. 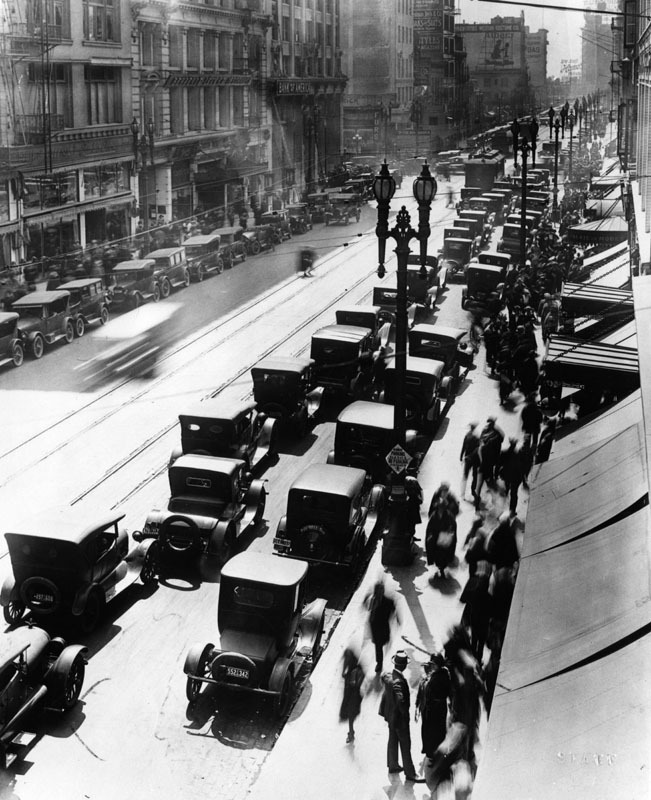 1922)^ - Cars are lined up in both directions on Broadway and pedestrians are numerous in this view of Broadway looking towards 7th St. On the corner of 7th (upper left side in the picture) is the Bank of America. (1922)^^ - Photograph (engineering notebook photoprint) taken at the head of 5th Street on Fremont Avenue looking east, showing possibilities of extending 5th Street through to Olive Street. The State Normal School is seen in the background where 5th Street would need to go through to complete the extension. In 1922 the State Normal School was demolished and 5th Street was straightened to run through the property. 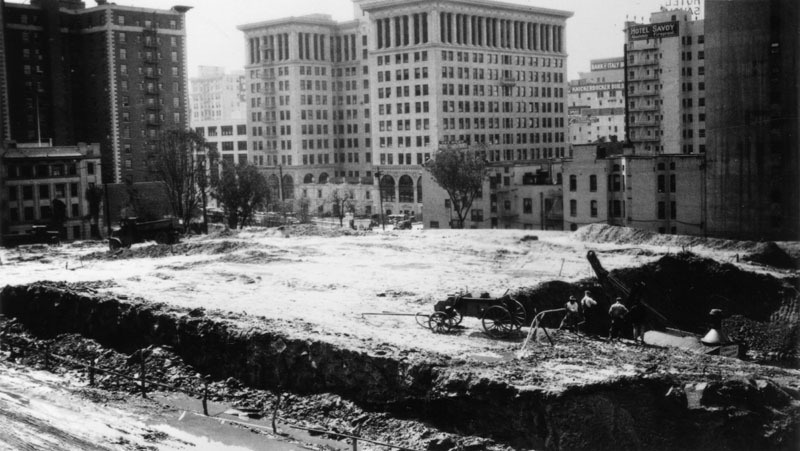 The remainder of the site was eventually occupied by the Los Angeles Central Library (1925). 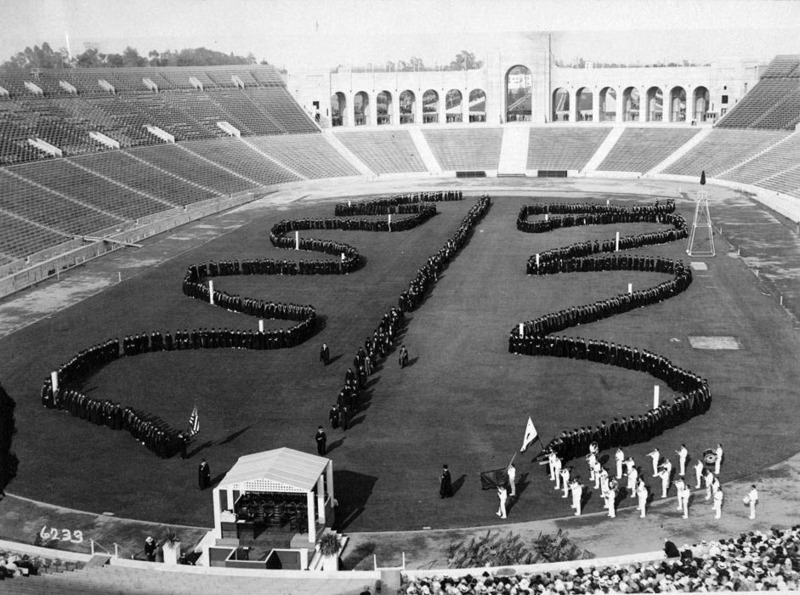 Click HERE to see the connection between the State Normal School and UCLA. 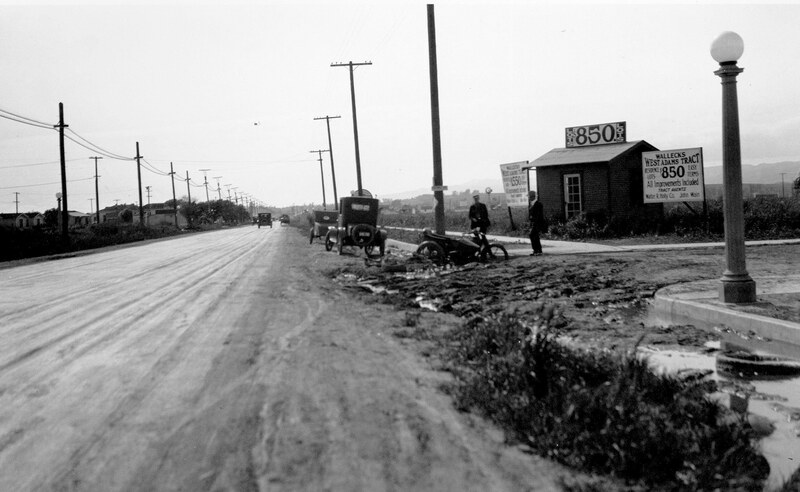 (1923)^ - An unpaved West 1st Street at Alvarado Street on January 10, 1923. The Alvarado Heights house lots are for sale for $3000 and up by Gillette Realty Co. Gillette Manor lots are also available. Other existing homes are in the distance. 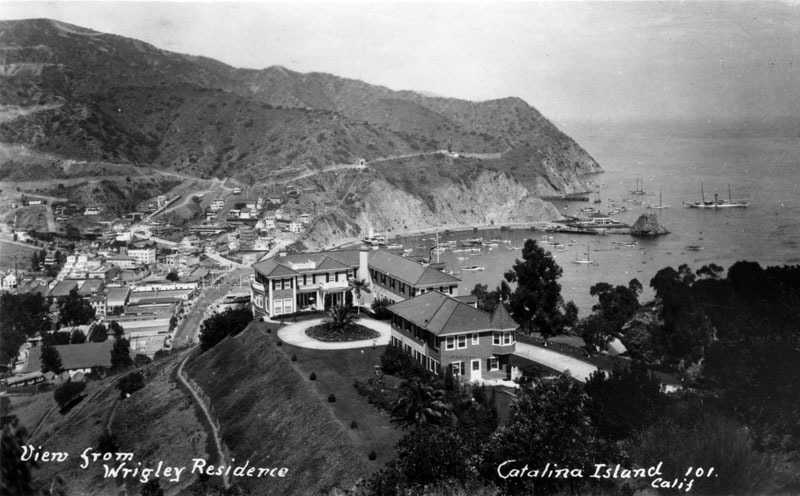 (1920s)^ - William Wrigley's two-story, L-shaped home rests atop a grassy hill, overlooking Avalon and beyond. Small houses as well as various tourist-oriented businesses, office buildings and several larger apartment complexes are nestled in the hills. The first Catalina Casino, Sugarloaf Rock, and numerous small boats are visible at the edge of the bay on the right, surrounded by the sea on three sides. William Wrigley, Jr. (1861-1932), chewing gum industrialist and founder of the William Wrigley Jr. Company, played an instrumental role in the history of Catalina Island. 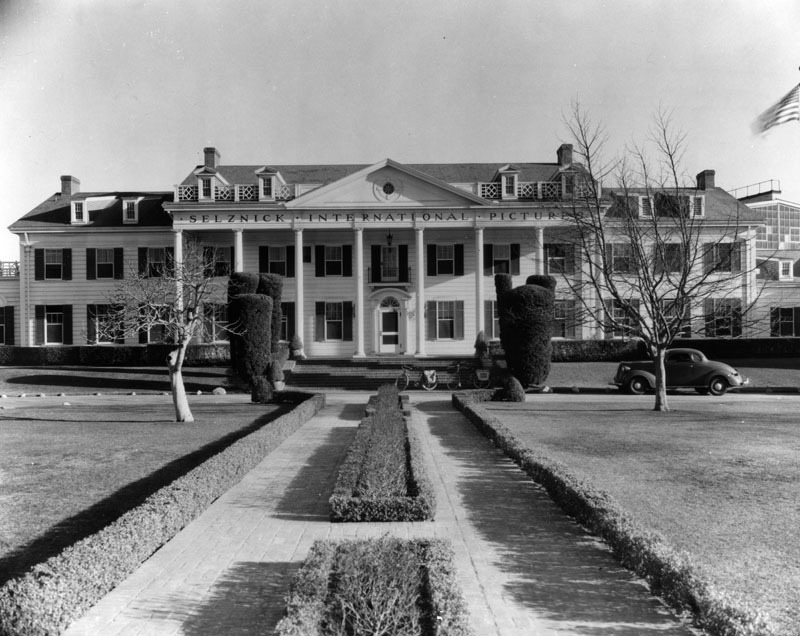 He bought the island from Joseph and Hancock Banning in 1919, and improved it with public utilities, new steamships, a hotel, the Casino building, and extensive planting of trees, shrubs, and flowers. Wrigley was the owner of the Chicago Cubs baseball team, which held its annual spring training on the island. (1920s)^ - View of Avalon Bay across Crescent Bay, on Santa Catalina Island as seen from a mountain top. 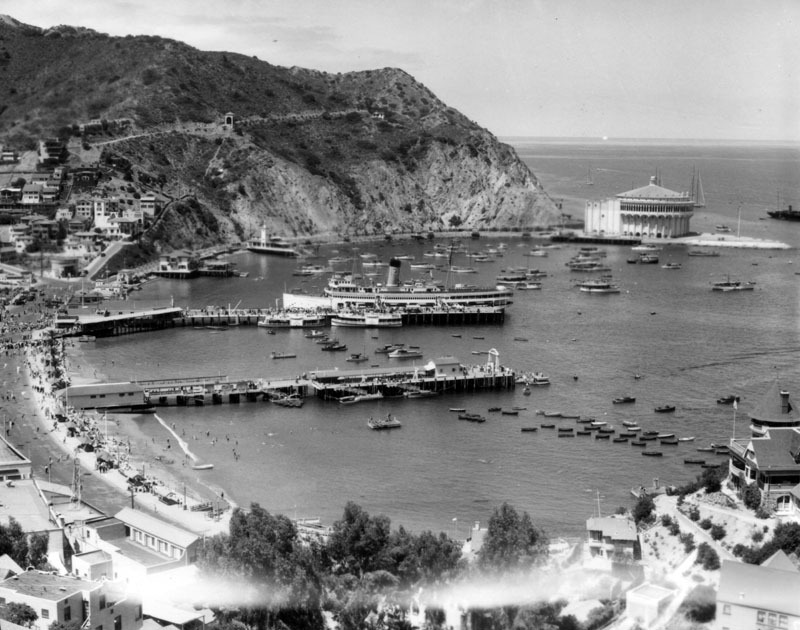 The Catalina Casino, surrounded by the sea on three sides, is visible at the edge of the bay on the right along with several boats along with the S.S. Catalina, "The Great White Steamer". 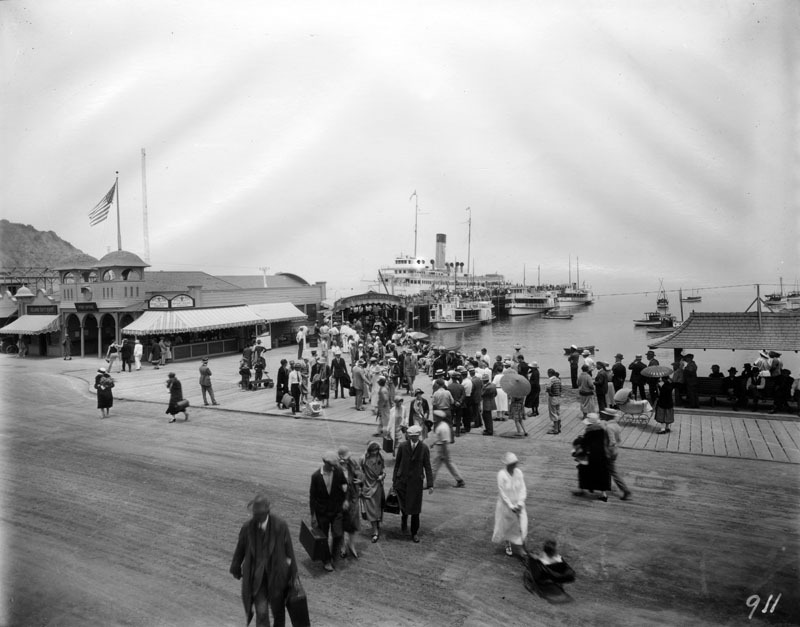 (1920s) - View of the dock, or ferry slip, which is full of passengers that appear to be unloading out of the S.S. Catalina, nicknamed "The Great White Steamer". Dozens of people wait for these travelers, making a pathway for them to walk through. The Post Office and Island Gift Shop can be seen on the left, and several small boats are visible to the right of the wharf. The S.S. Catalina has been recognized as a Historic-Cultural Monument, No. 213 (Click HERE to see the LA Historic-Cultural Monuments List) and also California State Historic Landmark No. 894 (Click HERE to see more California Historic Landmarks in LA). She was listed on the National Register of Historic Places in 1976. (1920s)^ - Partial view of the "first" Wrigley Field - home for the Los Angeles Angels of the Pacific Coast League. The bleachers are practically bursting at the seams with eager spectators cheering on their favorite teams. 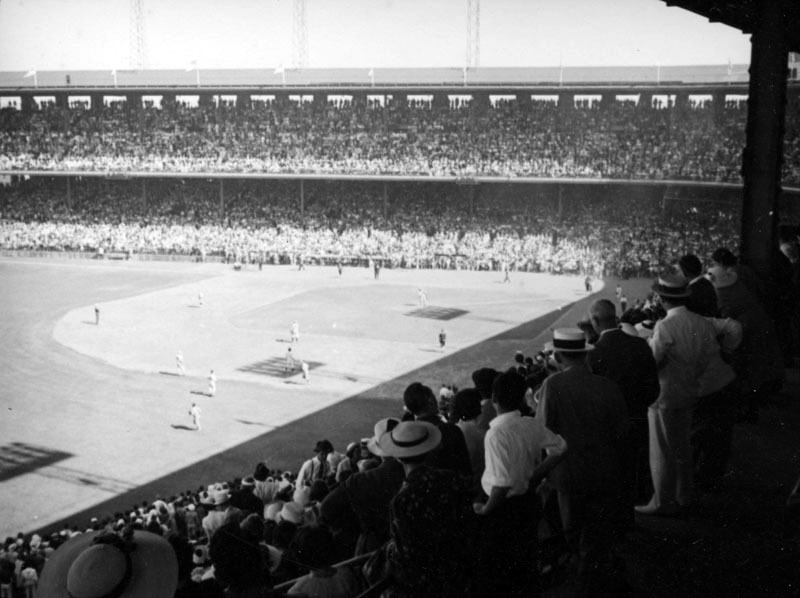 Wrigley Field, built on 10 acres of land in South Los Angeles between San Pedro Street (on the west), Avalon Blvd (to the east), E. 41st Place (to the north), and E. 42 Place (to the south), served as host to minor league baseball teams in the region for over 30 years, and was the home park for the Los Angeles Angels of the Pacific Coast League. Chewing gum magnate, William Wrigley, Jr. purchased the Angels in 1921 for the (then) astronomical sum of $150,000 and then built a stadium for the team a few years later. 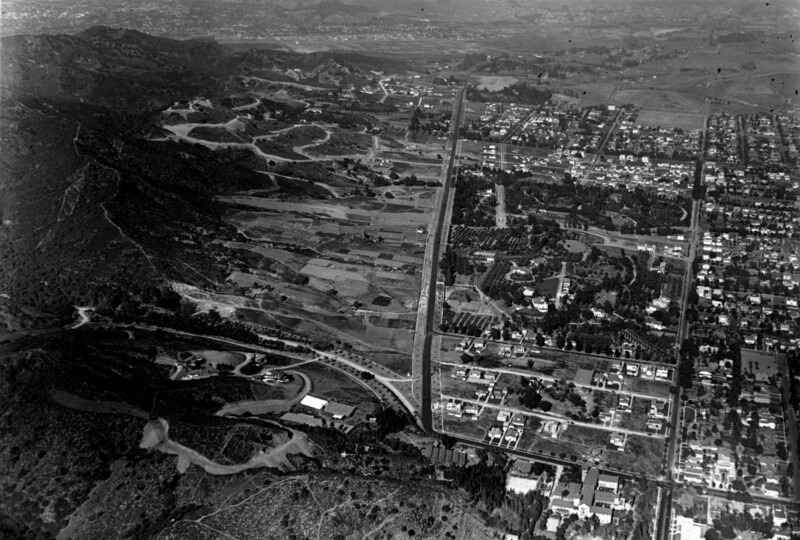 (1922)^ - Aerial view looking northwesterly showing Crescent Ave (later Fairfax Ave) running diagonally from lower-left to center-right where it crosses Wilshire Boulevard and makes a slight bend north towards the Hollywood Hills. San Vicente runs diagonally from lower-right to upper left and turns up toward West Hollywood. Note the oil wells scattered across the open land. 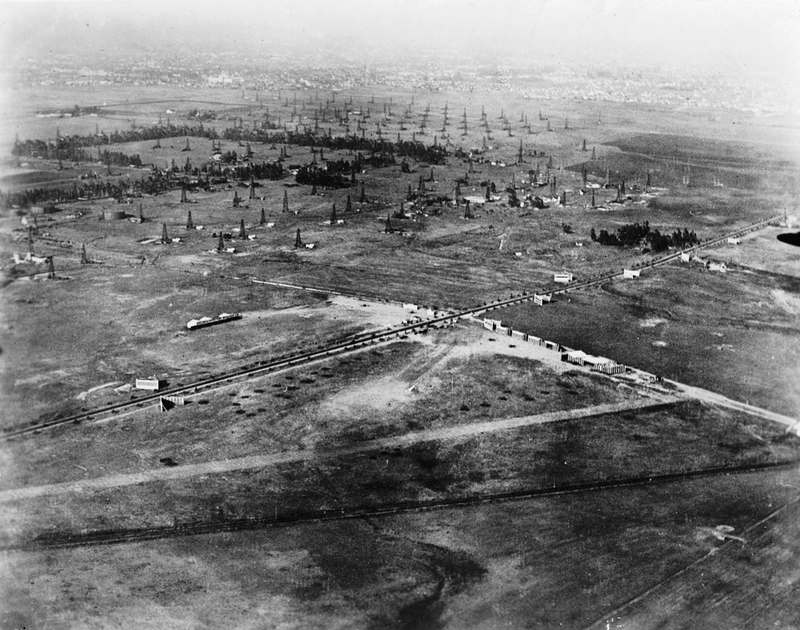 (1920)^ - Aerial view of Crescent Avenue (now Fairfax) and Wilshire Boulevard in 1920 showing undeveloped land with many oil derricks. In the lower part of the photograph is Chaplin Airport. The tree-lined street is Wilshire. The diagonal line at the bottom is actually railroad tracks that would later become San Vicente Bouelvard. Syd Chaplin was the brother of famed actor Charlie Chaplin. (1919)^* - Aerial view looking southeast showing crowds of people at Sid Chaplin's airport at the southwest corner of Wilshire Boulevard and Crescent Avenue (now Fairfax Avenue). 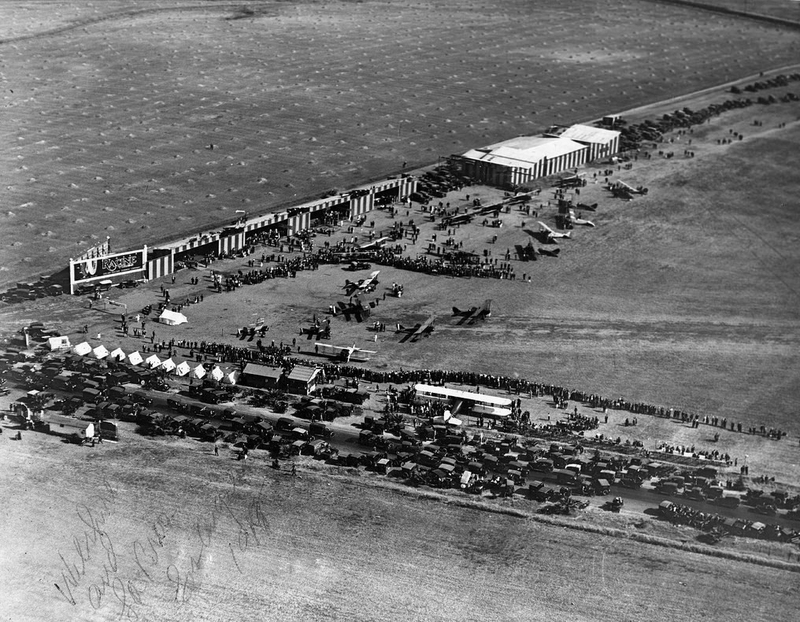 Dozens of cars are parked in rows in the foreground, with several airplanes parked behind them in the more open field. A vendor tent is visible farther up the image, near more parked cars. A billboard to the left reads "Racine Tires". 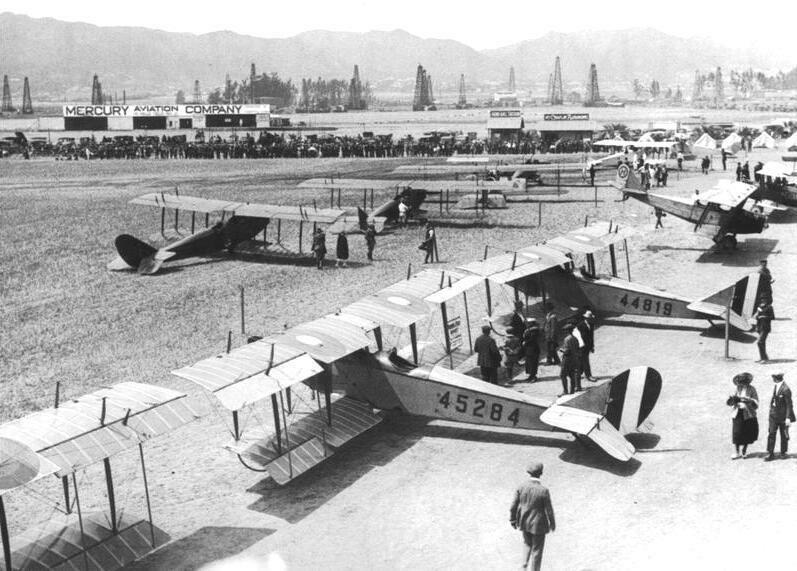 The Chaplin Aircraft Company offered observation flights for $10 and round-trip flights to San Diego for $150 (at a time when the average wage was $1,200 per/year). Obviously, the cost of air travel was very steep and Chaplin’s enterprise had a brief life span. Around 1920 Chaplin sold out to Emory H. Rogers, a business partner, who renamed it Rogers Field. 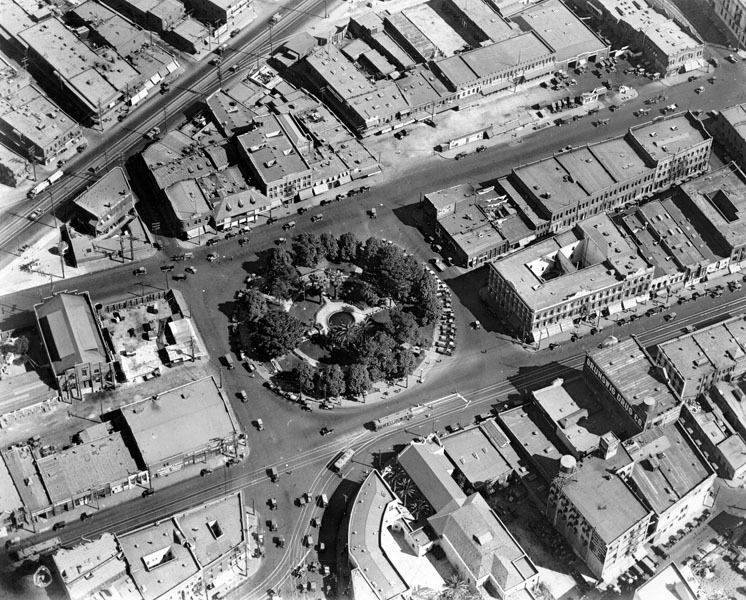 (1922)^^ - Aerial photograph, looking east, showing the intersection of Wilshire and San Vicente boulevards. San Vicente Boulevard is one of the few major streets in this area of Los Angeles that runs diagonally. 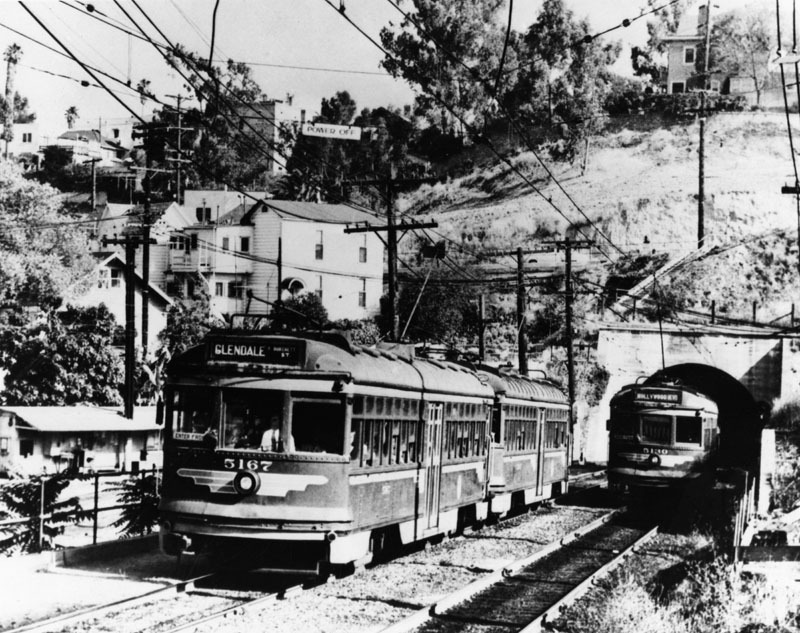 The main reason that San Vicente Boulevard runs diagonally as it does is because it was built on the Los Angeles Pacific Electric Railway Right-of-way in the early 1900s. Named for the Rancho San Vicente y Santa Monica that had previously occupied the area, it begins at Venice Boulevard between Crenshaw Boulevard and La Brea Avenue and travels in a northwesterly direction towards Beverly Hills. The roadway splits into two streets past La Cienega Boulevard, with the western branch becoming Burton Way, which eventually becomes Santa Monica Boulevard South and connects directly to downtown Beverly Hills. San Vicente Boulevard itself continues north into West Hollywood and ends at Sunset Boulevard. 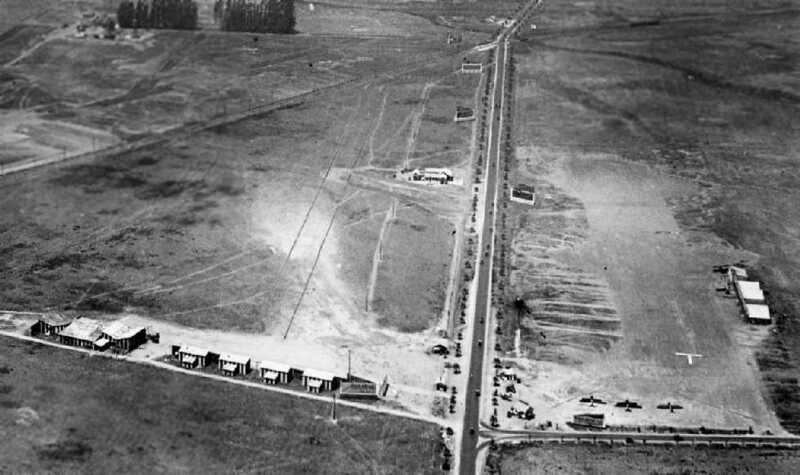 (1922)^ - Aerial view of Carthay Center, looking west across field of the first Rogers Airport at Wilshire Boulevard and Fairfax Avenue (lower right of photo). Wilshire Boulevard is the tree-lined street seen in the center of the image. The diagonal line running from lower left to upper right is the San Vicente line of the Pacific Electric Railway, later to become San Vicente Boulevard. 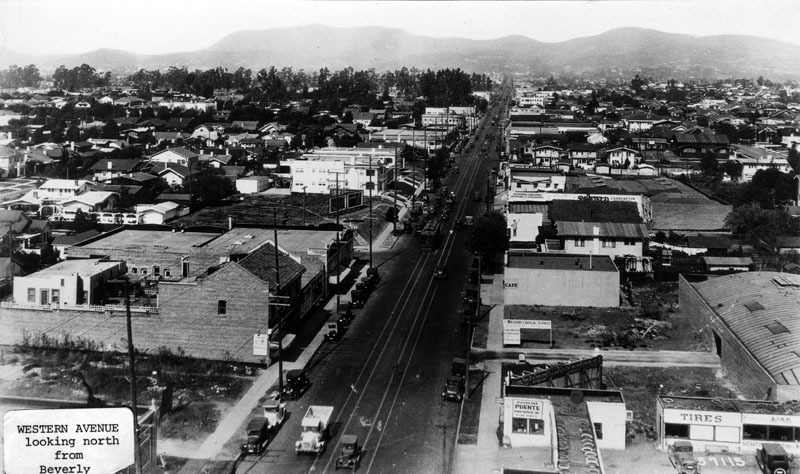 (1922)*#*# - View looking west over Wilshire Boulevard at Crescent Avenue (later Fairfax Ave). 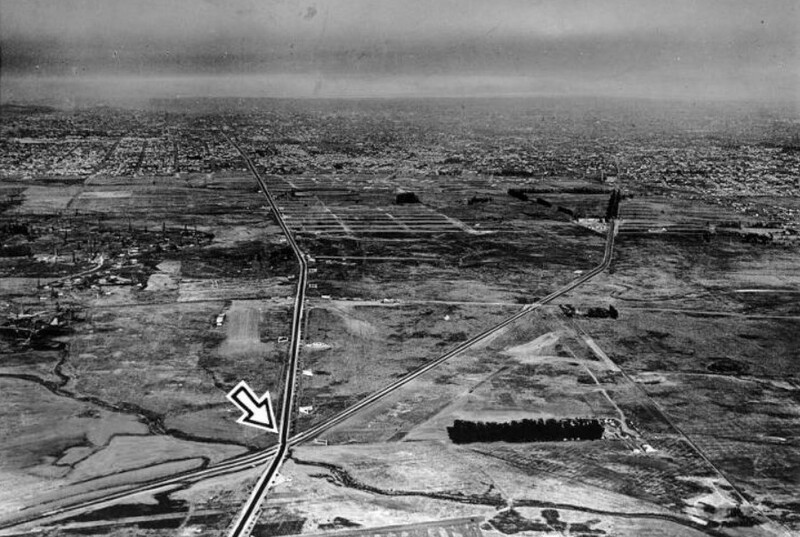 Rogers Airfield (previously Chaplin Airfield and DeMille Airfield No.2) can be seen straddling Wilshire Blvd at center of photo. Crescent Ave (later Fairfax Ave) runs horizontally at bottom. 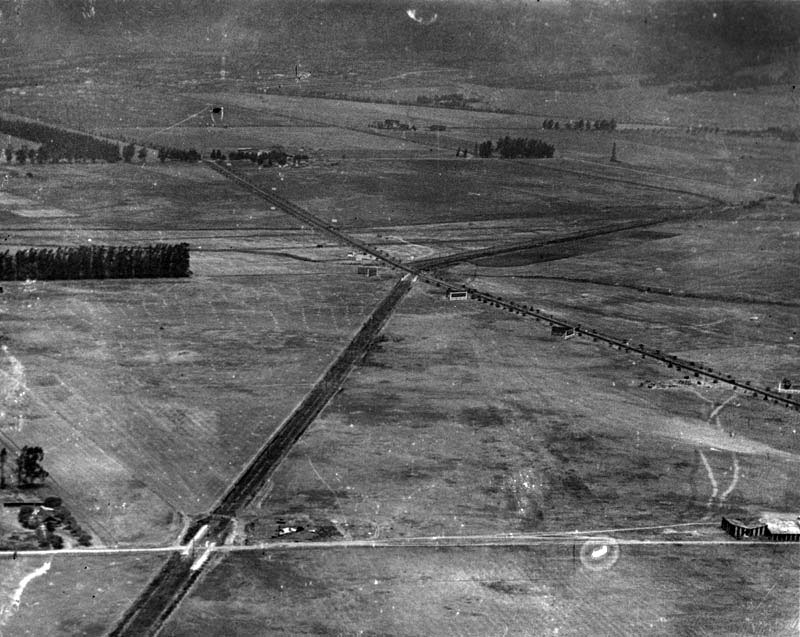 The diagonal line (upper-left) are railroad tracks (today, San Vicente Boulevard). (ca. 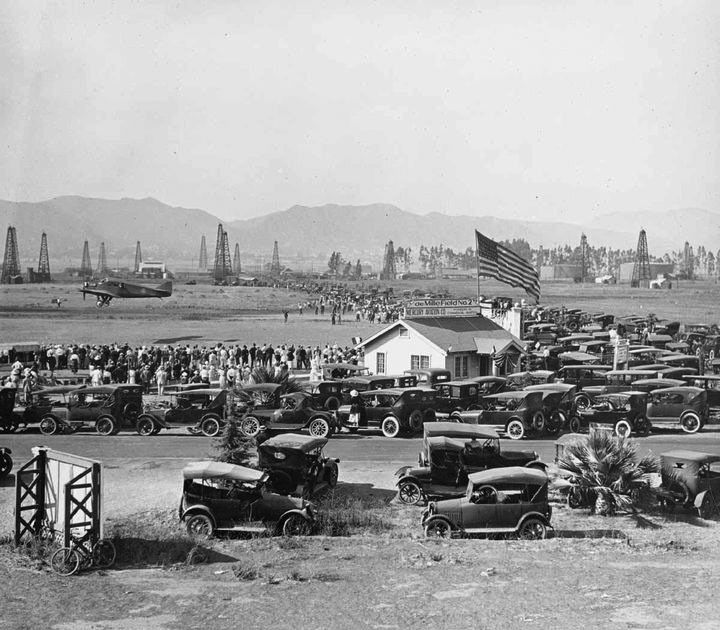 1920)^#^# - Parking lot is full as crowds attend air show at DeMille Field No. 2. The sign on top of the structure with the large American Flag reads: DeMille Field No. 2. View is looking northeast near the NW corner of Wilshire and Fairfax. (ca. 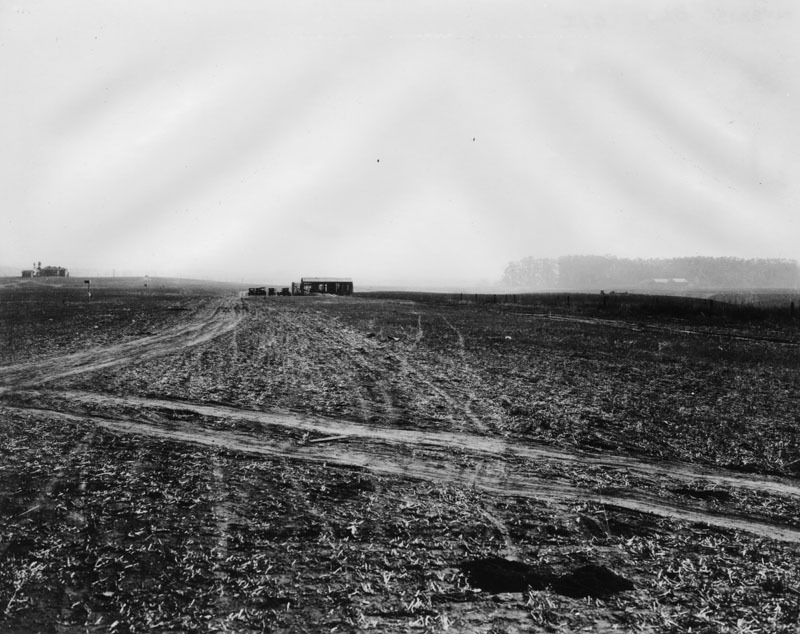 1922)^^#^ - Ground view of Rogers Airfield (previously DeMille Field No. 2) on the northwest corner of Fairfax and Wilshire. The Mercury Aviation Company sign can be seen on a hangar in the upper left of photo. The oil derricks seen in the background are part of the Salt Lake Oil Field. In the 1890s, dairy farmer Arthur F. Gilmore found oil on his land, probably in the vicinity of the La Brea Tar Pits. The field was named after the Salt Lake Oil Company, the first firm to arrive to drill in the area. The discovery well was spudded (started) in 1902. (ca. 1922)^##* - View looking north over the wing of a plane showing the intersection of Crescent Ave (Fairfax) and Wilshire Blvd. A crowded airfield is seen below. In the distance oil derricks straddle Fairfax where 6th Street is located today. In the far background at the foothills can be seen a built-up Hollywood. 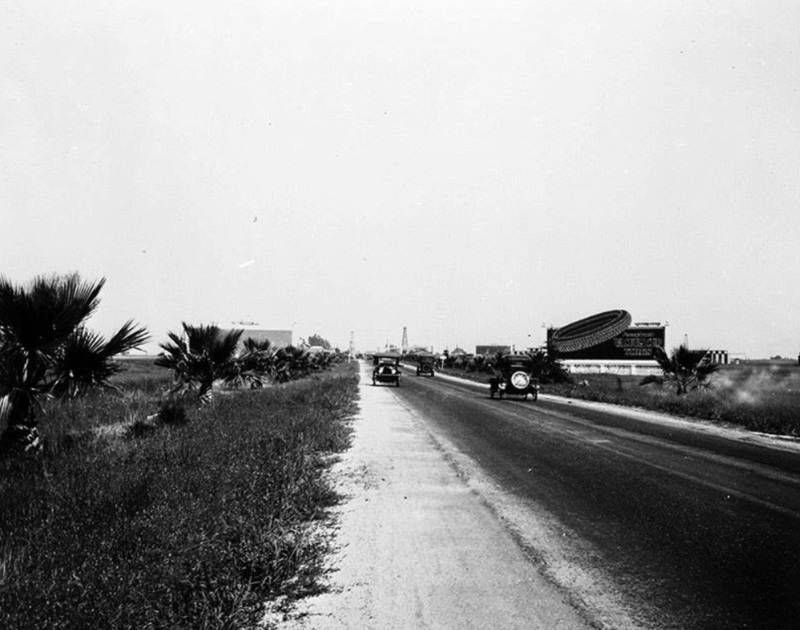 (1920)+^^ – View looking east on a two-lane Wilshire Boulevard from near La Brea Avenue. Signboards, open fields, and oil derricks are about all you can see. (1922)^ - Aerial view looking north of Wilshire at La Brea. Oil wells may be seen in the area and residential homes in the distance. (ca. 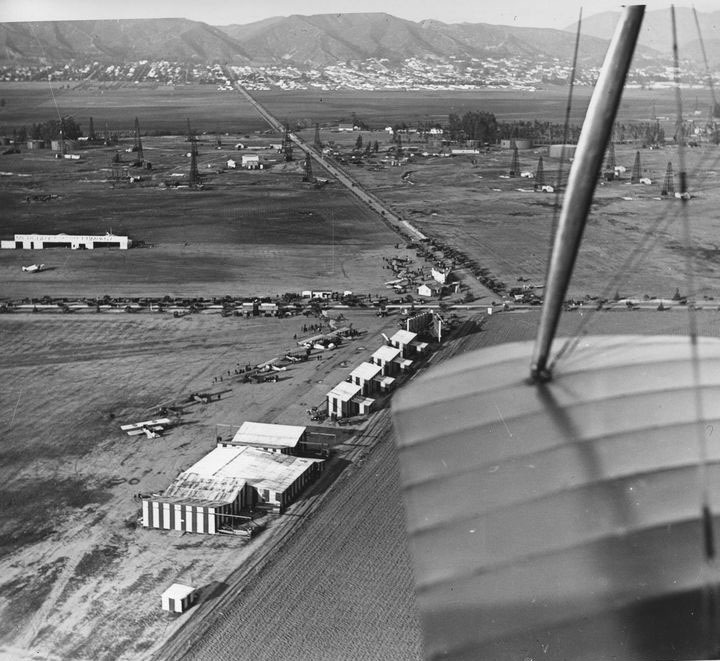 1922)^##* - View looking north shows numerous cars parked on a lot (center of photo) near the airfield as well as along Wilshire Blvd. and Crescent Ave (Fairfax). Large sign on building in the lower-right center at the intersection of Fairfax and the San Vicente line of the Pacific Electric Railway reads: Albers Oats. (1922)^^ - Aerial view of Santa Monica Boulevard looking northeast from Sherman (now, West Hollywood). The buildings in the bottom-left stand at the present-day site of the Pacific Design Center. Santa Monica Boulevard runs left-right, intersecting with Holloway Drive at roughly the center of the photograph. Hollywood is visible in the top-right. Click HERE to see more Early Views of the Town of Sherman and West Hollywood. (n.d.)* - Residential neighborhood near Santa Monica Blvd. and Gardner Ave. A house with greenery on each side is in the foreground and the background shows additional houses, trees and open spaces. (1922)^ - Aerial view overlooking Westwood. Photo dated: 1922. 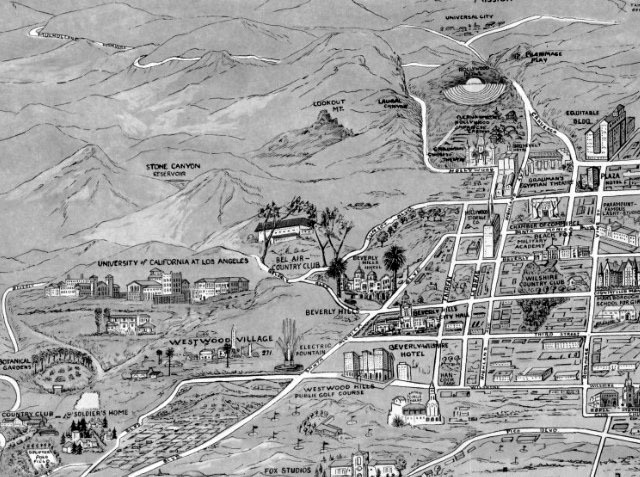 Click HERE to see more of Westwood and UCLA in Early Views of UCLA. (ca. 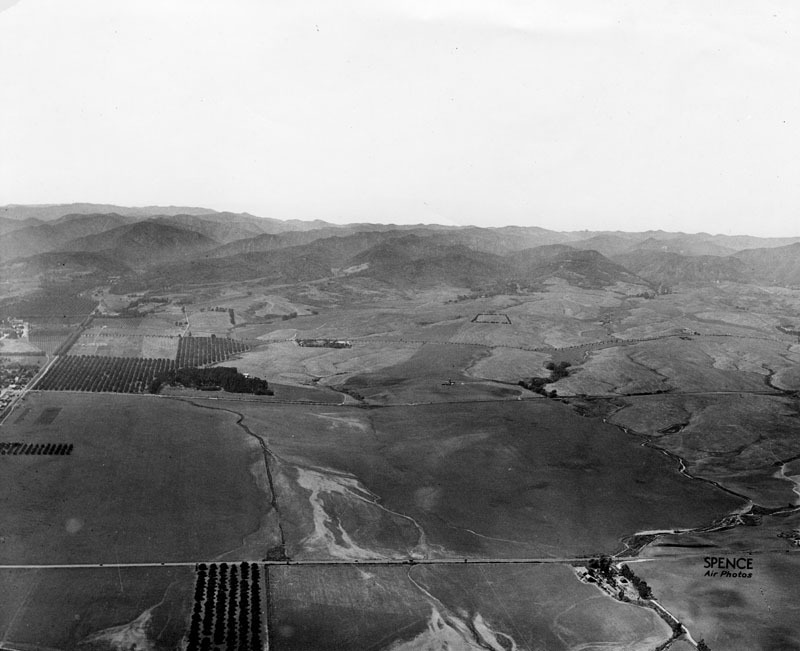 1925)^ - View of part of the old Wolfskill Ranch, also known as the Rancho San Jose de Buenos Aires. The house, shown here on the extreme left, occupied the present corner of Wilshire Boulevard and Beverly Glen, and UCLA occupies part of the rancho. 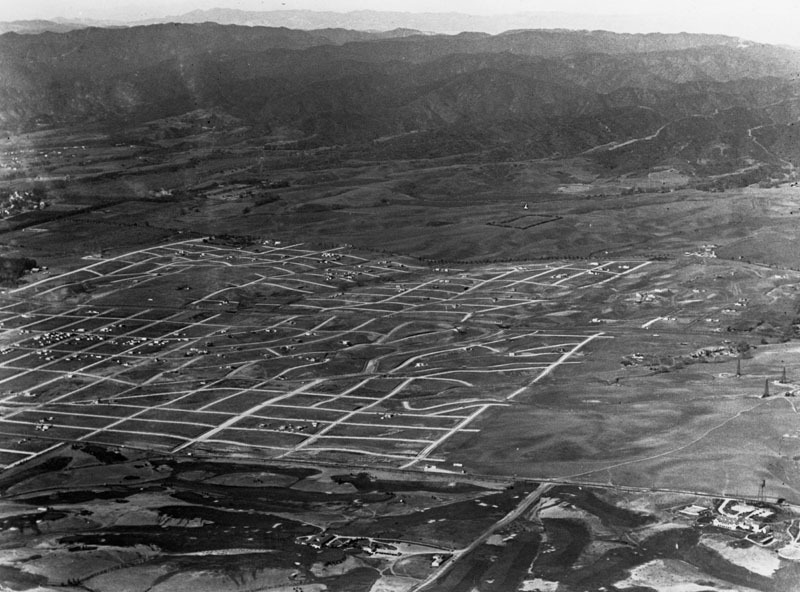 (1922)* - Aerial view of Westwood and surrounding area looking north. Santa Monica Boulevard runs horizontally at bottom of photo while a tree-lined Wilshire Boulevard runs from left to right at center. 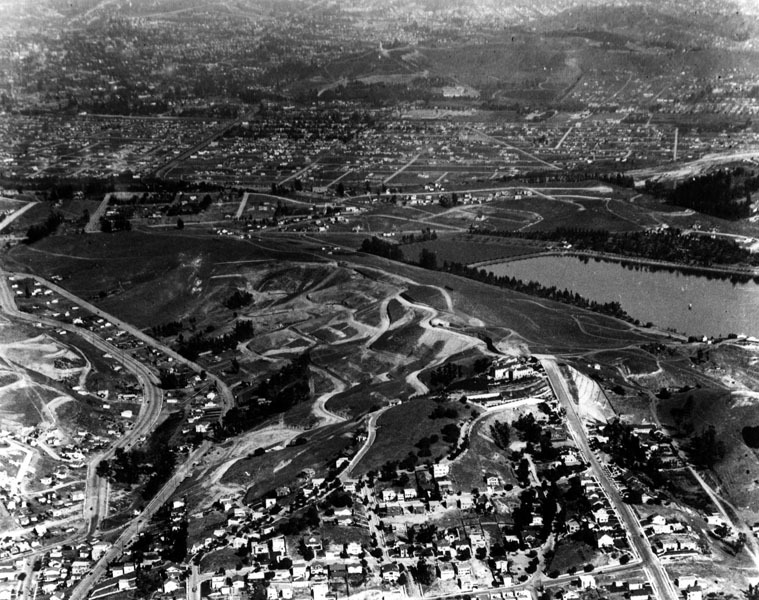 Beverly Glen, not yet constructed here, will run from lower-left, under Santa Monica Boulevard bridge, up north to the Wolfskill ranch house (seen at center-left) on Wilshire Boulevard. 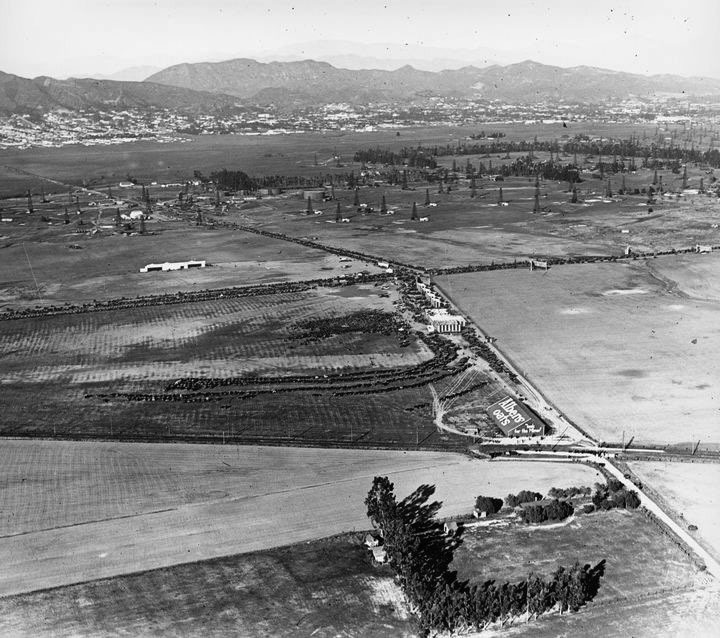 The view above, from about the time of the Letts purchase, shows the land with the Wolfskill ranch house (center left), located on what is today the northwest corner of Wilshire Boulevard and Beverly Glen. 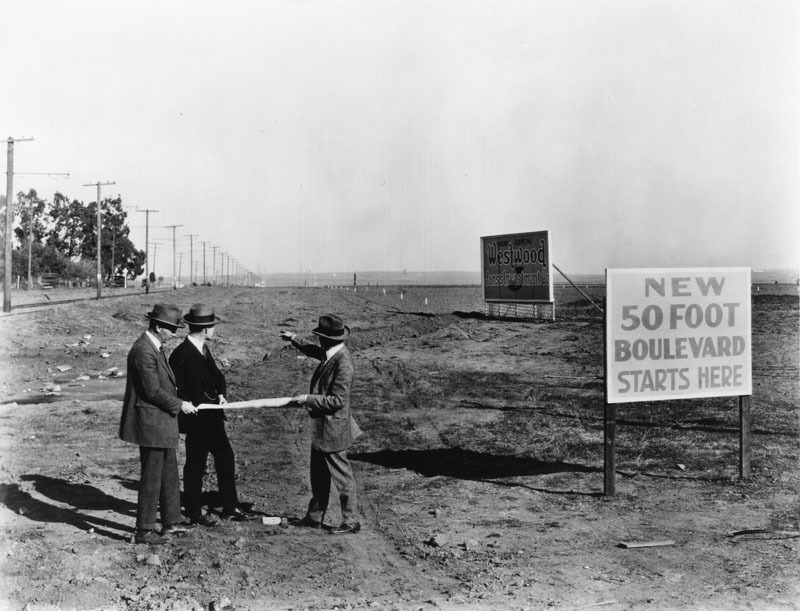 (1922)^ - Three men with plans in hand examine the area to become Santa Monica Boulevard. 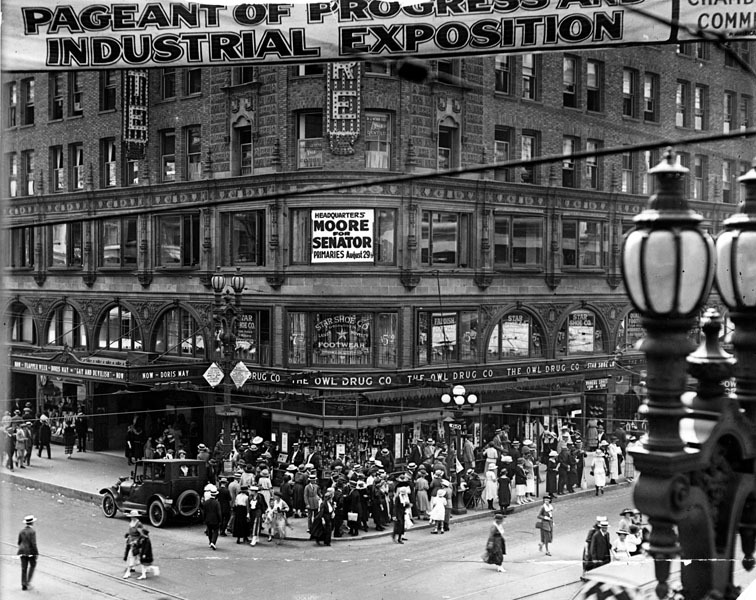 Taken in 1922, the photo also shows a billboard announcing Westwood, now open, by Janss Investment Co., in addition to the sign reading, "New 50 Foot Boulevard Starts Here." Harold Janss of Janss Investment Company, Arthur Letts son-in-law, was more interested in middle-class homes, as opposed to estates. He started with the southern part of the parcel, diverted the springs into underground pipes, filled in the streams and platted 1,000 home and business lots in a development he named Westwood Hills. "Janss Investment Company" was stamped repeatedly in the wet concrete of the sidewalks. It was known as a "country district". Many families bought three house lots, particularly south of the P.E. tracks, where they were cheaper, using the extra space to grow vegetables and raise chickens and rabbits. Some wealthier homeowners added a tennis court to one extra lot and a swimming pool to the other. Homes had fireplaces for heat and backyard incinerators for trash. With rising land prices after WWII, most of these extra lots were sold off for new houses. One can still notice the pattern in the ages of the homes. 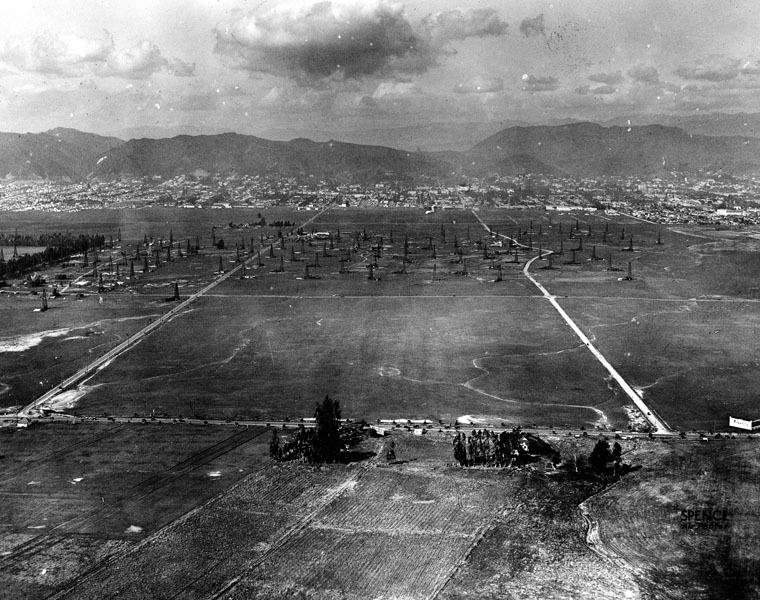 (1924)^ - View of the new development reaching from Wilshire on the north to Pico on the south and from Westwood Blvd on the west to Fox Hills Drive on the east, with a further small section running SW from Patricia and Pico. The large empty parcel, upper left, within the platted area is the Wolfskill ranch house, on the P.E. route, at the T-junction with Overland Ave, standing alone on twenty-five plus acres. The Harold Lloyd Motion Picture Company's Westwood studio ranch occupied this site a bit after this photo was taken. The northern portion was sold off to build the Saint Paul the Apostle RC church and school circa 1930. Lloyd's declining fortunes caused him to sell the rest to the LDS church in 1937. The church finally built the LDS Temple there in 1956. The community of Bel-Air was founded in 1923 by Alphonzo Bell. 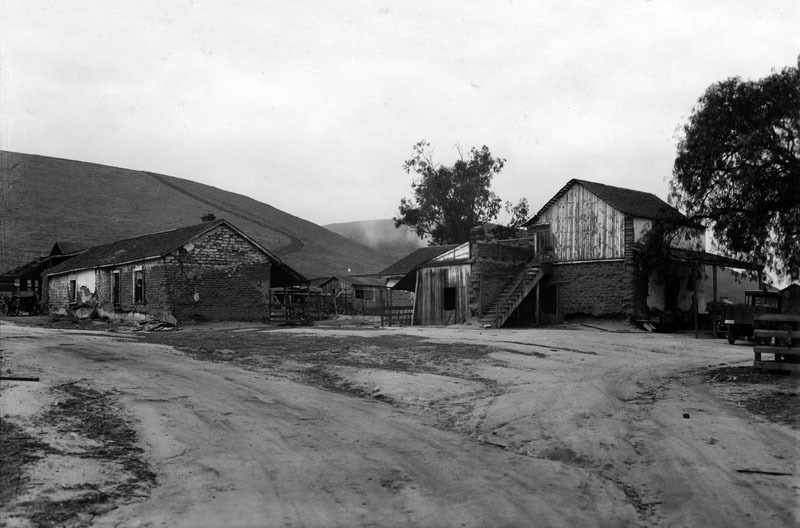 Bell owned farm property in Santa Fe Springs, California, where oil was discovered. He bought a large ranch with a home on what is now Bel Air Road and then subdivided and developed the property with large residential lots. He also built the Bel-Air Bay Club in Pacific Palisades and the Bel-Air Country Club. His wife chose Italian names for the streets. She also founded the Bel-Air Garden Club in 1931. 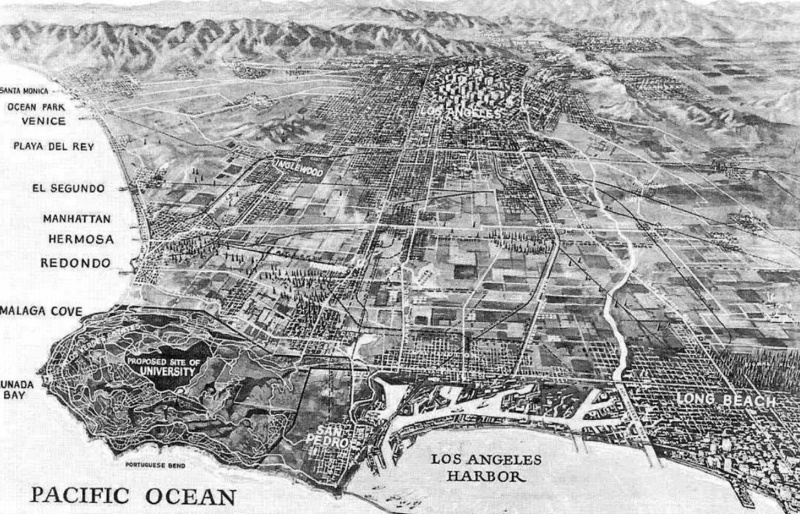 (1921)^ - An aerial view of the Bel Air district of Los Angeles. Shown are the Danziger, Bell and Chester Kent estates. 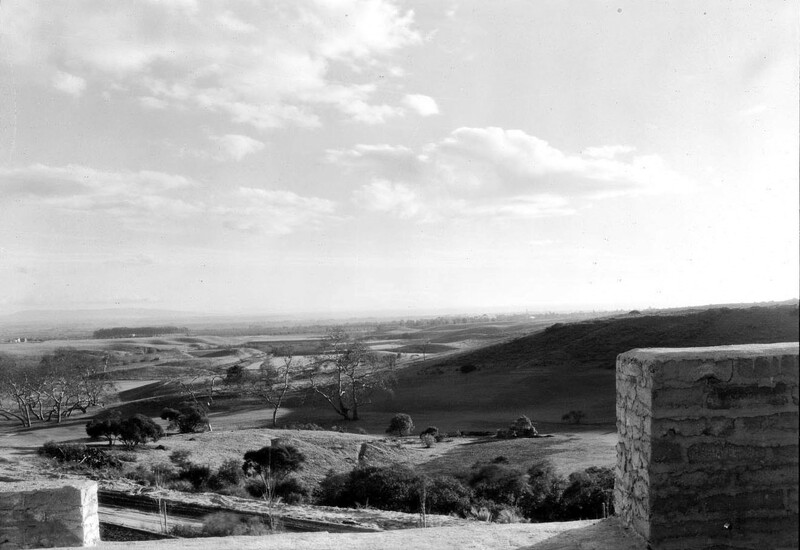 (1927)^^ – A rural view from the home of Arthur S. Brent in Bel Air. A break in the stone fences in the foreground reveals the view of the thin, dirt road below. Small trees line the road while much larger trees stand in the open grass fields which blanket the rolling countryside as it extends into the distance. 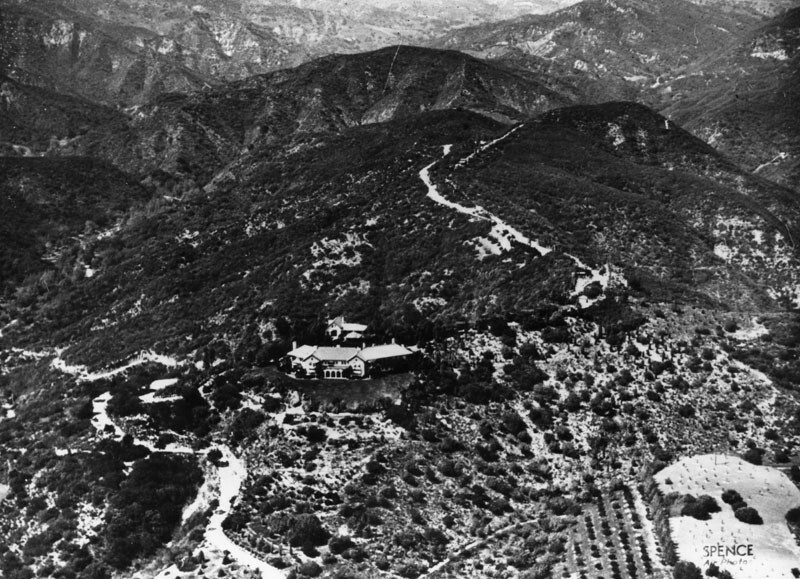 (1929)^ – View looking southeast as seen from the hills of of Bel-Air. Oil derricks can be seen in the distance, near where Centruy City is today. 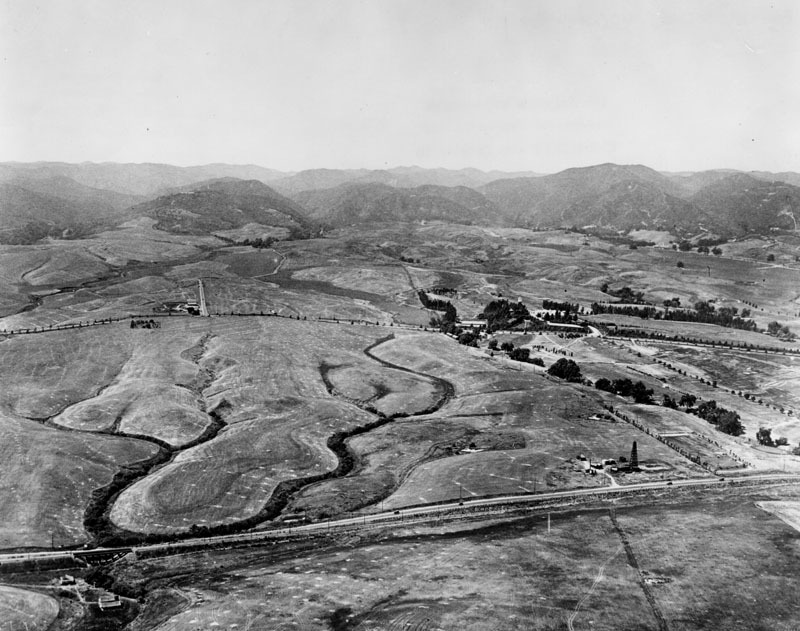 (1930)* - A panoramic view of the UCLA Westwood campus, shortly after it opened in 1929. View is looking from the golf course of the Bel-Air Country Club. The body of water shown is the Sawtelle Reservoir. The twin towers of Royce Hall are seen in the middle of this photo. (1931)*^#^ – Right panel of a panoramic photo of Bel-Air. View is looking south showing the UCLA campus and Westwood in center-right. 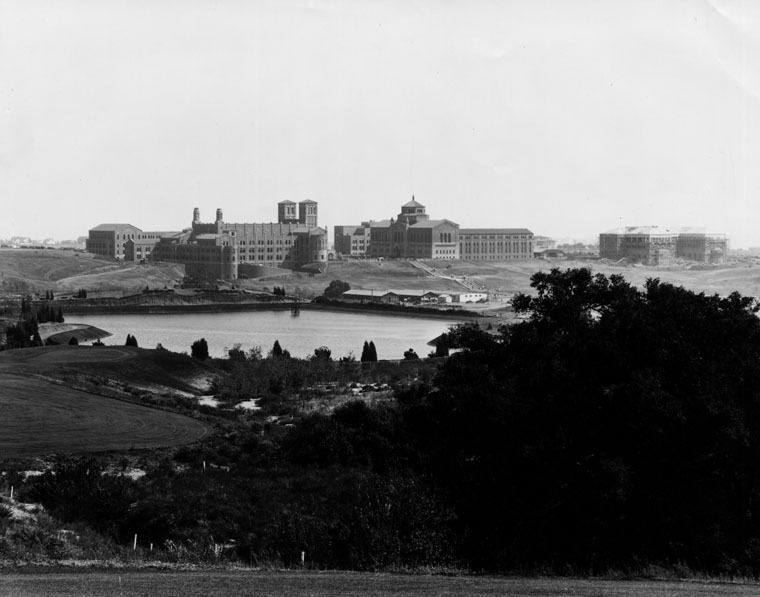 The large body of water is the Sawtelle Reservoir and the long two-story building behind it is Marymount College. (1931)*^#^ – Left panel of a panoramic photo of Bel-Air. View is looking northeast showing the Bel-Air Country Club on the left. 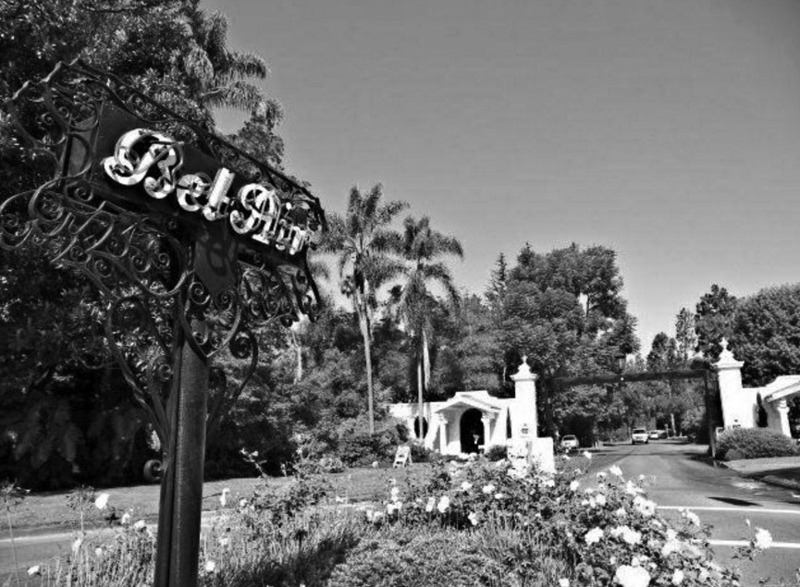 The Bel-Air Country Club was started by Alonzo Bell as a social club. It inlcuded tennis courts and an 18-hole golf course designed by famed golf architect, George C. Thomasand (also designed the Riviera Country Club in 1927) . (ca. 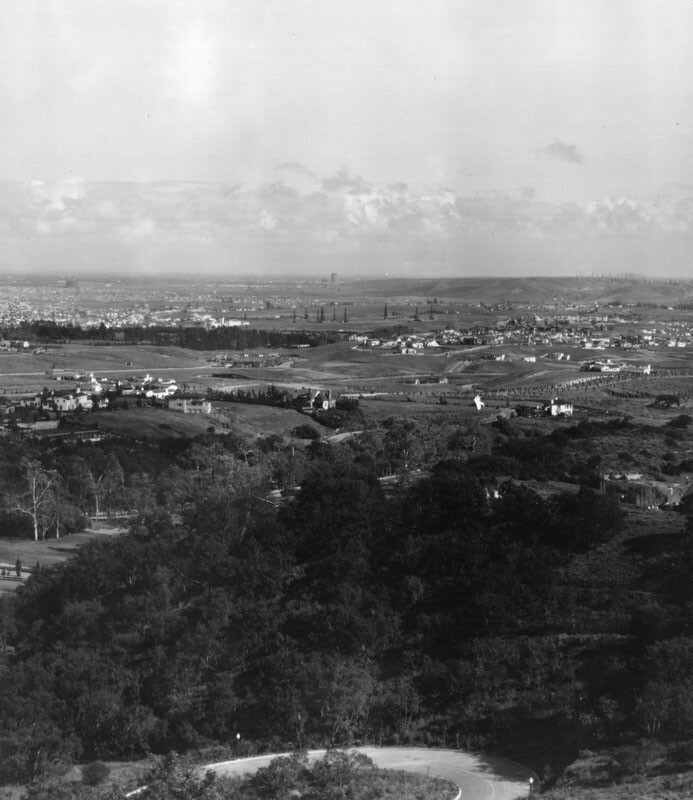 1930)^^ - Photograph of a panoramic view of a golf course at the Bel-Air Country Club. A caddie can be seen holding up a flag to the left of the center; the flag is labelled with a number "10". A man is observable to the right of the center, dressed in traditional golf clothes. A group of men is visible in the right side, either sitting on a hillside or appearing to be walking towards the sitting men; they are located just behind the first man. Further back to the left, a bridge can be seen that leads to the patio of a large house which is visible in the background. Additional large houses can be seen farther in the back sitting on a series of hills and surrounded by vegetation. 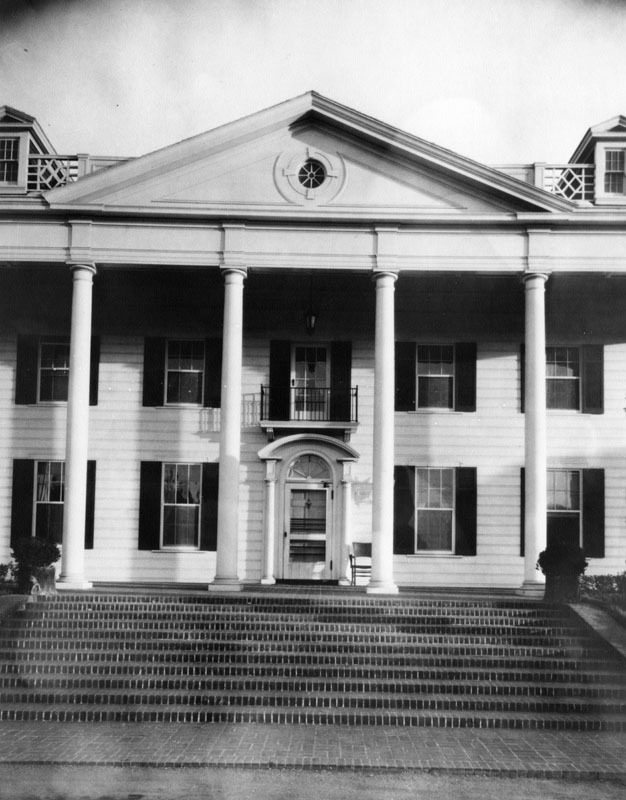 (1926)^^ – Close-up view of the Bel-Air Country Club showing a bridge ("The Swinging Bridge") leading to the club house. (ca. 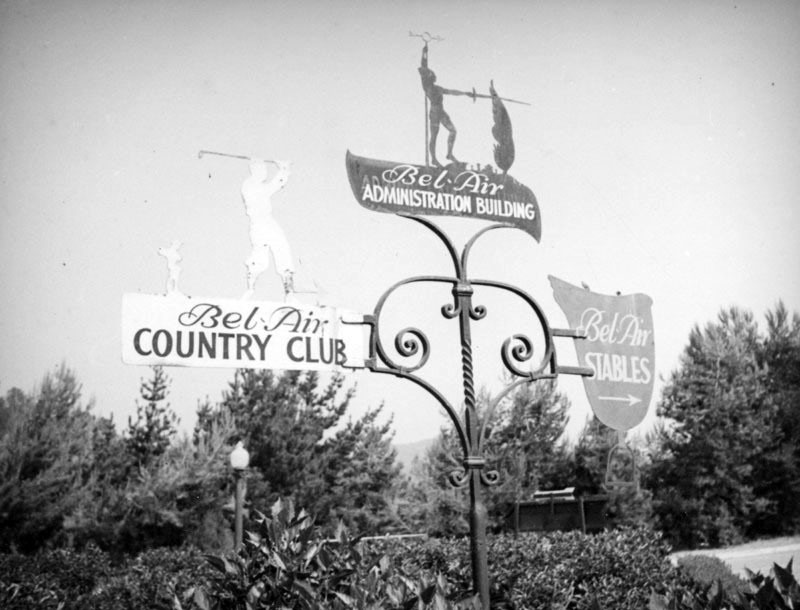 1937)^ - Decorative signs point the way to Bel-Air Country Club, Bel-Air Administration Building, and Bel-Air Stables. (1932)**++ - Map showing Bel-Air, Bel-Air Country Club (center of photo) and adjacent communities. Together with Beverly Hills and Holmby Hills, Bel-Air forms the Platinum Triangle of Los Angeles neighborhoods. 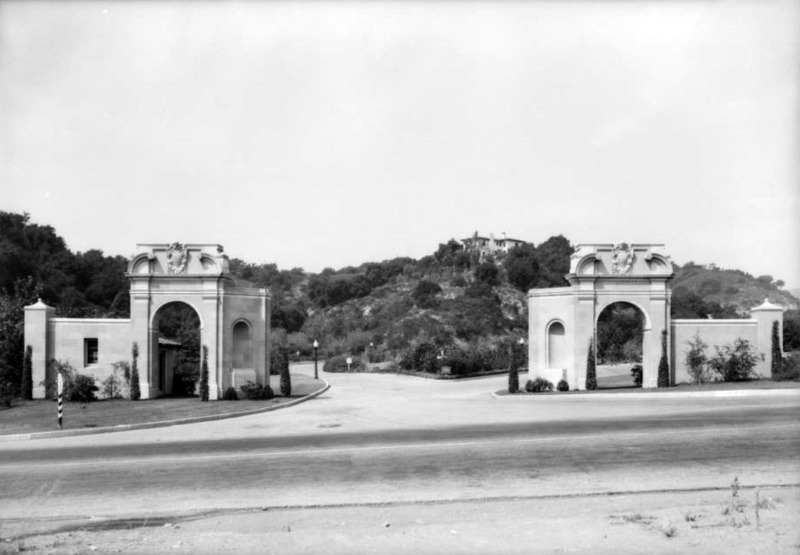 (1932)^^ – View showing the newly contsructed Sunset Gate (aka West Gate) entrance to Bel-Air, 10951 Sunset Boulevard. Click HERE to see contemporary view. 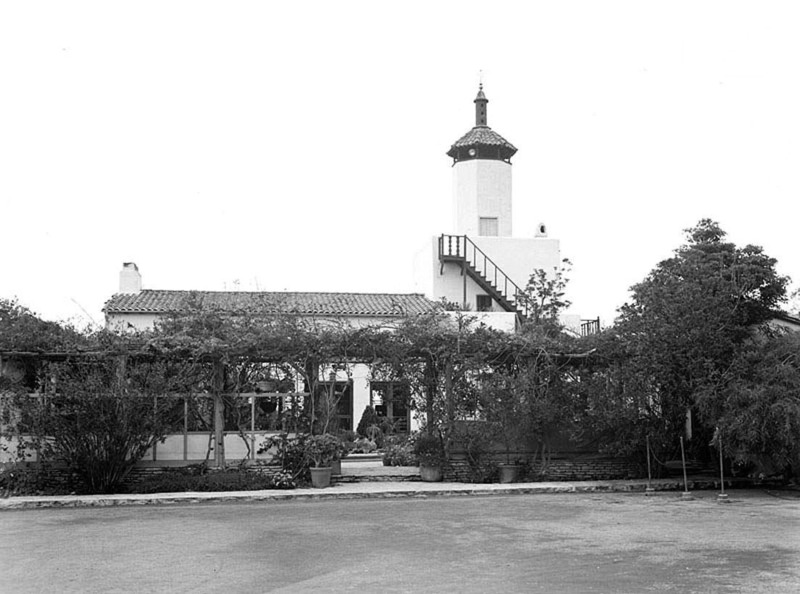 (1932)^^ – Profile close-up view showing the Sunset Gate (aka West Gate) at Bellagio Drive and Sunset Boulevard. (Early 1920s)^ - A couple can be seen relaxing and enjoying a nice sunny day as their canopied boat floats across Lincoln Park (Eastlake Park) lake, its surface giving a lovely reflection of the trees in the surrounding area. Several people can be seen on shore at the other end of the lake. (1924)^ - Aerial view of the Selig Zoo. The zoo's entrance is marked by the two arches (right of center), where N. Mission Road (running from upper left to lower center) meets Selig Place (running right center to lower center). This was originally opened as a private zoo in 1885 in downtown Los Angeles. In 1911 William Selig opened a zoo on the northern edge of Eastlake Park, and this became one of the main attractions; in 1914 a carousel was added, which drew 150,000 riders a year; and a short while later, an arboretum was erected on the premises that housed a large greenhouse (hothouse) with rare and exotic plants. On April 21, 1976 the carousel was designated Historic Cultural Monument No. 153 by the City of Los Angeles, but was destroyed just a few months later. Click HERE to see the LA Historic Cultural Monuments List. 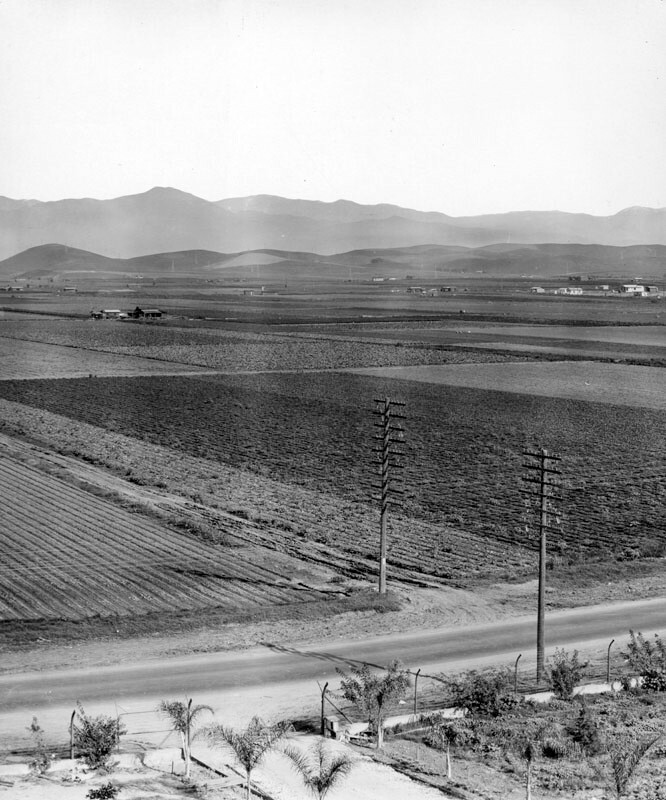 (1921)^ - Left panel of a panoramic photo of East Los Angeles, revealing the large agricultural fields that once existed throughout the community. The view is looking north from Whittier Blvd near Atlantic Blvd. A partial view of a billboard for Silverwood’s is seen to the right of this panel; the other half of the billboard can be seen on panel 2. 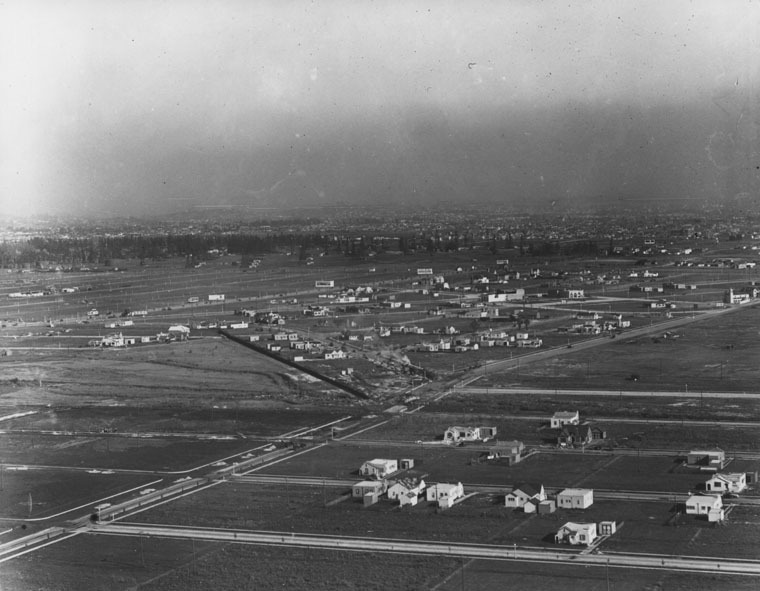 (1921)^ – Center panel of a panoramic photo looking north from Whittier Blvd near Atlantic Blvd showing agricultural fields in East Los Angeles, with a small cluster of homes scattered in the background. A partial view of a billboard is seen to the left of this panel; the other half of the billboard can be seen in the previous photo. 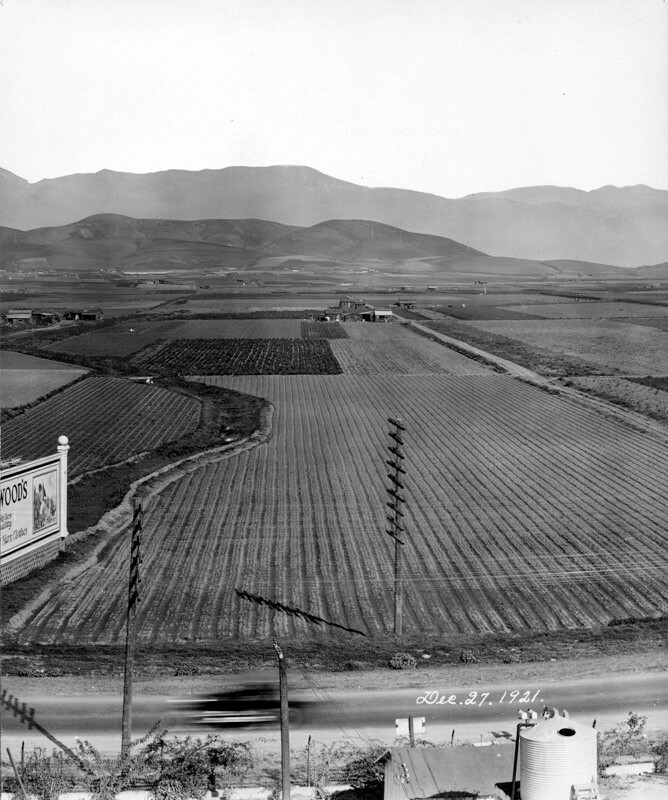 (1921)^ - Right panel looking north from Whittier Blvd near Atlantic Blvd showing a wide open area of agricultural fields. (1922)^ - Passengers getting on streetcar at Santa Monica Boulevard and Gower Street. 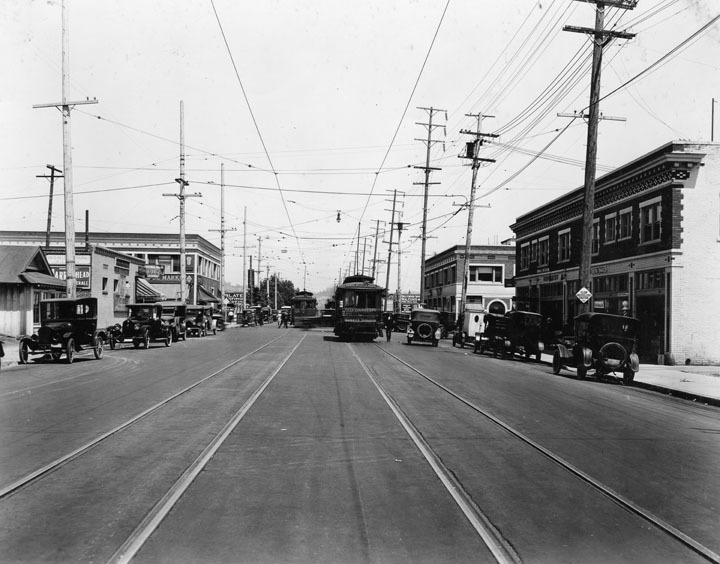 (1922)^ - View of two streetcars running down the center of Santa Monica Boulevard near Western Avenue. 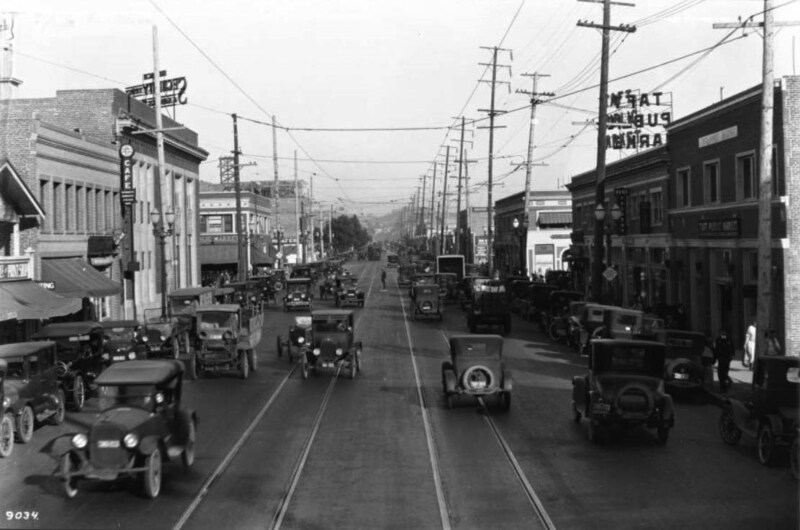 (1920s)^ - View of Western Avenue looking north at its intersection with Santa Monica Boulevard. The Security Trust & Savings Bank Building is on the left hand side; billboards and businesses are across the street. Mt. Lee, tallest peak in the Hollywood Hills, can be seen in the distance. 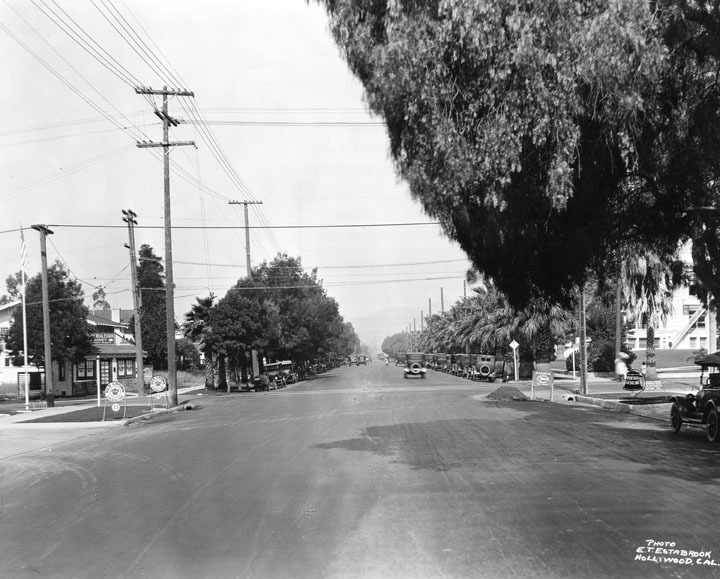 (1923)^ - View of the intersection of Western Avenue and Santa Monica Boulevard. Pedestrians are seen crossing the street despite the heavy traffic. Note the sporty roadster convertible heading north on Western Ave.
(ca. 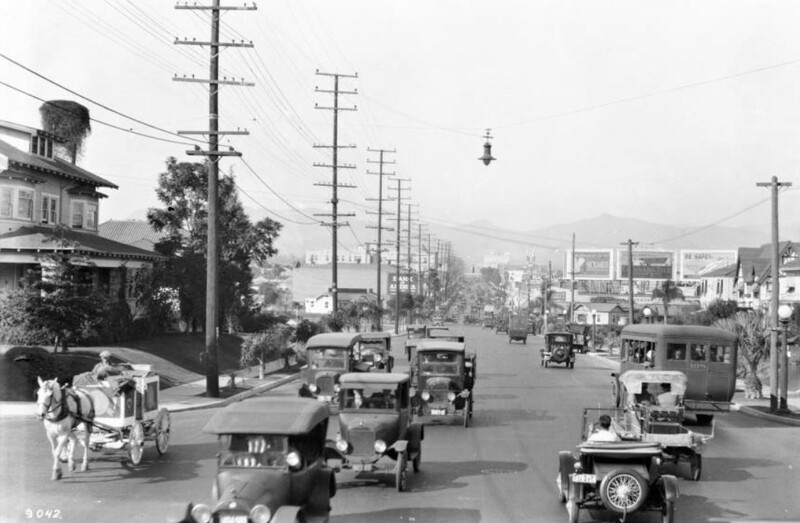 1924)^^ - View of Santa Monica Boulevard looking east toward Western Avenue, Hollywood. 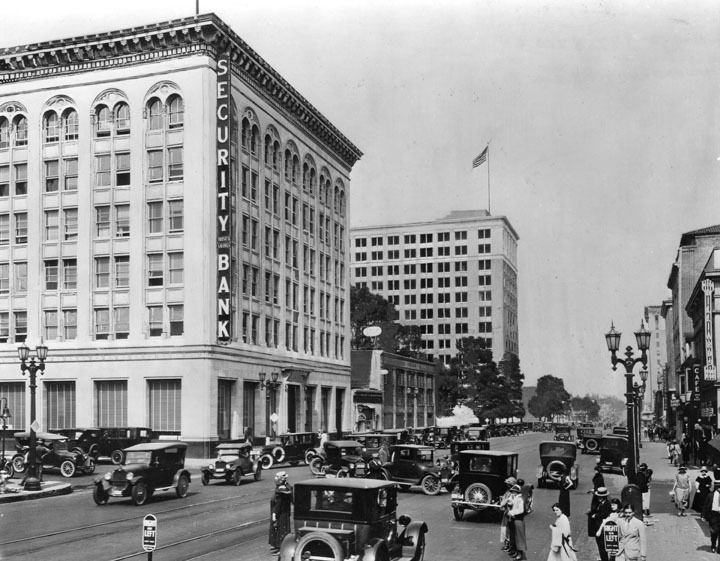 At left, the Security Trust & Savings Bank Building can be seen on the northwest corner of Western and Santa Monica. On the right, southwest corner, is the Taft Public Market. (ca. 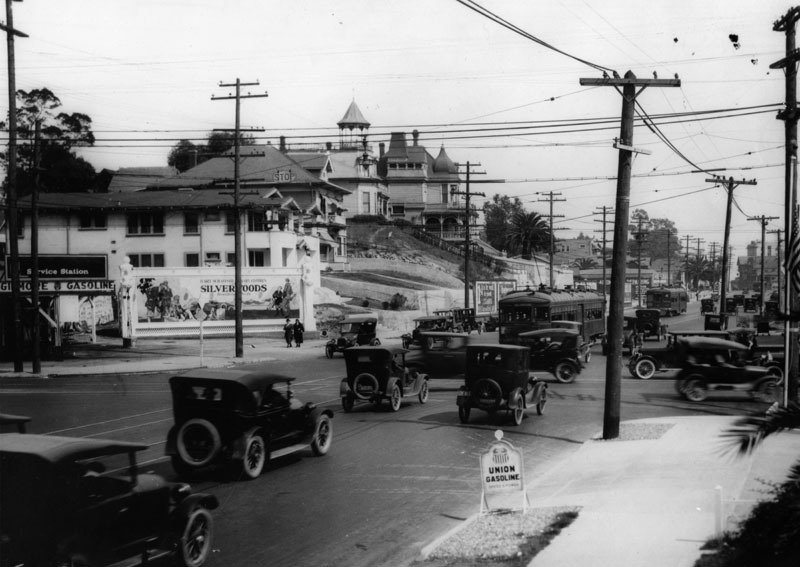 1924)^^ – View looking north on Western Avenue toward Sunset Boulevard. The front entrance to William Fox Studio is seen on the left. Between 1917 and 1924, William Fox Studio was firmly established at the expanded Dixon Studios in East Hollywood, at the junction of Sunset and Western. (ca. 1923)^ - Bird's eye view looking west on Hollywood Boulevard at Cahuenga. 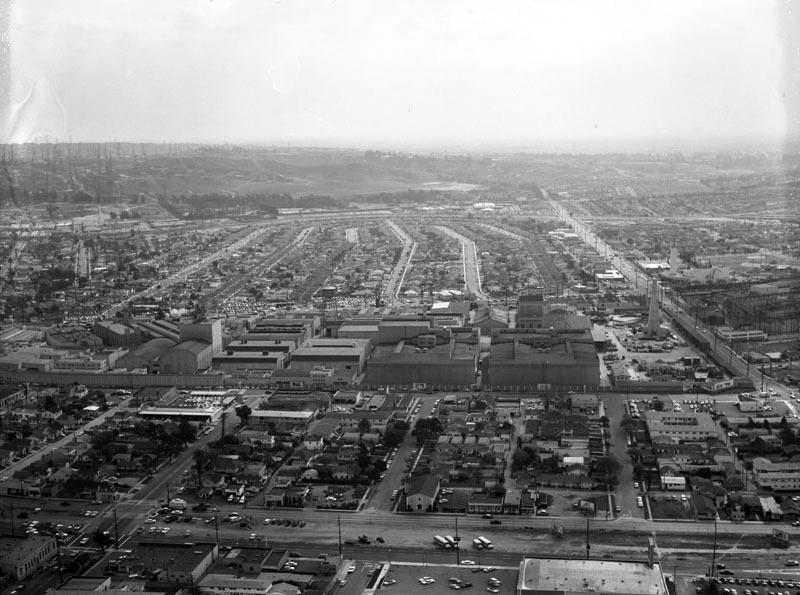 The Hollywood Public Market can be seen in the top center of photo at the corner of Wilcox. In the distance can be seen the three-towered Christie Hotel. 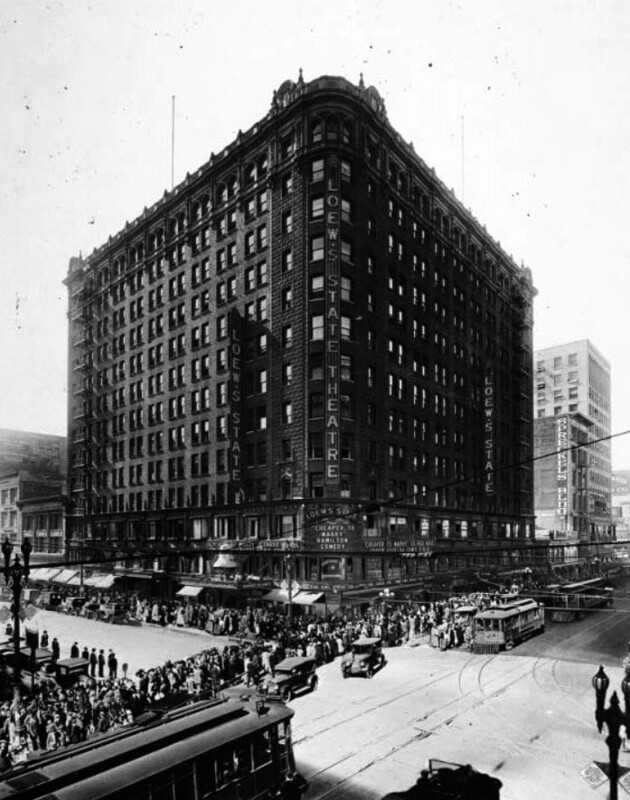 The eight-story Christie Hotel was considered Hollywood's first skyscraper when it opened in 1922. (ca. 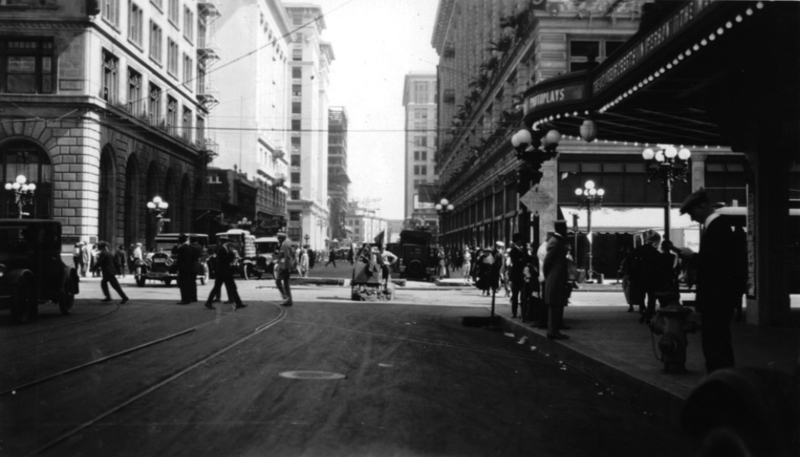 1923)^^ - View looking west on Hollywood Boulevard at Vine Street. Two-story buildings can be seen on both sides of Hollywood Boulevard, and the very tall, rectangular Guaranty Building can be seen at right at the northeast corner of Hollywood and Ivar. 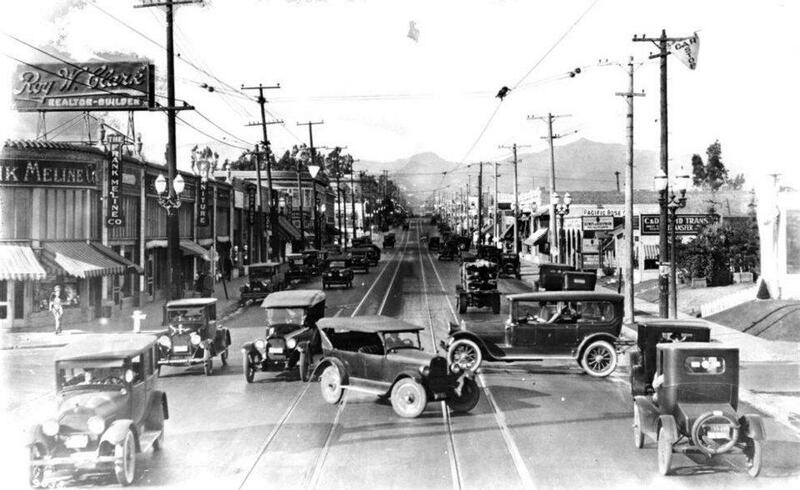 (1923)^ - View of Hollywood Boulevard at Cahuenga with traffic and pedestrians waiting to cross. The Security Trust & Savings Bank Building is on the left side of the photograph. In the distance is the Guaranty Building flying an American Flag. 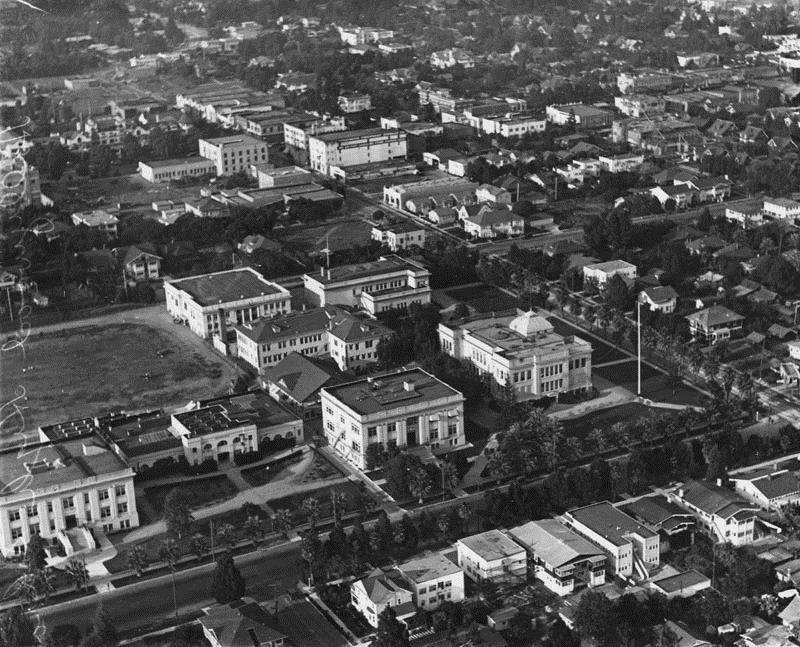 (1922)^ - An aerial view of Hollywood High School from the southwest. There is practice of some kind on the athletic field. Palm trees line the campus on Sunset and Highland. The original 1905 building is on the bottom right. The Household & Fine Arts building is in the middle of the quadrangle and the gymnasium is to its left when facing Highland. (ca. 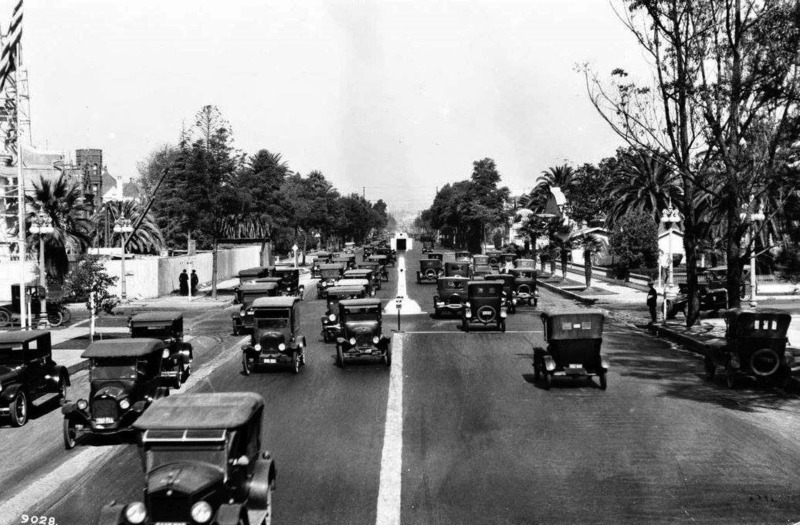 1922)^ - Looking west from Sunset Boulevard where it meets Highland Avenue. Hollywood High School can be seen on the northwest corner to the right. It was only six blocks from Mary Pickford's and Douglas Fairbanks' studios. 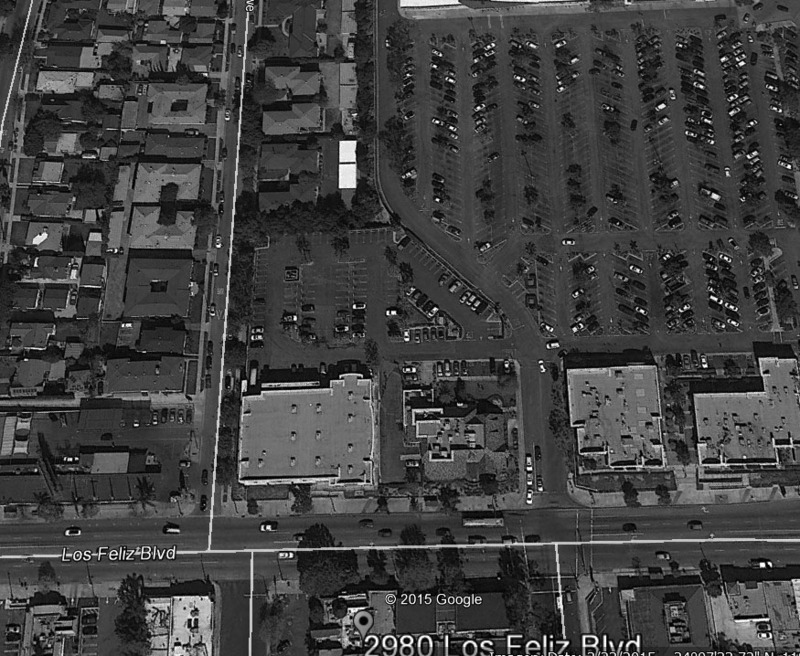 (1923)+^^ - Aerial view of the Pickford-Fairbanks Studios located at the corner Santa Monica Boulevard and Formosa Avenue, showing the amazing set for Douglas Fairbanks’ “Thief of Bagdad”. Note all the open land surrounding the studio. Click HERE to see more early views of the Pickford-Fairbanks Studios. 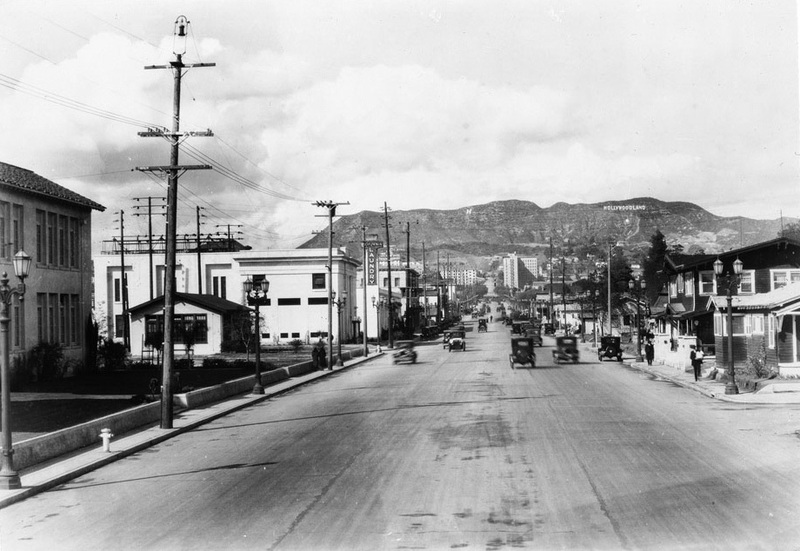 (1925)^^ - View of Hollywood looking north from Rossmore and Rosewood avenues showing Vine Street from Rossmore's north turn near Melrose Avenue. In the distance is the “Hollywoodland” sign. 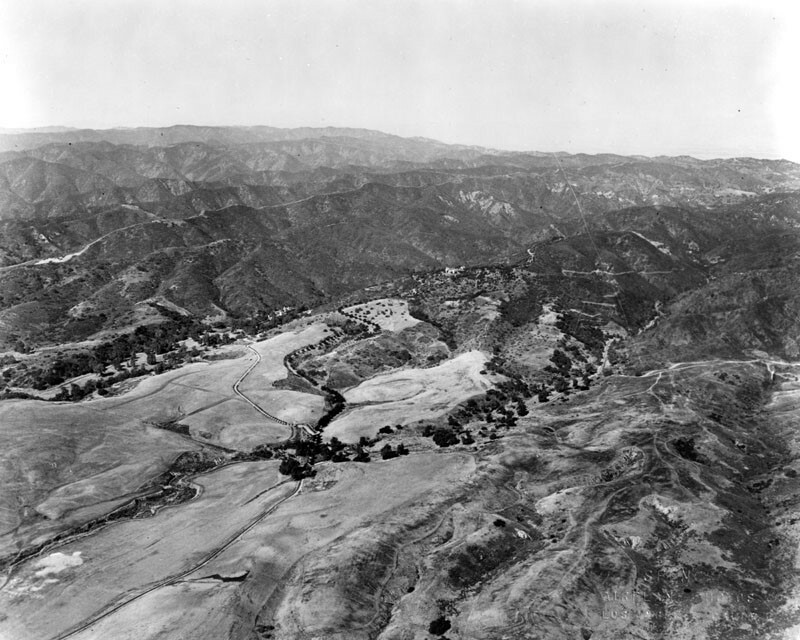 At top center-left can be seen the Mulholland Dam shortly after it was completed (Dec. 1924). Rossmore turns into Vine Street north of Melrose Ave in Hollywood. (ca. 1925)^^ - View of Vine Street looking north from Barton Avenue towards the Hollywood sign. (ca. 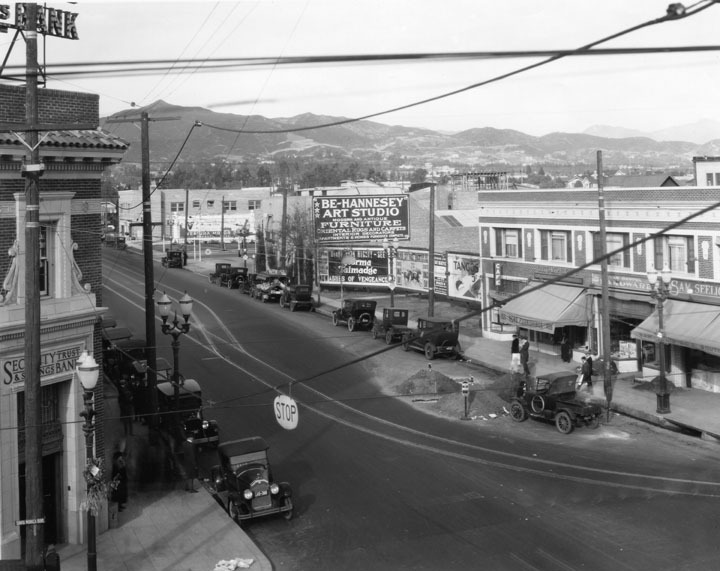 1925)^^ - Panoramic view of Hollywood looking north on Vine Street from Clinton Street. Residential blocks full of one-story houses fill the foreground, turning into high rise hotel buildings as Vine Street approaches the mountains. 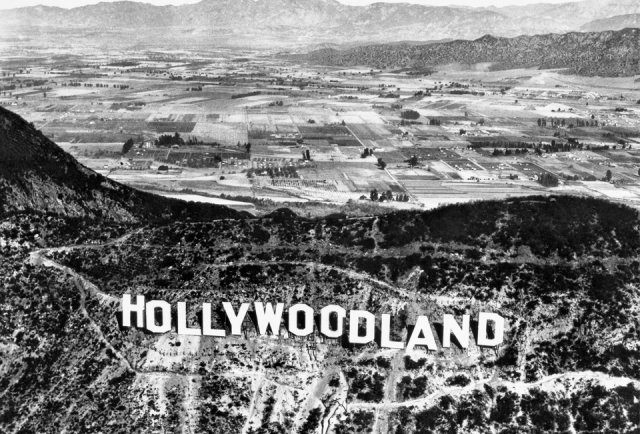 A single “H” as well as the “Hollywoodland” sign are visible. A small section of the Mulholland Dam is visible at left. The Mulholland Dam, built in 1924, can be seen at left-center. The dam still exists today but can no longer be seen from this view or from just about anywhere in Hollywood. Click HERE to see more in Mulholland Dam and Hollywood Reservoir. (ca. 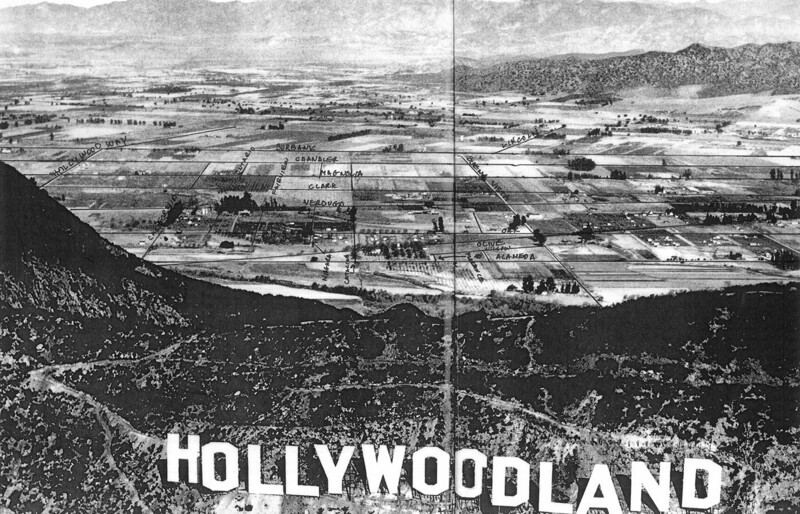 1920s)**^** - Aerial view of the Hollywoodland Sign showing the newly developed land in the foreground. Beyond the Hollywood Hills can be seen the vast amount of open space and farmland of the San Fernando Valley. The HOLLYWOODLAND sign sits below Mt. Lee. Another sign ( just the letter 'H') is seen to the left on top of Mt. Cahuenga. (ca. 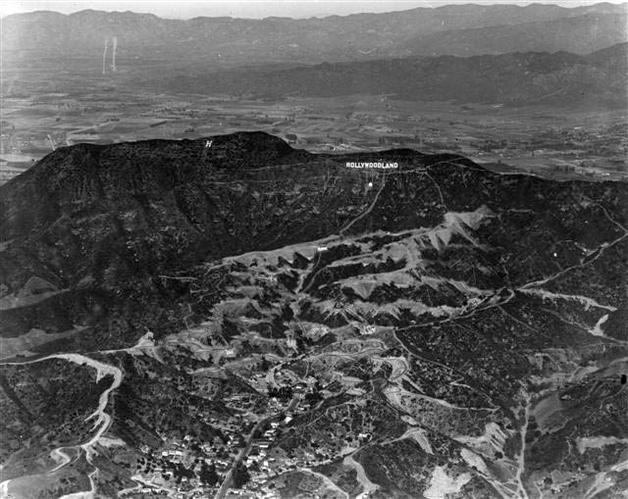 1924)^* - Aerial view overlooking the Hollywood Hills and HOLLYWOODLAND sign into Burbank in the east San Fernando Valley. Farmland and open fields can be seen throughout. (ca. 1924)^#^ - Panoramic look over the “Hollywoodland” Sign and over the ridge of the Hollywood Hills showing a detailed view of Burbank with streets annotated. Note the vast amount of farmland and open fields. (1920s)* - Aerial view of Muir Junior High School taken from the east. 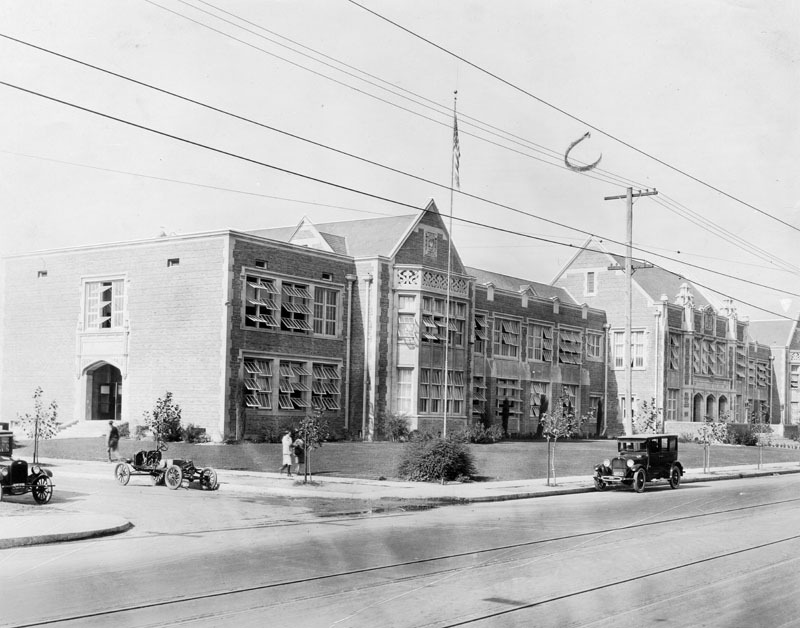 (1920s)* - Front view of John Muir Junior High School. The sprawling school shows numerous windows, partly opened, and a nicely manicured lawn with young trees planted along the front sidewalk. Three people can be seen walking along the side of the building, probably 62nd Street, and three antique cars are parked on the street. 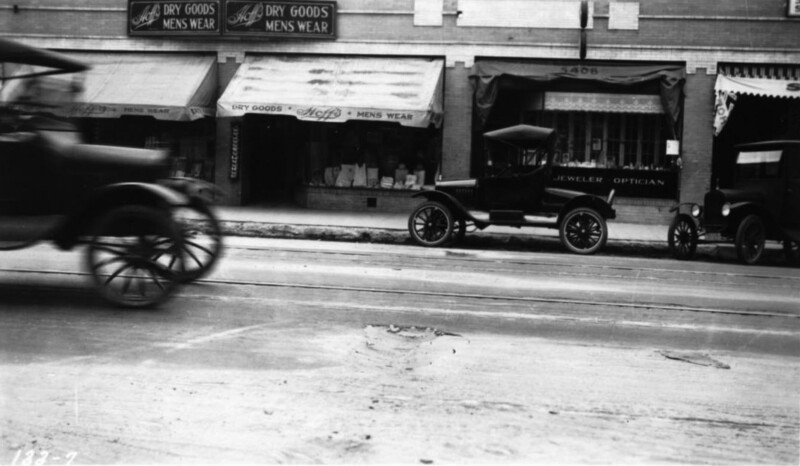 (1923)^^ - Motorcycle stuck in mud at intersection of West Adams Boulevard and Caldwell Avenue (now Ridgley Drive). Real estate sign behind them reads: WALLECKS WEST ADAMS TRACT - LOTS $850 - EASY TERMS. 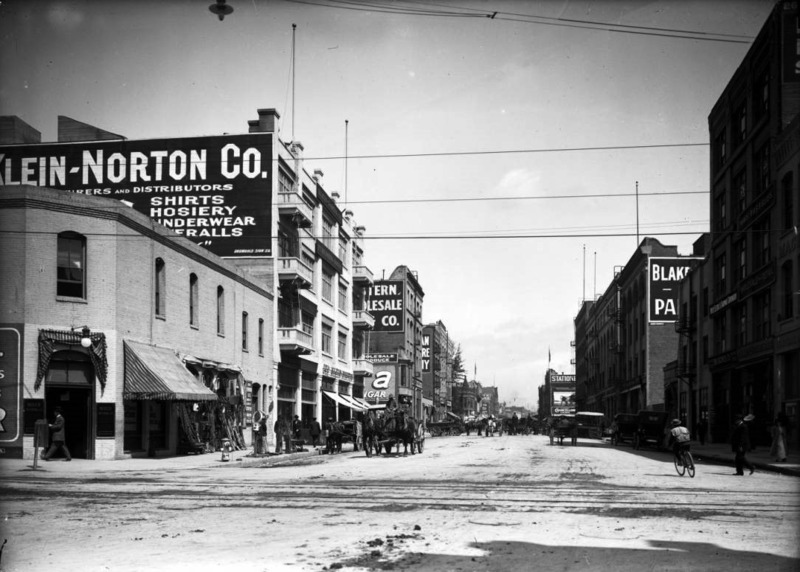 (1923)^ - View of the intersection of 4th and Main streets. Passengers are making their way onto a streetcar on Main Street (lower left) while pedestrians are seen crossing 4th Street. 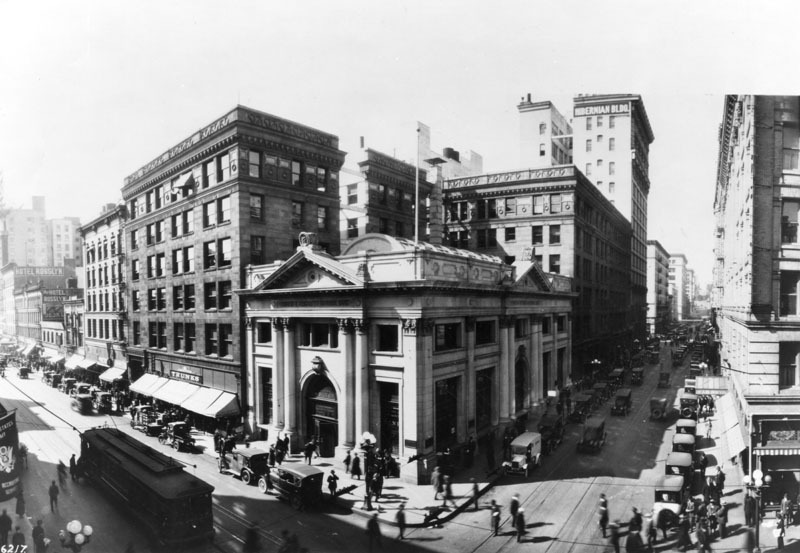 The ornate Classical Revival style Farmers and Merchants Bank of Los Angeles stands on the southwest corner. 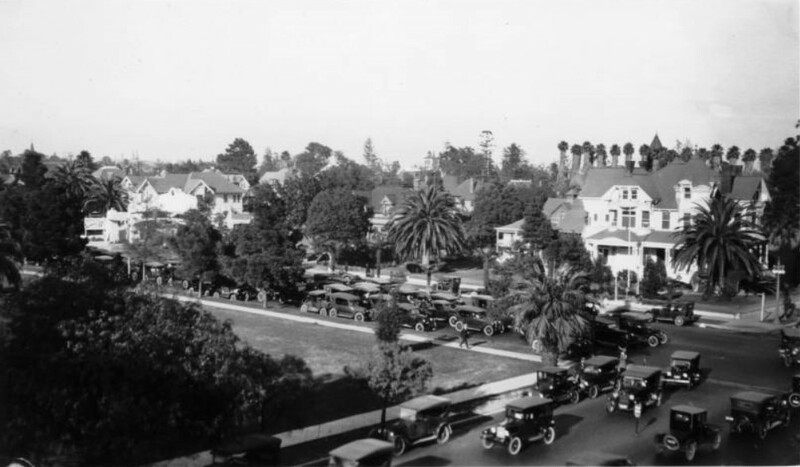 (1923)^^ - View looking northeast from the balcony of the Dining Room at the Automobile Club Building, showing congestion at the intersection of Adams and Figueroa. The empty lot on the northwest corner is where the St. Vincent Church would be built the next year. 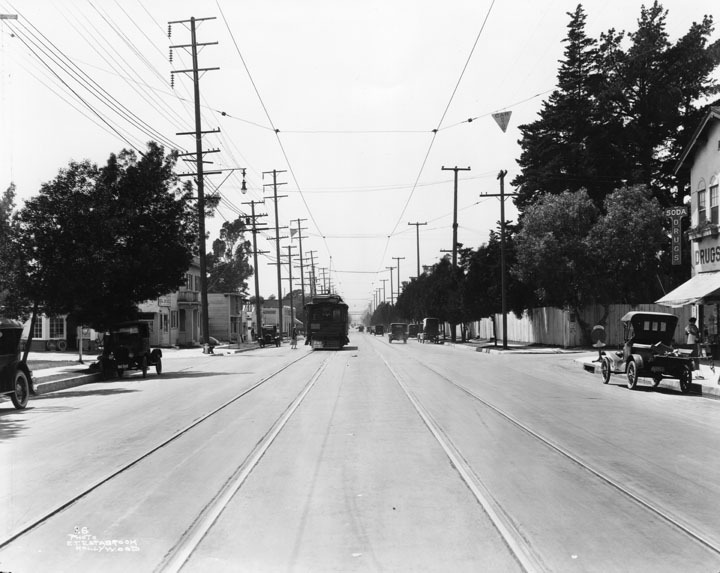 (1923)^ - View looking South on Figueroa Street near Adams Blvd. There is heavy traffic in both direction. The Automobile Club of Southern California is seen on the southwest corner. Across the street (n/w corner) is the construction site for the new St. Vincent Church. 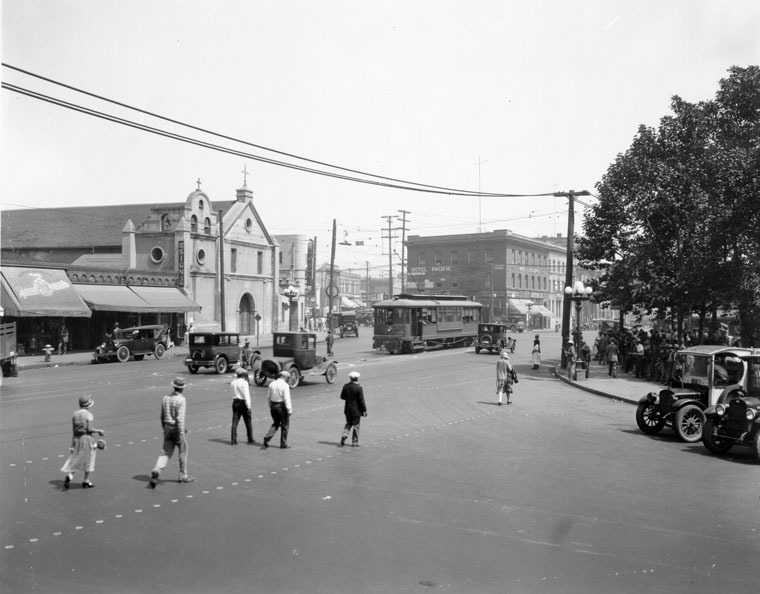 (1923)+^^ – View looking north on Figueroa Street at Adams Boulevard. At the N/W corner can be seen part of the construction site for the St. Vincent Catholic Church. At the center of the intersection is an odd looking device. It was an experimental traffic signal called “American Bobby”. (ca. 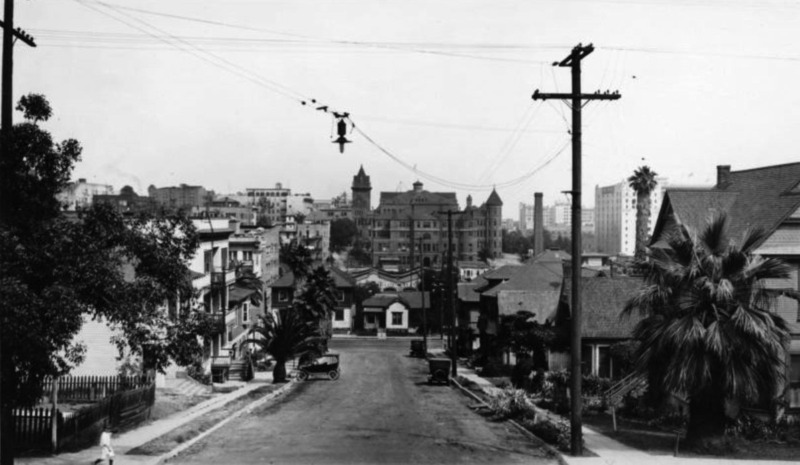 1924)^.^ - View looking west on Adams at Figueroa showing the Automobile Club Building on the left and the St. Vincent de Paul Roman Catholic Church under construction on the right (NW corner). Click HERE for contemporary view. (ca. 1924)^ - A construction fence and temporary buildings surround the St. Vincent Catholic Church, 621 W. Adams Blvd., as it is being built. Scaffolding is on the dome and sides. Limestone blocks for the facade lie on the ground in front of the entrance. The surrounding neighborhood has stately homes with extensive grounds. (ca. 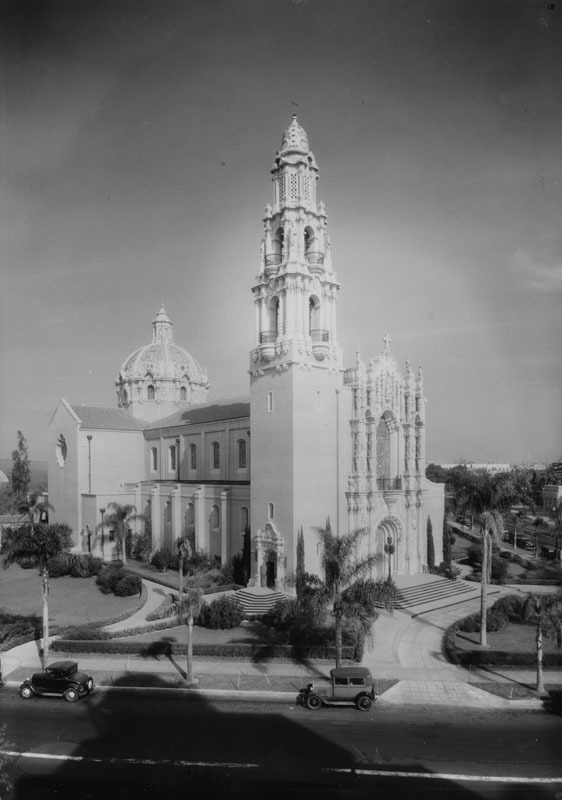 1925)^ - View of a newly completed St. Vincent Catholic Church located at the northwest corner of Adams and Figueroa St. The shadow in the foreground is that of the Automobile Club Building across Adams. In 1971, Saint Vincent de Paul Church was dedicated Los Angeles Historic-Cultural Monument No. 90 (Click HERE for complete listing). 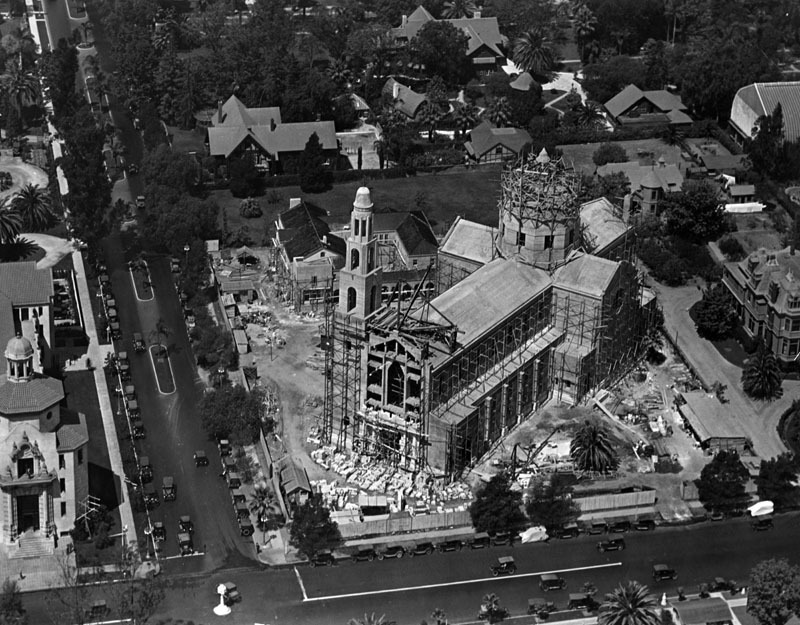 Click HERE to see more Early Views of the St. Vincent Catholic Church. 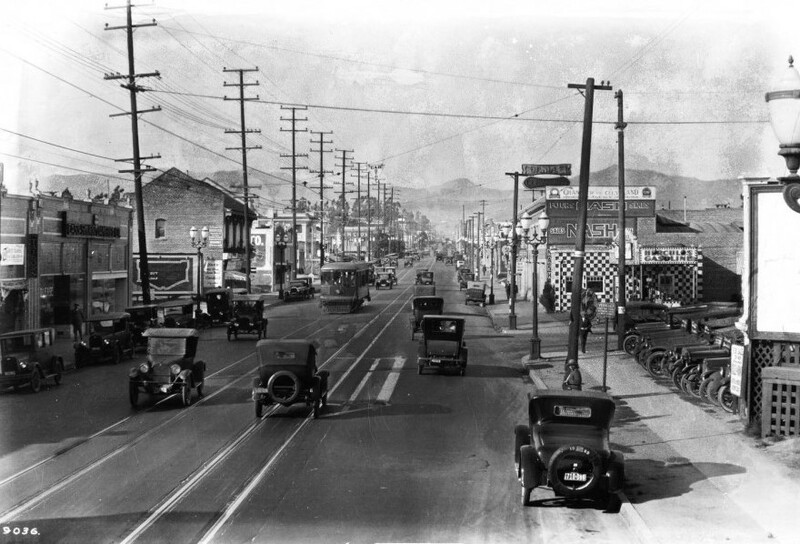 (1926)^ - Figueroa Street looking northwest toward West Adams Boulevard. On the left is the Automobile Club of Southern California and St. Vincent Catholic Church. 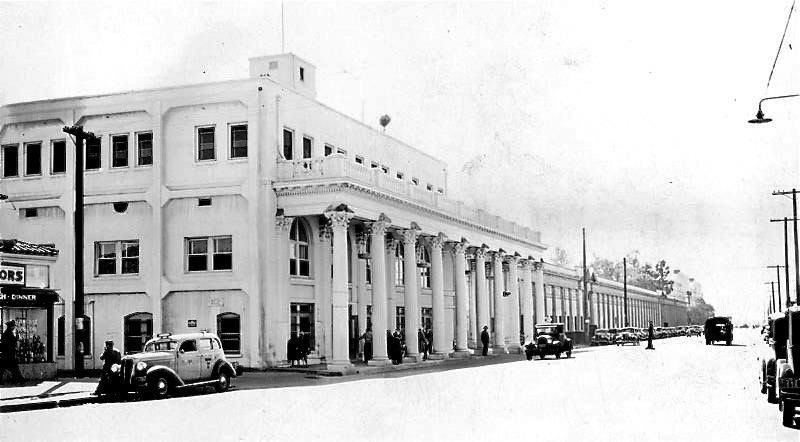 (1920s)^ - Exterior view of the Automobile Club of Southern California, located at 2601 S. Figueroa St. on the southwest corner of Adams and Figueroa. Three cars can be seen waiting for the unuusal looking traffic signal (located in the center of the intersection) to change. The Automobile Club Building was designated LA Historic-Cultural Monument No. 72 (Click HERE to see complete listing). 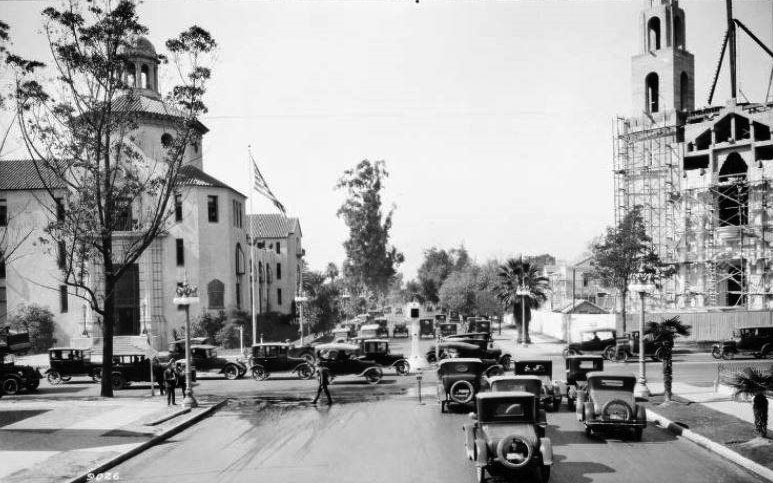 (1920s)*+* – View showing a man on a ladder making adjustments to an experimental traffic signal situated in the middle of the intersection of Adams and Figueroa, near the Automobile Club (out of view). Photo Courtesy of the Automobile Club. 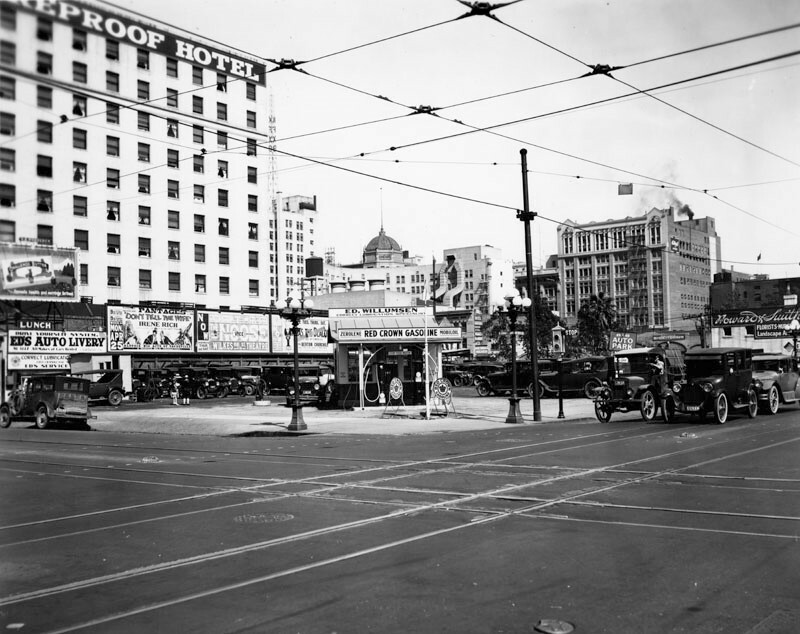 (1924)^ - View looking west toward the intersection of Sunset Boulevard and Figueroa Street. A Gilmore service station can be seen on the southwest corner. The Orsini Apartment Complex is now situated at this site. (ca. 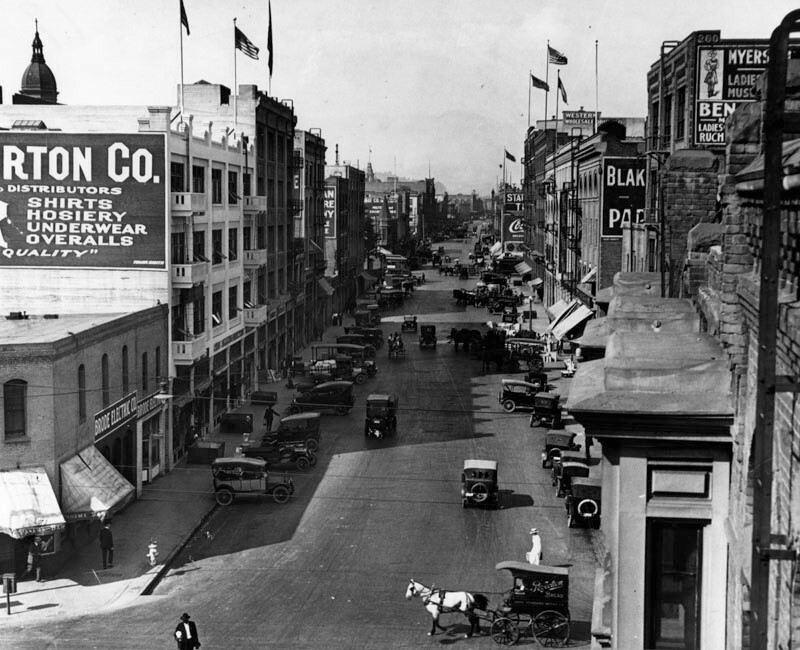 1924)^^ – View looking north on Broadway from 3rd Street. On the northeast corner is United Cigars, a store with a sign advertising Tareyton Cigarettes, 20 for 25¢. (ca. 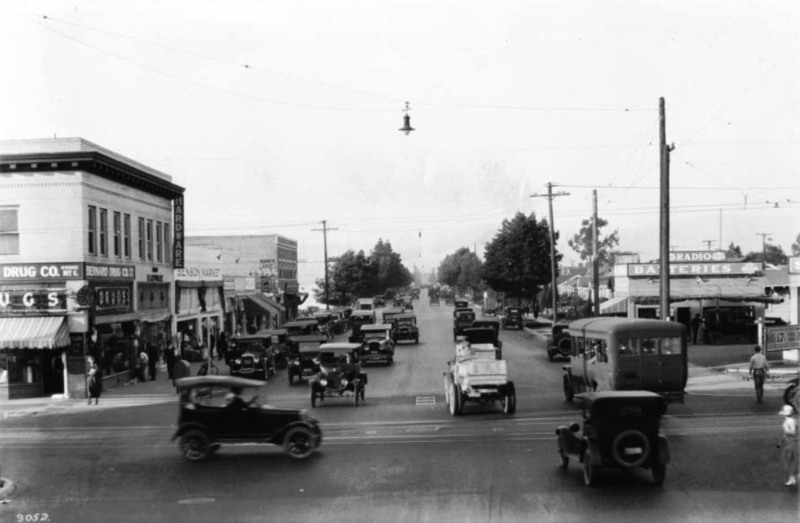 1924)^^ - View of a busy Main Street looking north from 4th Street. Notice the decorative 5-bulb lamp posts running along both sides of the street. Click HERE to see more in Early Los Angeles Street Lights. 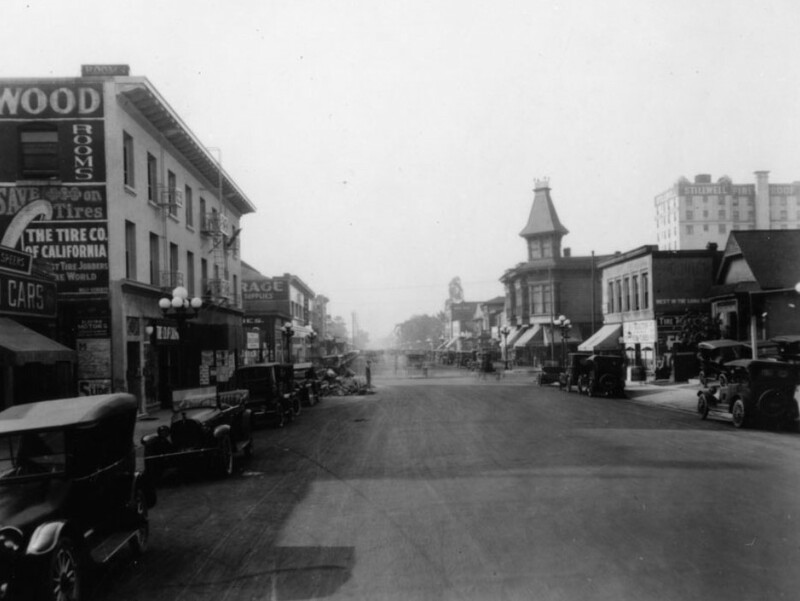 The four prominent buildings seen above at the intersection of 4th and Main are the: Van Nuys Hotel (N/W), Westminster Hotel (N/E), Farmers and Merchants Bank Building (S/W), and San Fernando Building (S/E). The bank building features Greek-like architecture while the other buildings along the street are more contemporary. (ca. 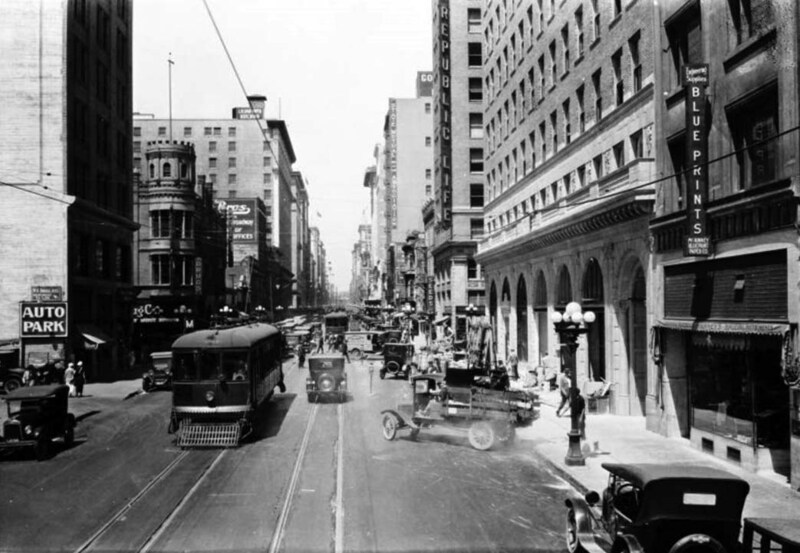 1924)^^ – View looking north on Spring Street from 4th Street. 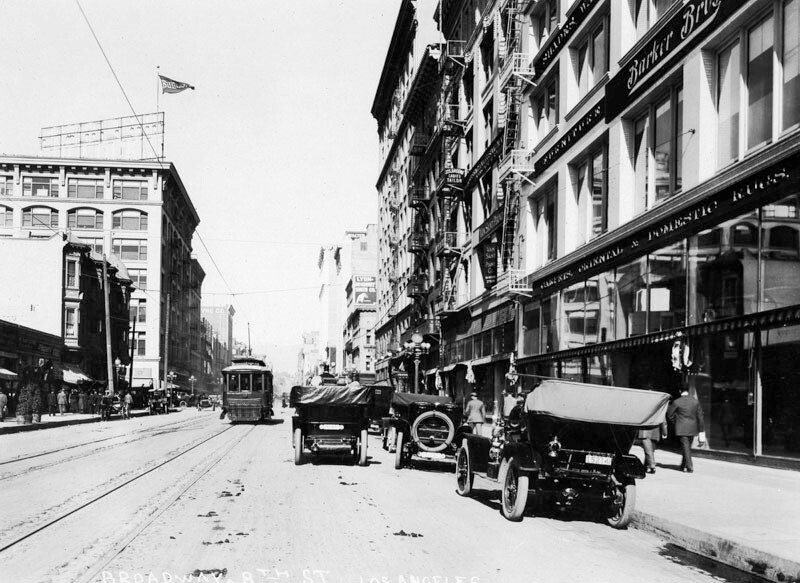 The street is busy with pedestrian, automobile and trolley car traffic. Prominent buildings are the Angelus Hotel (at left), Hogan Building (at left), and California Bank Building (at right). (ca. 1924)^^ - View of Spring Street from below 6th Street. The street is busy with pedestrian, automobile and street car traffic. (ca. 1924)^^ - View of the 700 block of Spring Street looking north from 8th Street. The street is busy with pedestrian, automobile and railway car traffic. 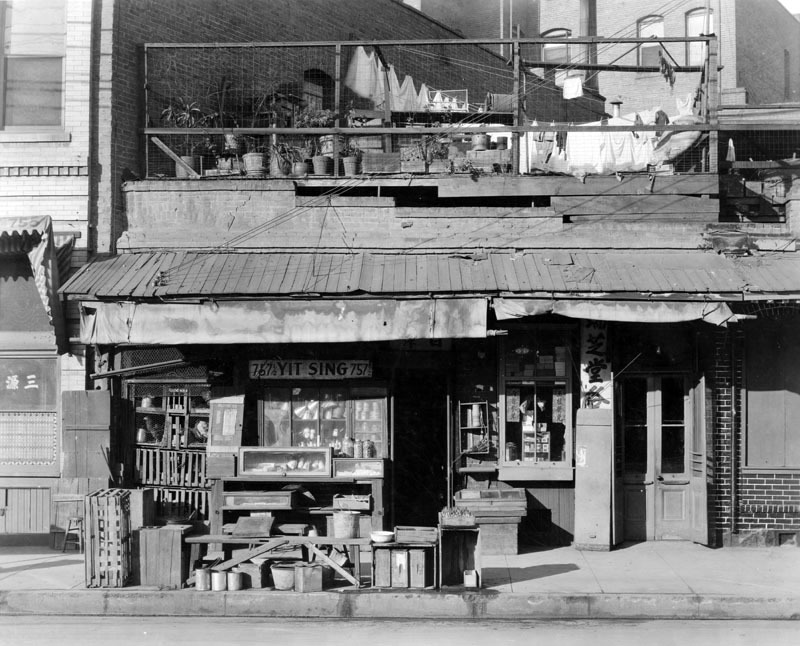 (1923)^^ – View looking east on 8th Street at Hill Street. The May Company Building (previously Hamburger’s Department Store) is seen on the southeast corner. (ca. 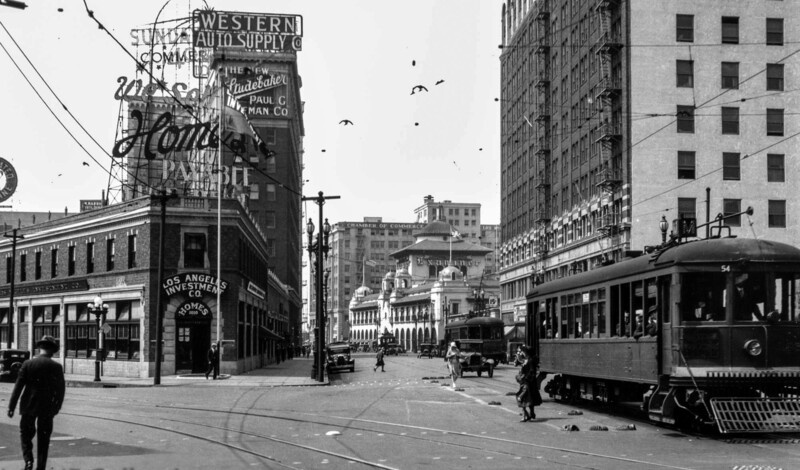 1923)^ - View looking north on Broadway at 8th Street showing a streetcar sharing the road with early model cars, most of them with their tops down. Barker Bros. is seen in the foreground on the right. In the distance, on the northwest corner of Broadway and 7th Street, stands the Bullock's Department Store with large flag above its roof. 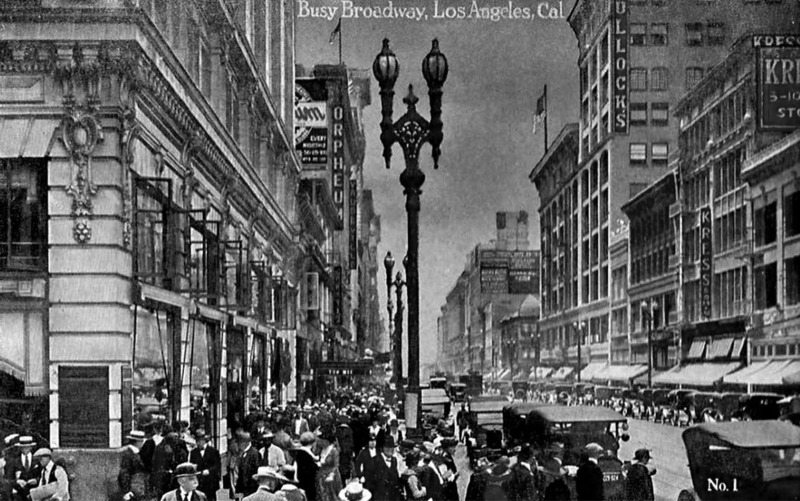 (1920s)^#*^ – Postcard view of a “Busy Broadway” looking south from Sixth Street. On the right can be seen Bullock’s Department Store and Kress Shoes. On the left stands the Orpheum Theatre. Note the ornate 2-lamp streetlights running up and down Broadway. Click HERE to see more in Early Los Angeles Streetlights. (ca. 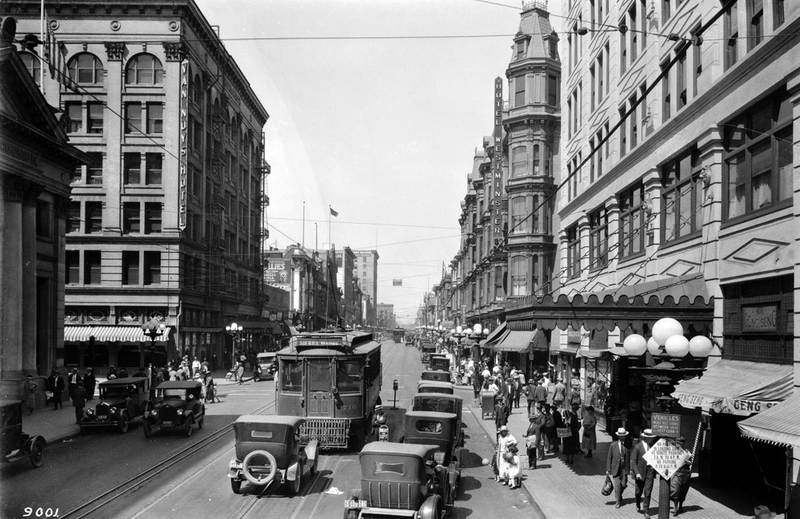 1924)^^ – View looking north on Broadway at Seventh Street. The Bullocks Department Store stands at the northwest corner. The sidewalks are crowded with pedestrians, while streetcars and automobiles can be seen in the road. 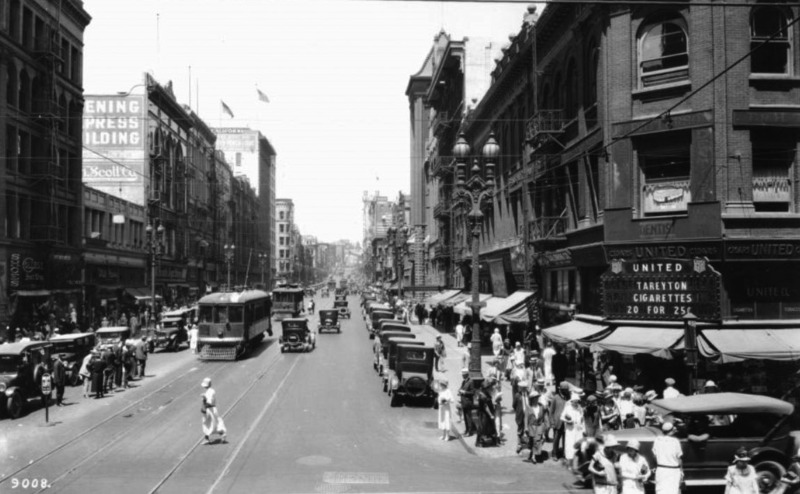 (1925)^^ – View looking north on Broadway toward 7th Street. American flags hang on wires that cross the street in preparation for the Shriner’s parade. The streetlight posts have been decorated to look like palm trees. The sidewalks that border the street are packed with pedestrians. (ca. 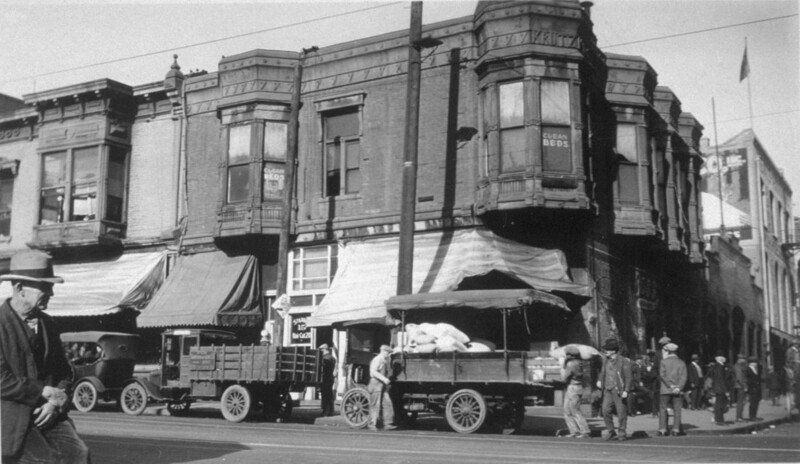 1920s)^ - Exterior view of Yit Sing, a Chinese merchant at 757-1/2 North Alameda Street. (ca. 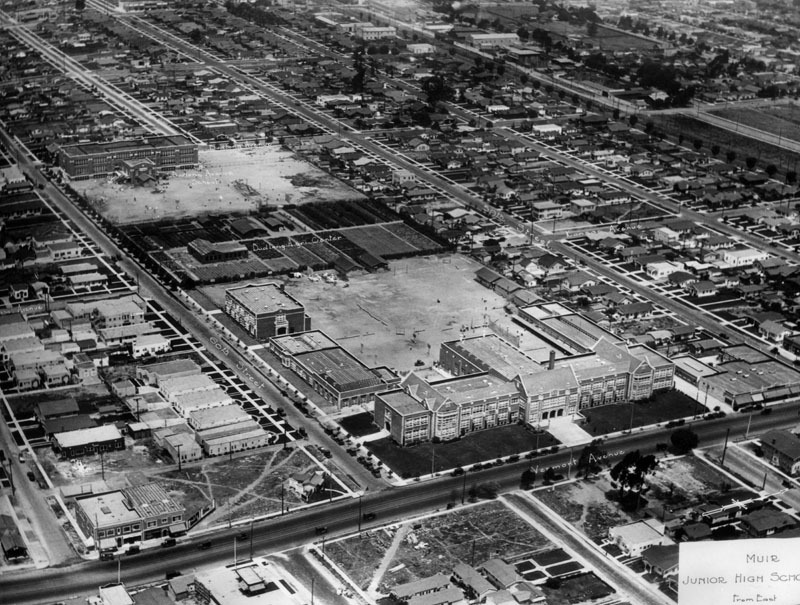 1924)^ - Aerial view of the Los Angeles Plaza and surrounding buildings. The streets from top to bottom are: Alameda Street running diagonlly at the upper left, Los Angeles Street, and Main Street. 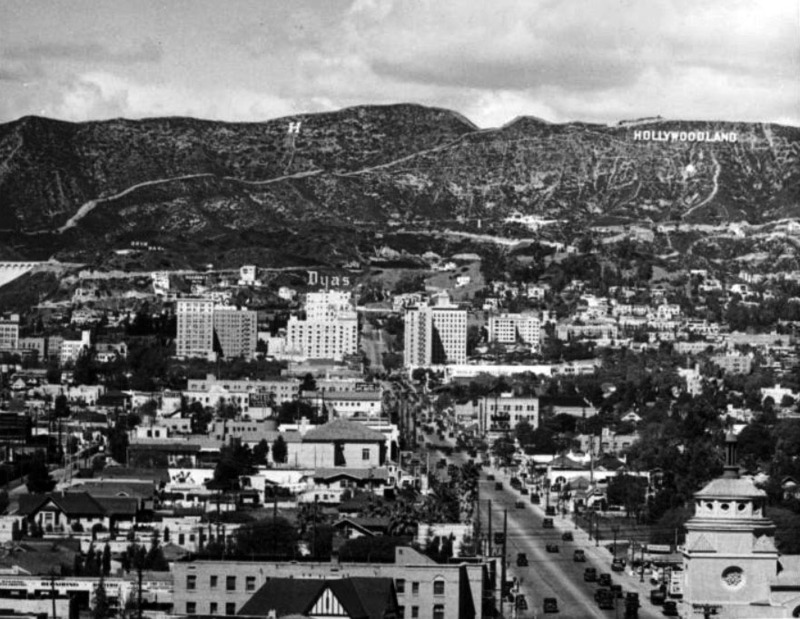 Nearly half the buildings to the right of the Plaza (south of the Plaza) were demolished in the 1950s to make way for the Hollywood Freeway. 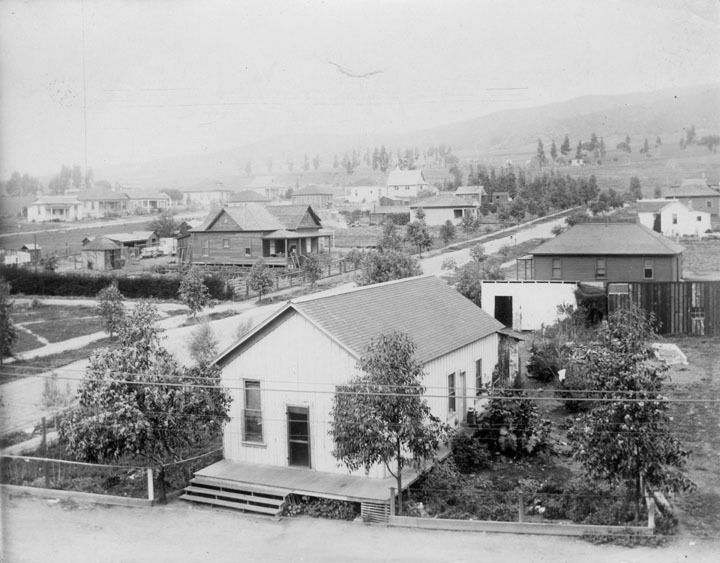 The sole occupant of the entire city block bounded by Los Angeles, Marchessault, and Alameda streets (upper left corner of the photo) was a sturdy, square, two-story brick structure. Built originally for a furniture factory, it was later remodeled to serve as a headquarters of the Los Angeles Water Department’s predecessor, the Los Angeles City Water Company. Click HERE to see more in Water Department's Original Office Building. (ca. 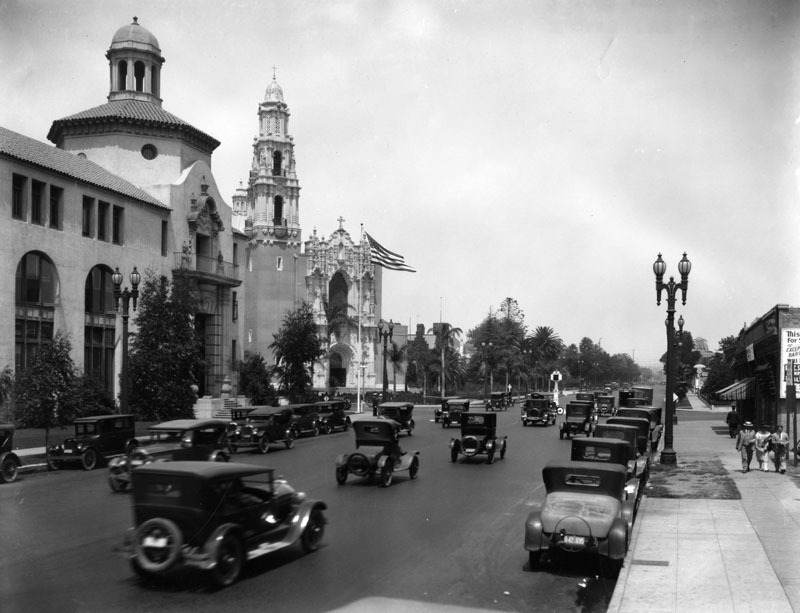 1925)^ - The Plaza Church on Main Street across from the Plaza and Olvera Street. Behind the streetcar is the Hotel Pacific, the office of Philip Morici and Co., "Agencia Italiana," and the grocery store of Giovanni Piuma, who also made wine (Piuma Road in Malibu was named for him). The area north of the Plaza was at this time an Italian neighborhood. 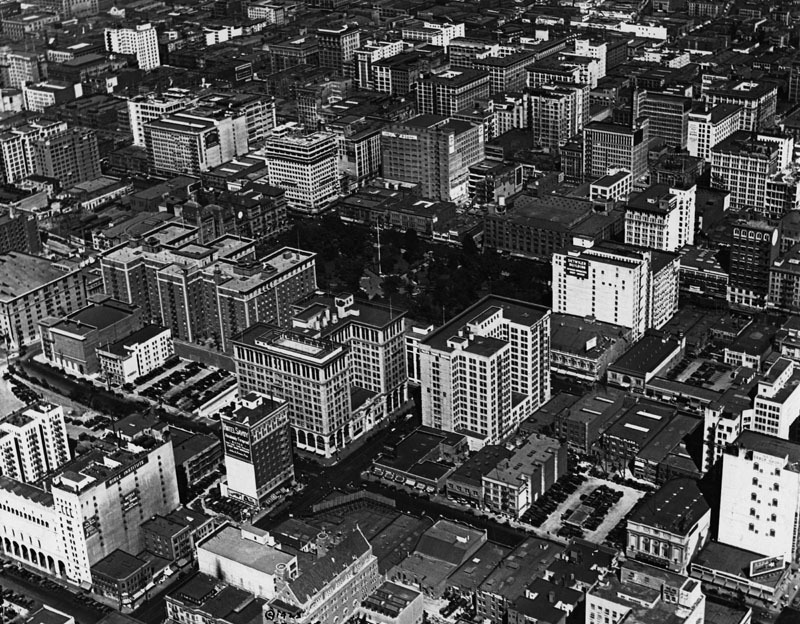 (1924)^ - Aerial view of Downtown Los Angeles as seen from 6th Street and Grand Avenue. Pershing Square can be seen in the center of the photo. Some identifiable buildings include: The Brack Shops on the lower right, the Bible Institute and Hotel Savoy on the lower left, the Detwiler Building center right, and Biltmore Hotel center left. (ca. 1924)^ - Aerial view looking northwest of Pershing Square, the Biltmore Hotel, and preparation of the State Normal School site for the construction of Los Angeles Central Library (upper-left corner). (ca. 1924)^ - This is the site of the former Los Angeles State Normal School, and future site of Central Library of the Los Angeles Public Library. The area has been dug out for the foundation and work is well under way. The dark building on the left is the Biltmore Hotel, the large white building in the background is the Pacific Mutual Building, and the building on the extreme right is Hotel Savoy. 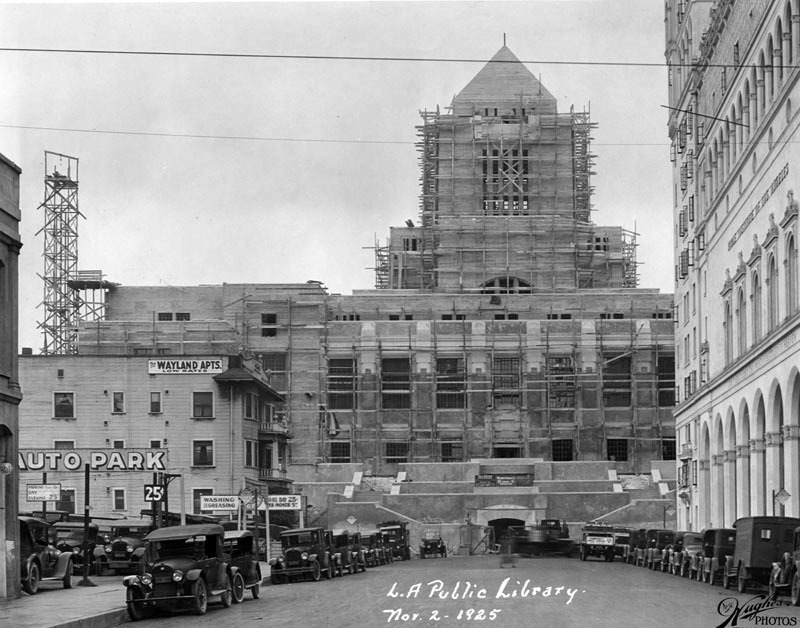 (1925)^ - Photograph shows construction of the Los Angeles Central Library, located at 630 W. Fifth Street; view is looking north on Hope Street. The structure, which is almost complete, shows scaffolding along the entire south side as well as surrounding the tower at the top. A sign posted above the tunnel entrance, at the end of this street reads: "Weymouth Crowell Co. - General Contractors". The Wayland Apts. offering "low rates" is visible on the left corner next to Savoy Auto Park, whose rates are .25 cents all day, or $5.00 per month. The large white building on the right is the Bible Institute, later to become Church of the Open Door/Biola Institute, located at 555 S. Hope Street. Numerous automobiles are parked on both sides of the street. 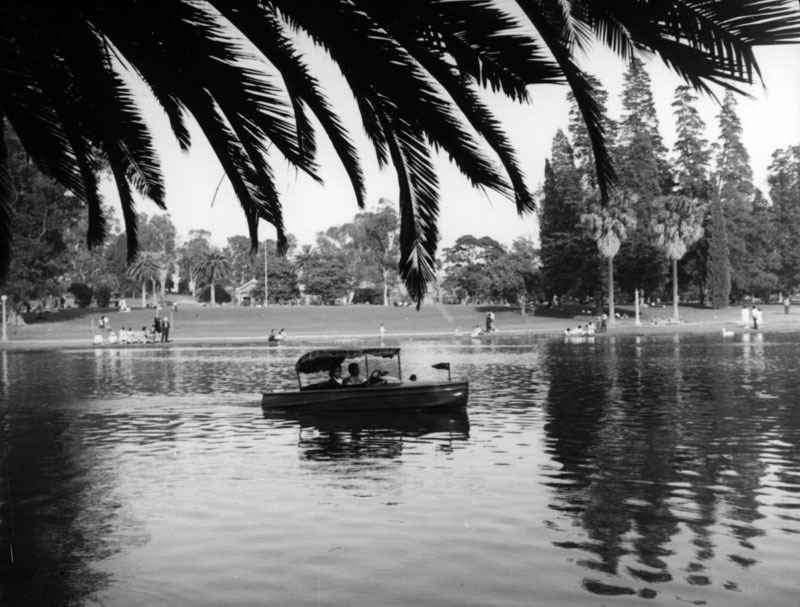 (1920s)^ - A man enjoying the afternoon in a canoe at Westlake Park (later MacArthur Park). (ca. 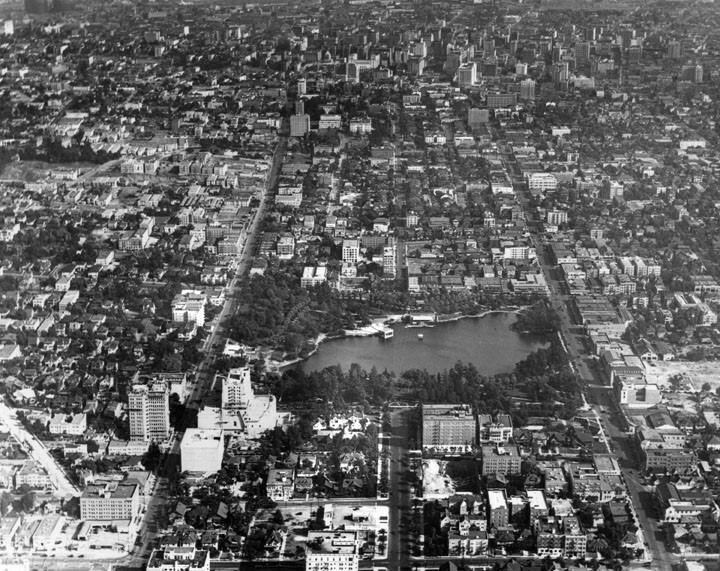 1923)^ - Aerial view of Westlake Park looking east. 6th Street runs from bottom to top at the left of photo. 7th Street runs from lower-right to right-center. Wilshire dead-ends at the lake between 6th and 7th at center bottom-right. Orange Street picks-up on the other side of the lake, opposite the Wilshire dead-end, and extends to downtown Los Angeles. 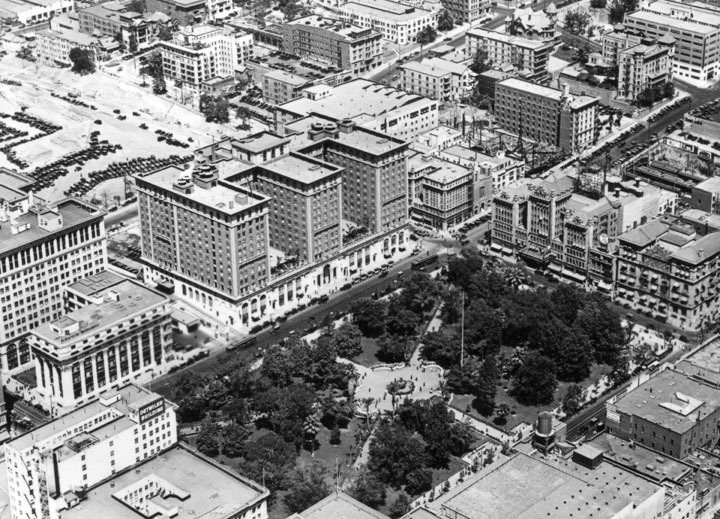 (1924)^ - Aerial view of the northwest corner of Westlake Park showing the new Elks Club Building (built in 1923-24) and surrounding area. 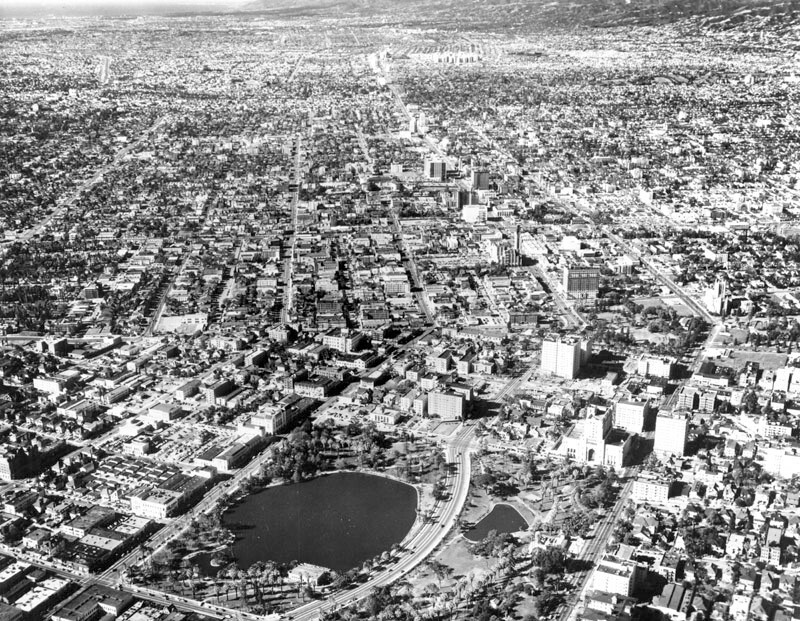 At lower-left can be seen Wilshire Boulevard which dead-ends at the lake. 6th Street runs diagonally from lower-right to upper-left. (ca. 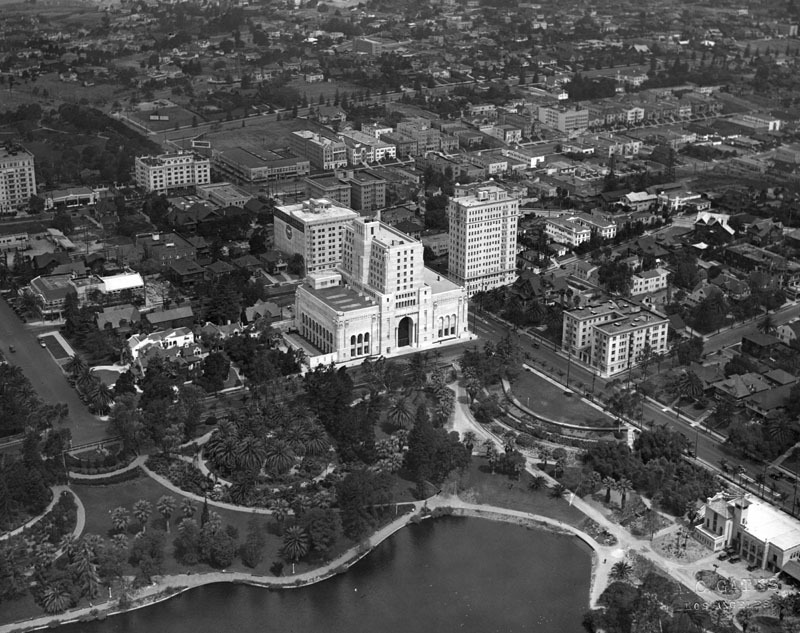 1925)^ - Aerial view of Westlake Park looking east toward downtown Los Angeles from a higher elevation. 6th Street runs from bottom to top on the left of photo. Wilshire Boulevard ends at the west side of the lake (lower center). 7th Street is on the south (right). (1931)^ - Drawing of the proposed bridge to carry Wilshire Boulevard across Westlake Park. The plan was also to widen Orange Street between Alvarado and Figueroa and then rename it Wilshire Boulevard. The plan: widen and rename Orange Street, bridge the lake to link the two sections of Wilshire, and then extend the boulevard through several dense city blocks into the heart of downtown. Click HERE to see more on the Widening of Wilshire Boulevard (Orange Street) from Figueroa to Westlake. (1934)^^ - View looking east. Completed in 1934, a causeway connected Wilshire Boulevard with Orange Street, linking the grand boulevard with downtown Los Angeles. Orange was renamed Wilshire. 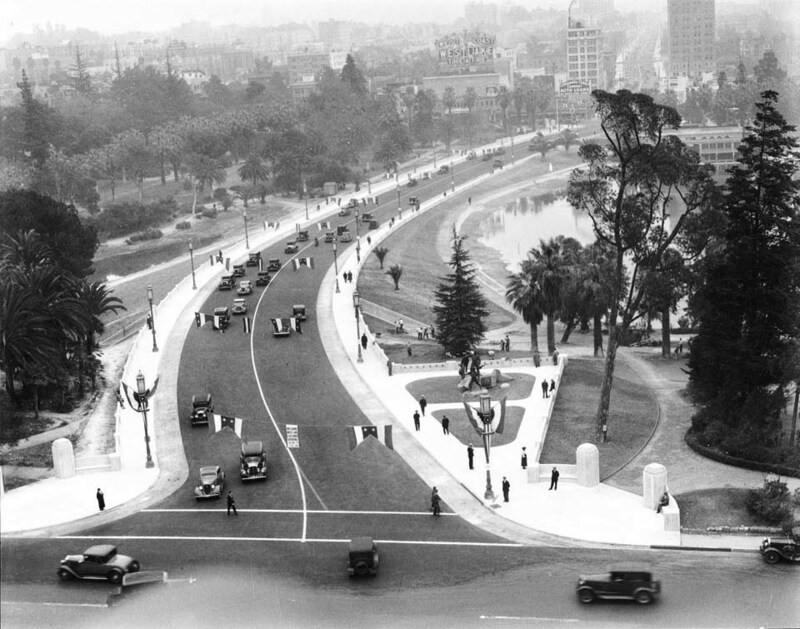 (1934)^ - Panoramic view of Westlake Park looking west on Wilshire from Alvarado shortly after the bridge over the lake was constructed. (ca. 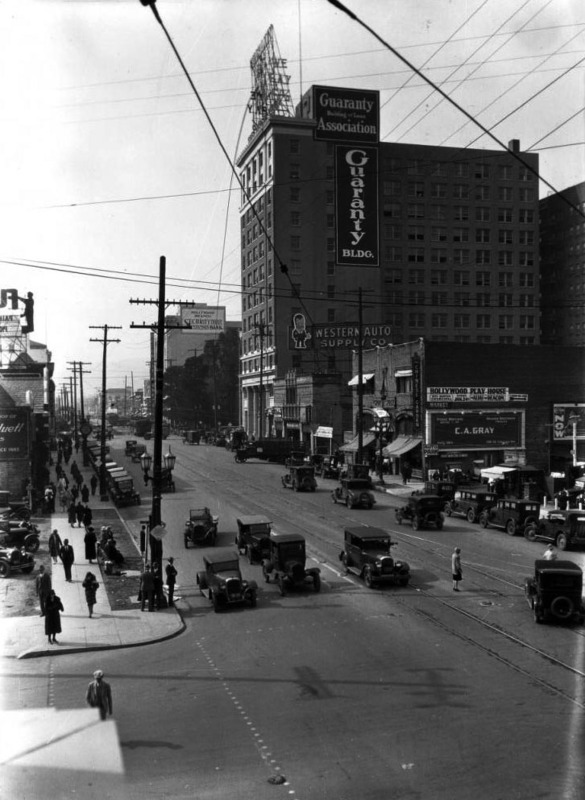 1934)^#^ – Street view looking northwest showing "Wilshire Blvd. thru West Lake Park". Note the beautiful streetlights lining both sides of the boulevard. These ornate streetlights, called "Wilshire Specials", were installed on Wilshire Boulevard in the late 1920s and 1930s. 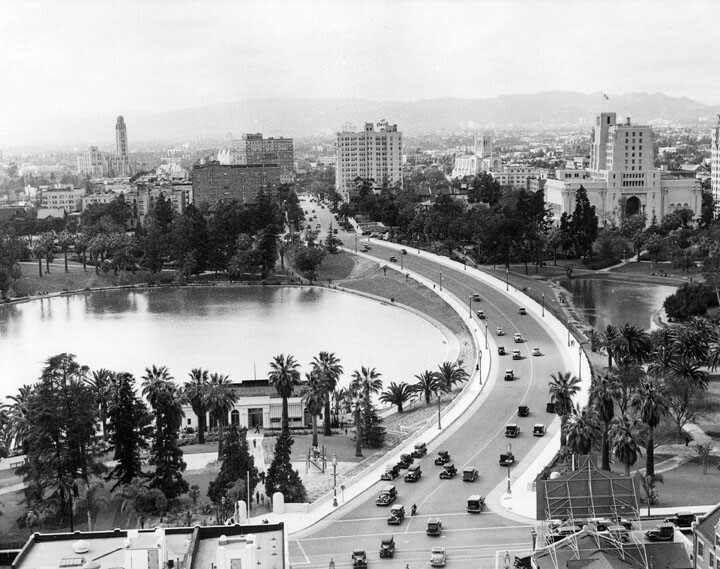 (1934)*# - View looking southeast from the Elks Club Building at the corner of 6th Street and Park View Avenue showing how the lake is now bisected by the newly constructed Wilshire Boulevard. (ca. 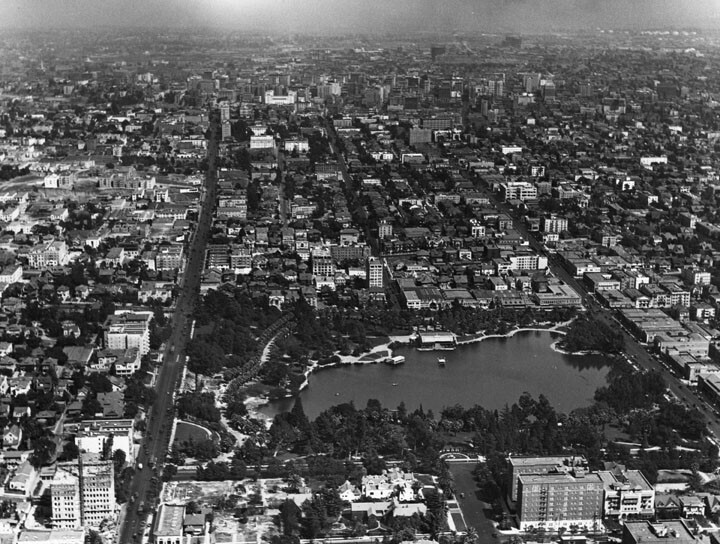 1940s)^ - Aerial view of the Westlake and Wilshire District, looking west. 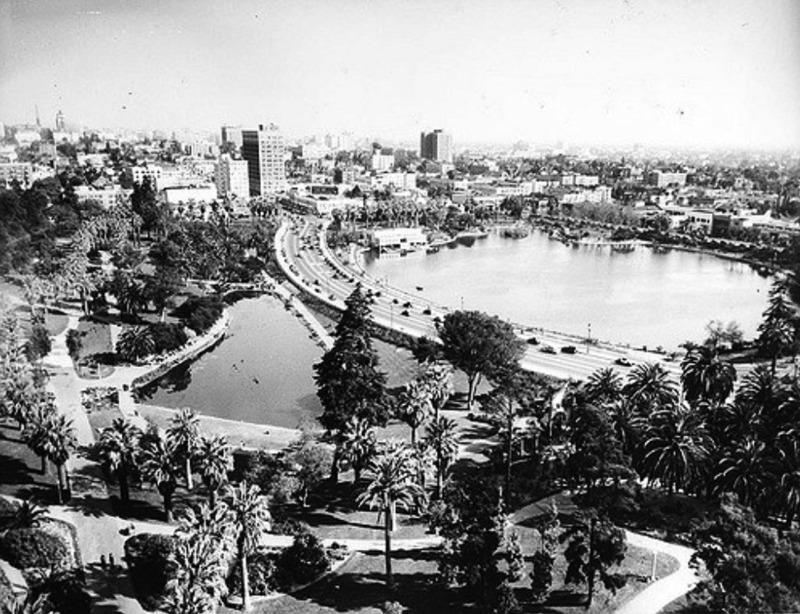 MacArthur Park with its large lake is visible in the foreground and a smaller lake, also part of MacArthur Park, is on the right. 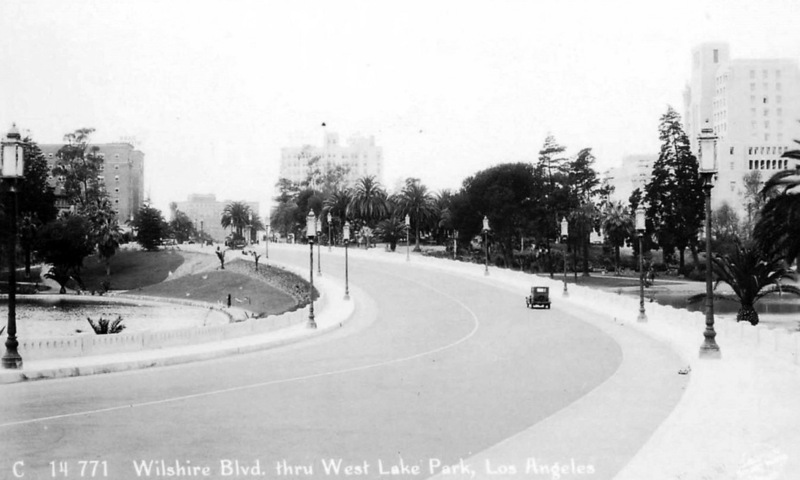 Wilshire Blvd., which is the curved street (lower middle), has separated the park and lake. Wilshire now runs 15.8 miles from Grand Avenue in Downtown Los Angeles to Ocean Avenue in the City of Santa Monica. 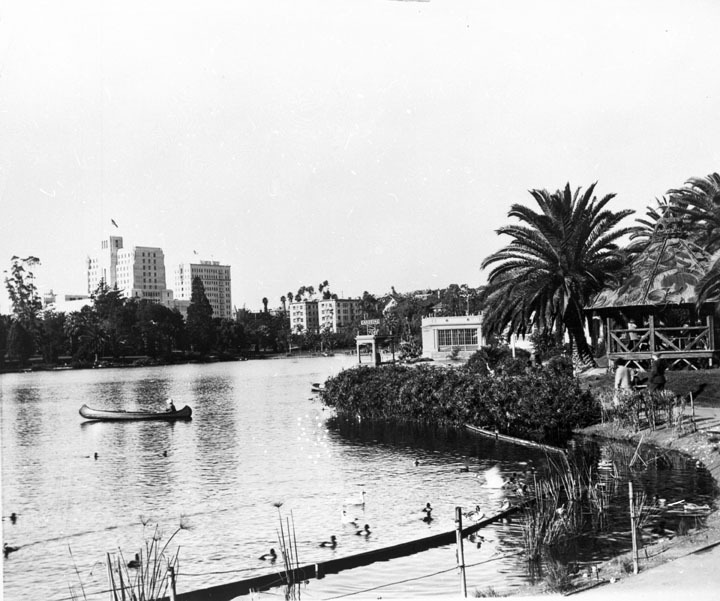 MacArthur Park was designated city of Los Angeles Historic Cultural Monument #100. Click HERE to see the LA Historic-Cultural Monuments List. 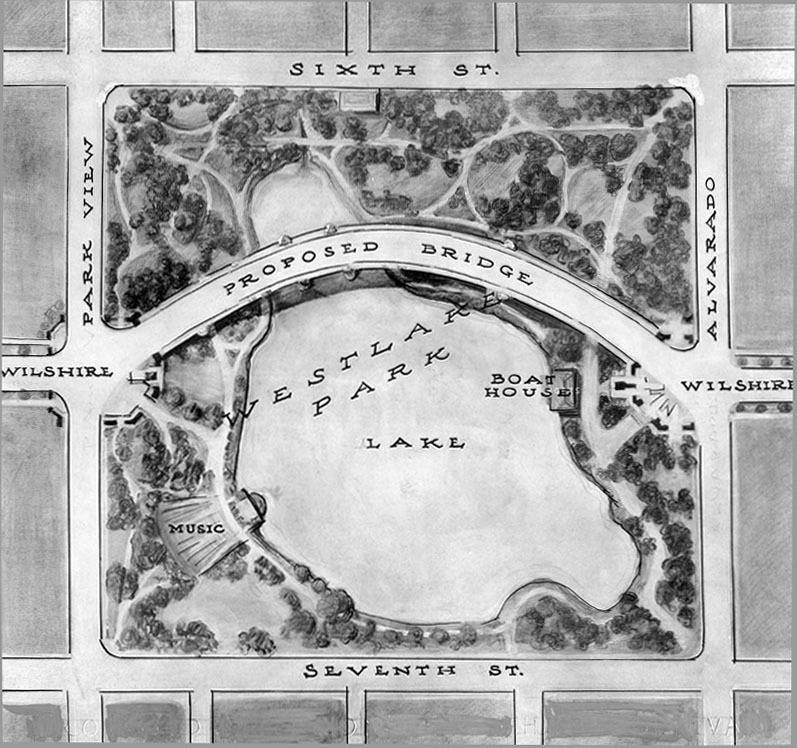 Click HERE to see more Views of Westlake Park as it appeared in the 1880s. 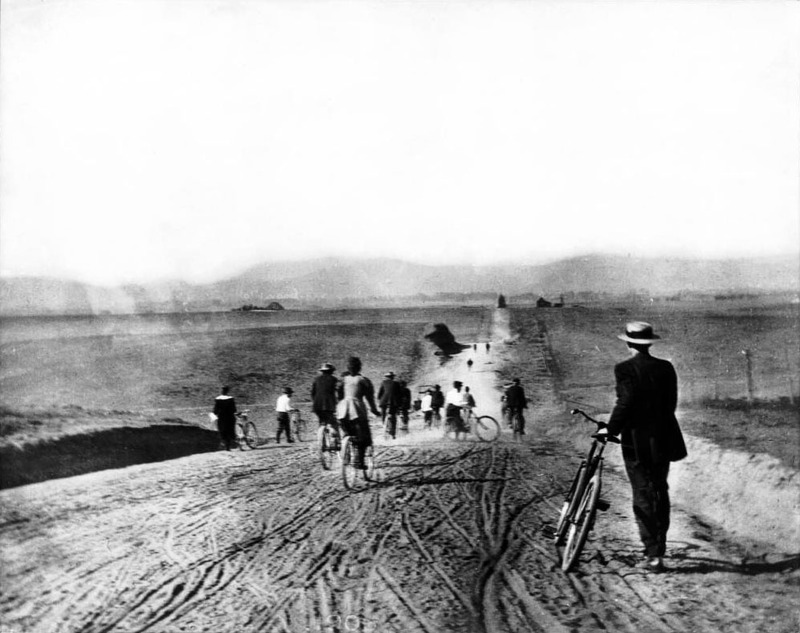 (1895)^^ - View showing the Los Angeles Times Bicycle Club on Western Avenue north of Pico. Western Avenue, apart from Sepulveda Boulevard, is one of the longest north–south streets in Los Angeles. The name of the street is derived from its history as the westernmost border of Los Angeles before annexations in the early 20th century expanded the city. 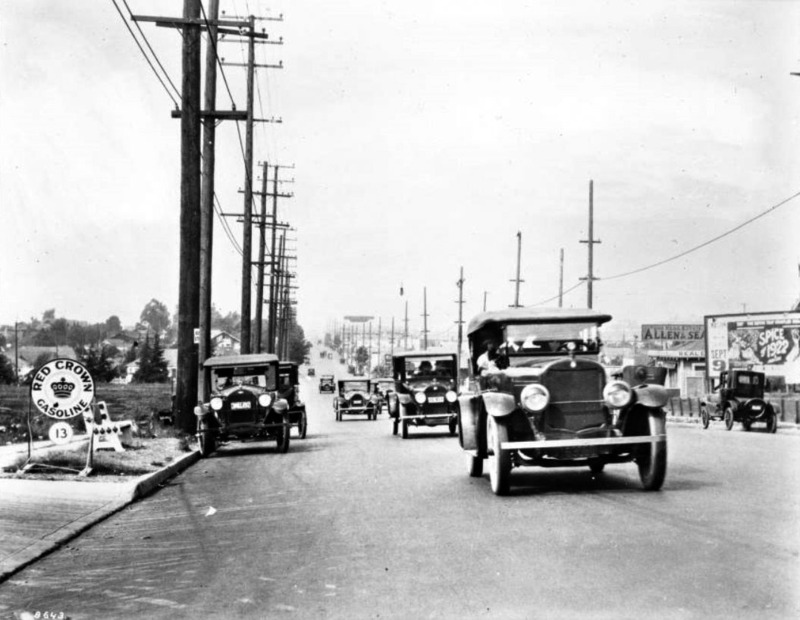 (1920s)^ - View of Western Avenue, looking north from Beverly Blvd. toward the Hollywood Hills. Several businesses and automobiles can be seen along Western with residential homes riddling the rest of the view. 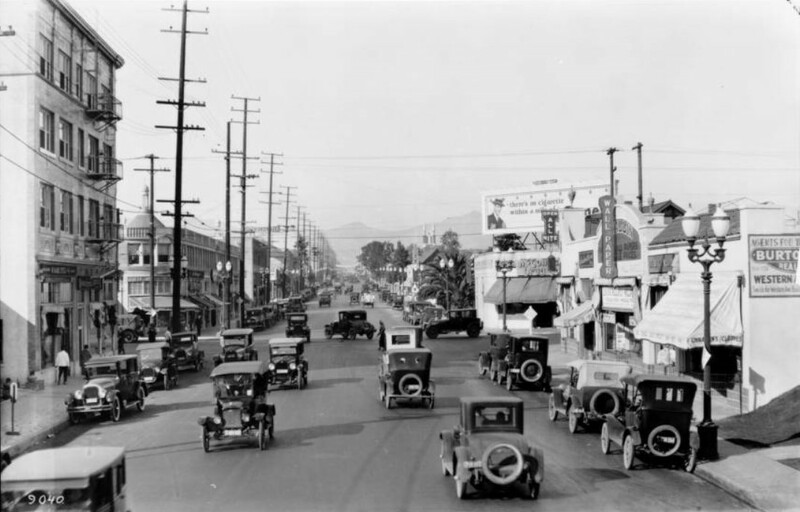 (1924)^^ - View looking north on Western Avenue at Beverly Blvd. This intersection looks like its in need of a traffic signal. Note the unusual triangular sign attached to a power pole on the upper right. It reads: CAR STOP. (ca. 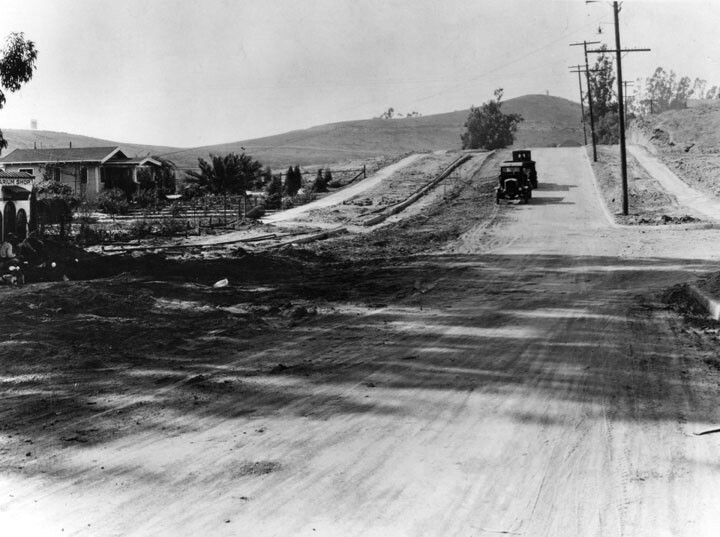 1924)^^ - View of Western Avenue looking north from 1st Street toward the Hollywood Hills. (ca. 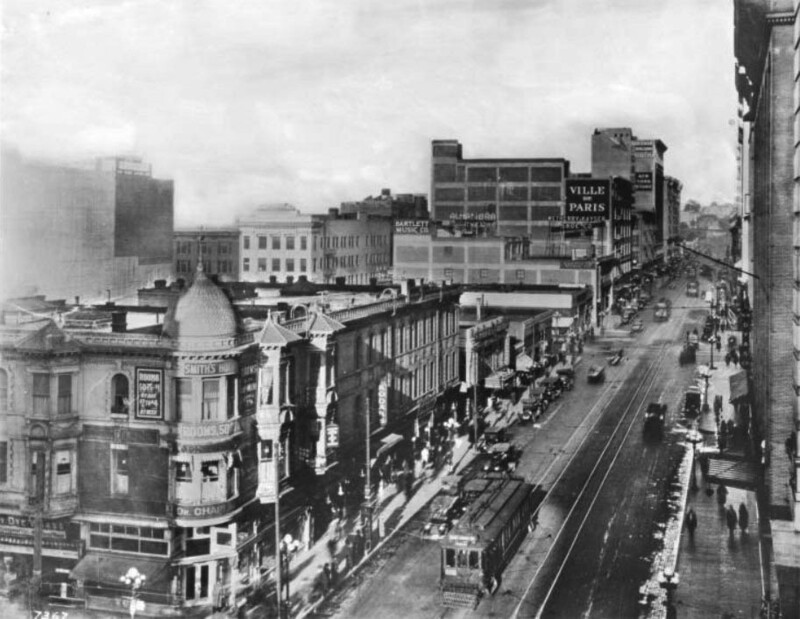 1924)^^ - View looking north on Western Avenue at 6th Street. (ca. 1924)^^ - View of Western Avenue looking north from 7th Street. Automobiles and a horse-drawn carriage make their way towards the viewer at left, while other traffic, a small bus amidst it, moves down the paved road to the right. (ca. 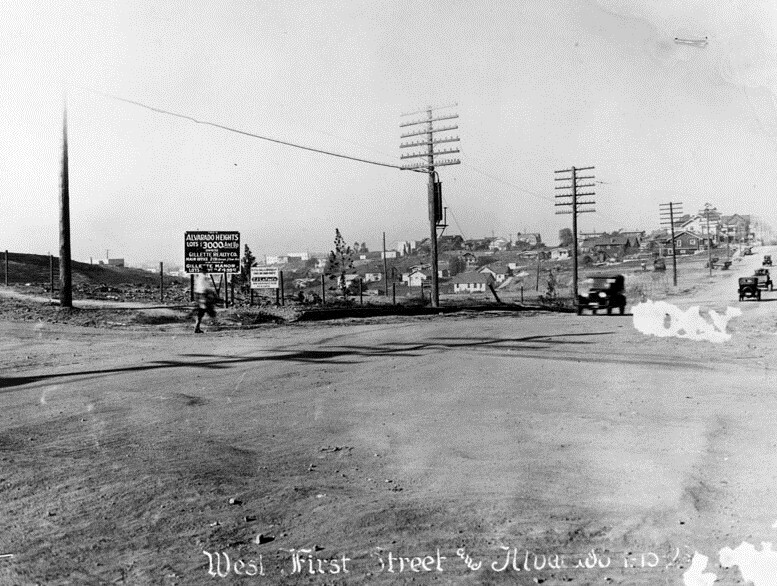 1924)^^ – View showing the intersection of Western and Vernon avenues. One automobile crosses the width of the image on Vernon, while the majority of the other autos, including a bus and a lightly-colored car, make their way up and down Western. On the corner to the left, the two-story brick building of the Bernard Drug Company can be seen, just in front of the Benson Market building, where pedestrians can be seen making their way along the sidewalk. More pedestrians can be seen crossing the intersection at the extreme right of the photo. Gas at the Gas Station on the right is going for 17 cents/gallon. Click HERE to see more early LA Gas Stations. (ca. 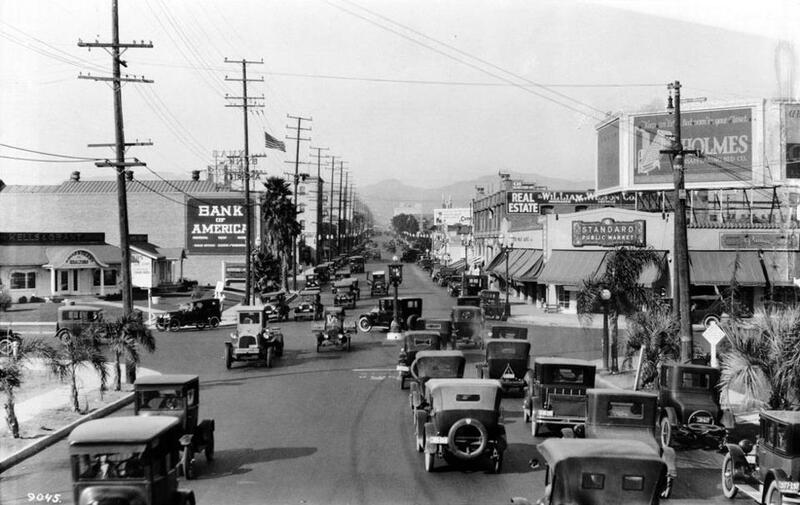 1924)^^ - Street view looking north on Western Avenue at Wilshire Boulevard. Note the traffic signal in the middle of the intersection. 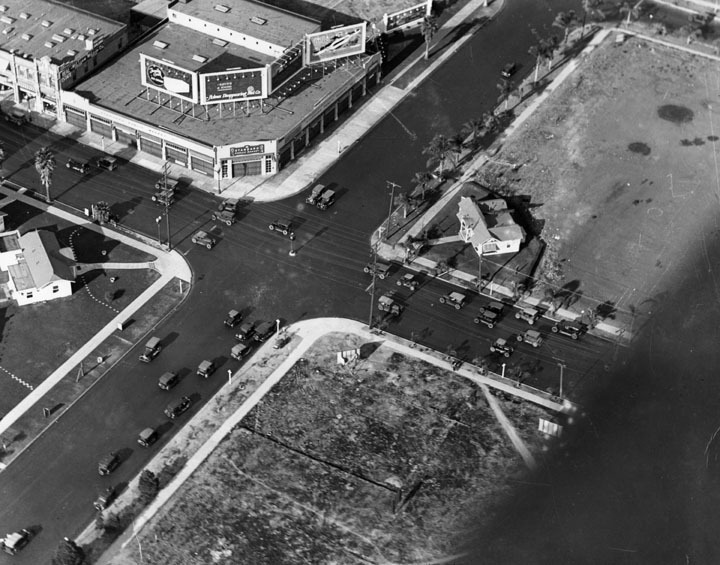 (1924)^ - Aerial view of the intersection of Wilshire Boulevard (running bottom left to upper right) and Western Avenue with traffic signal in the middle of intersection. Both corners on the right side of the picture are so far undeveloped, although there is a real estate office on one corner. 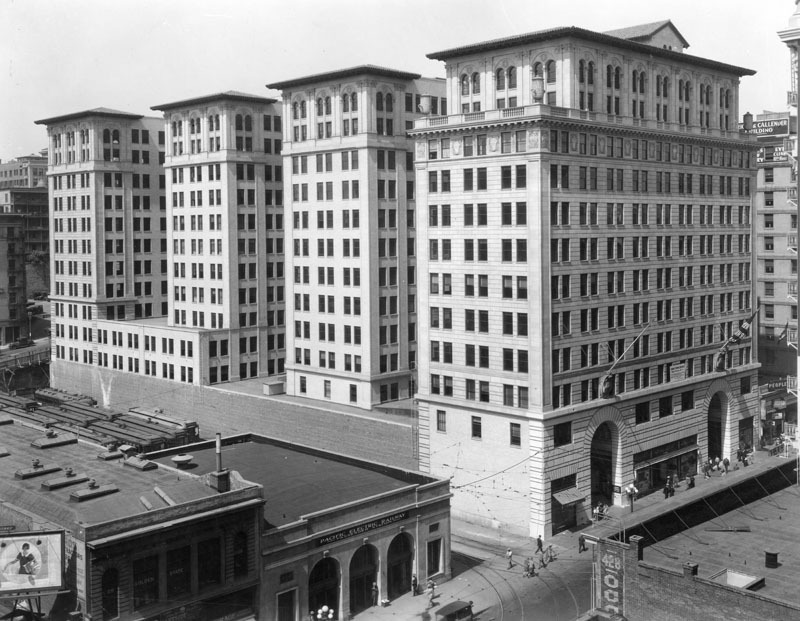 The Pellissier Building and Wiltern Theatre would be built in 1931 on the southeast corner of Wilshire and Western (upper-right), where the real estate office is locted. 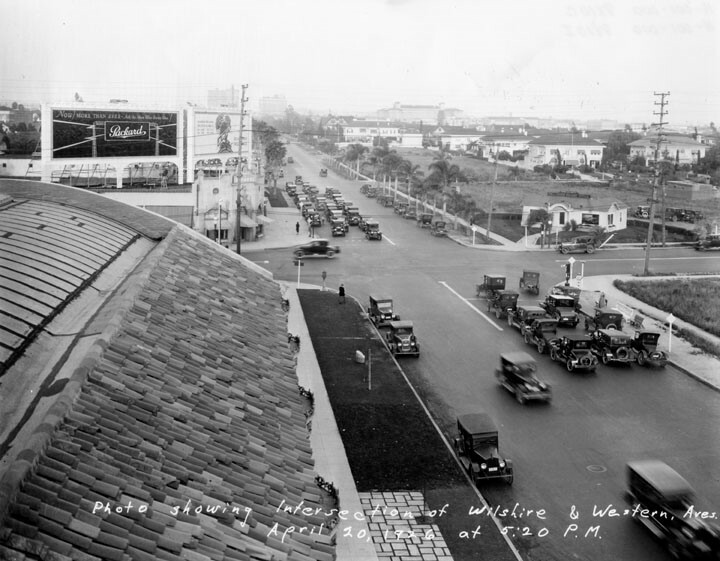 (1926)^ – Rooftop view looking east on Wilshire Boulevard showing stopped cars while cross traffic on Western Avenue passes. Across the street on the S/E Corner (upper-right) stands a real estate office building. This will be the location of the Pellissier Building and Wiltern Theatre. 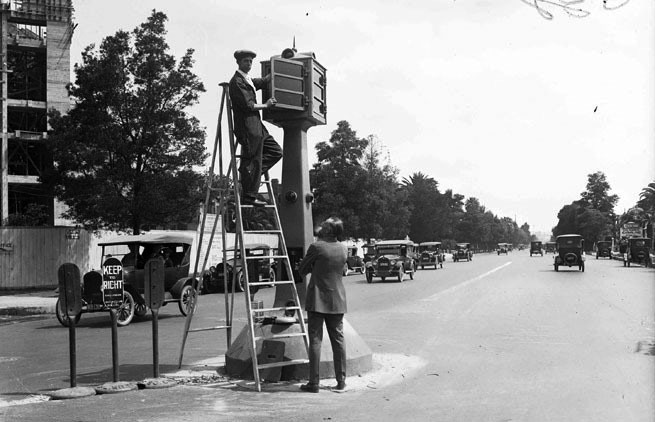 (1926)^ - Street view looking east on Wilshire Boulevard from Western Avenue showing newly installed traffic signal. 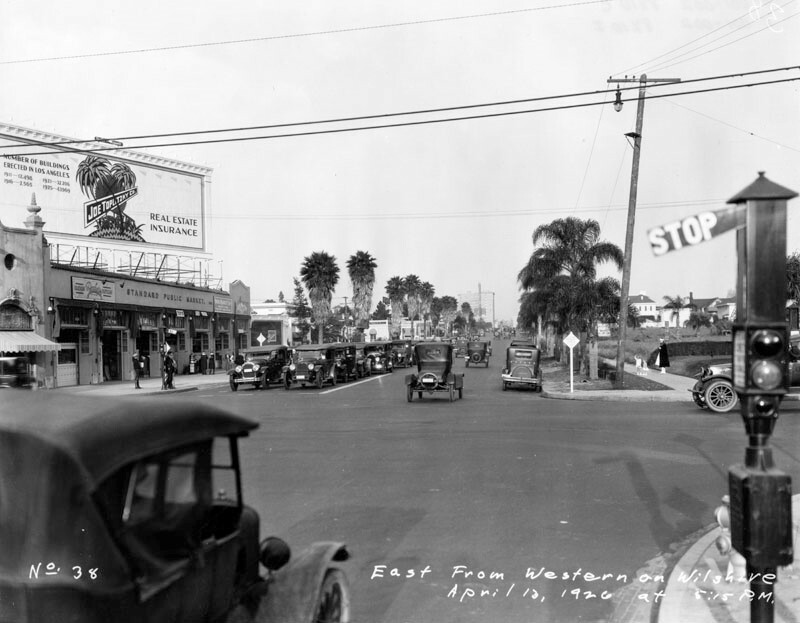 (1926)^ - View looking west on Wilshire Boulevard at Western Avenue. Traffic is stopped whiule a pedestrian crosses Wilshire. 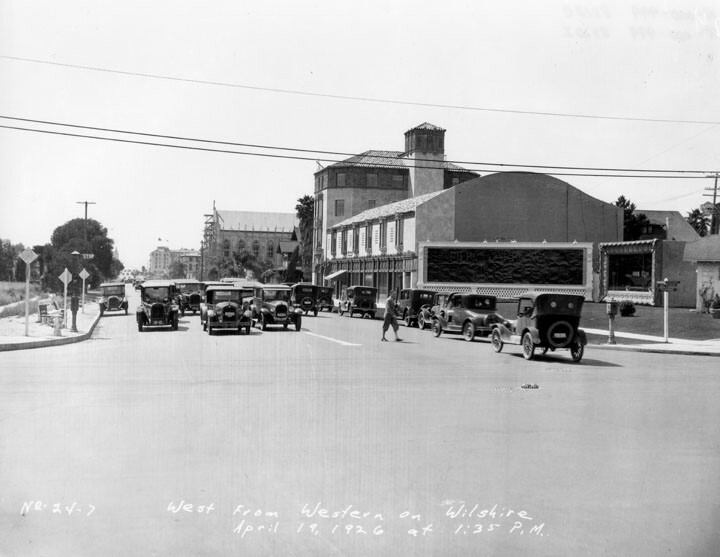 Click HERE to see more Early Views of the Wilshire and Western intersection (1929 - 1931). (ca. 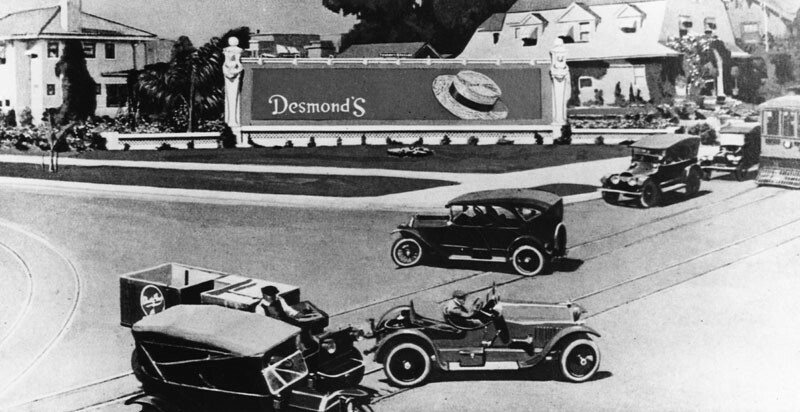 1924)^ - View showing the intersection of 3rd and Rampart with a billboard in the background advertising for Desmond’s Clothing Store. 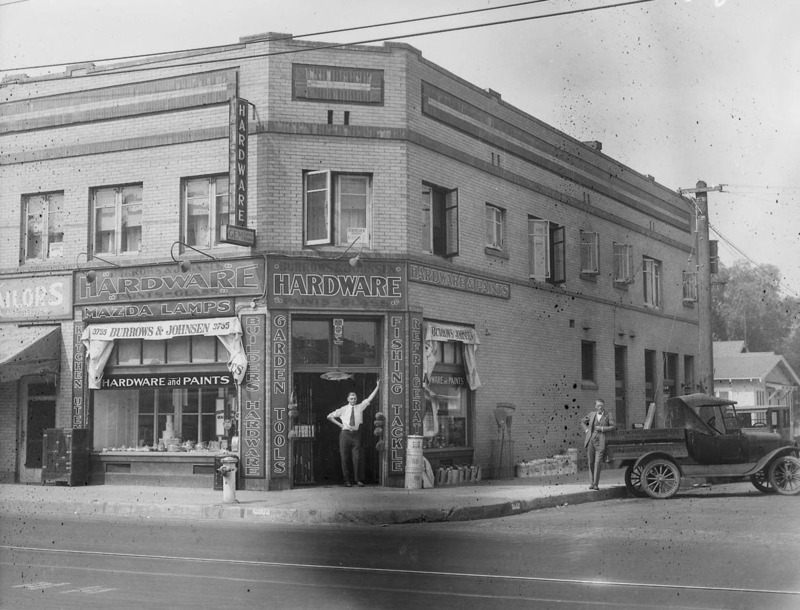 (1924)^^ - View of a man standing in the doorway of Burrows & Johnson Hardware Store, at 3755 S. Vermont Ave. Another man is leaning on a truck parked diagonally against the curb. (1925)^*#* - View from the USC Student Union building, looking north at Bovard and University Avenue (now Trousdale). 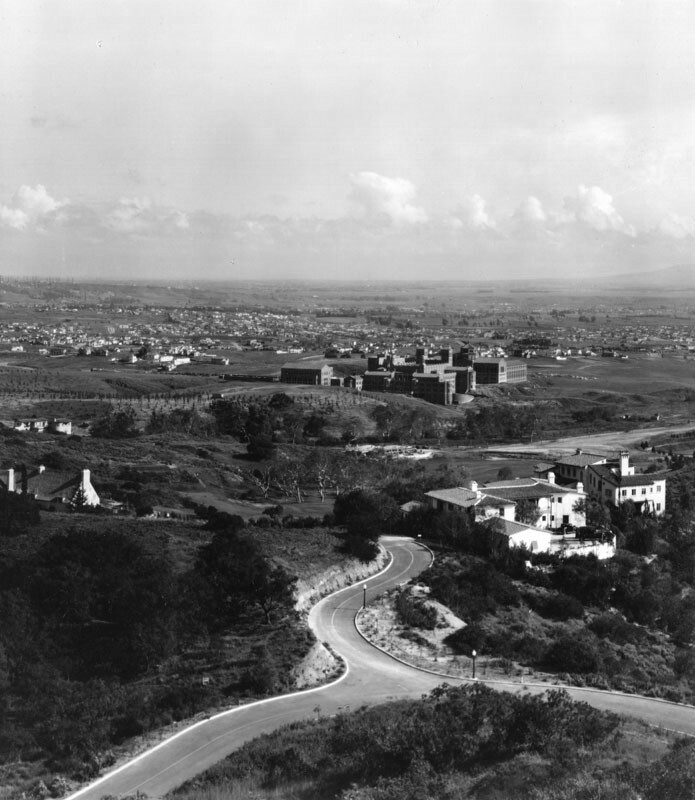 (1924)^ - Panoramic view of Rancho Cienega O' Paso de la Tijera located on the 2400 block of S. Crenshaw Boulevard in the Baldwin Hills area, looking east. It shows an adobe, as well as several small buildings and a few trees, clustered inside a fenced-in area. Rancho La Cienega O' Paso de la Tijera was a series of adjoining adobe structures located on the eastern side of the Baldwin Hills in an area determined to be approximately 4,481 acres. (1924)^ - View of Rancho Cienega O' Paso de la Tijera shows two adobes, a single-story on the left, and a two-story on the right; another smaller building is visible in the background between the adobes. The Rancho La Cienega O' Paso de la Tijera area remained unclaimed for many years following the first Spanish settlements in California. Squatters from the pueblo considering these lands public and built the La Tijera adobe as early as 1790 or 1795 for the purpose of raising cattle on surrounding land. In 1843, Manuel Michaeltorrena (then Mexican Governor of Alta California) formally granted Rancho La Cienega O' Paso de la Tijera to Vicente Sánchez. Rancho La Cienega O' Paso de la Tijera was declared Los Angeles Historic-Cultural Monument No. 487 on May 1, 1990 (Click HERE to see complete listing). 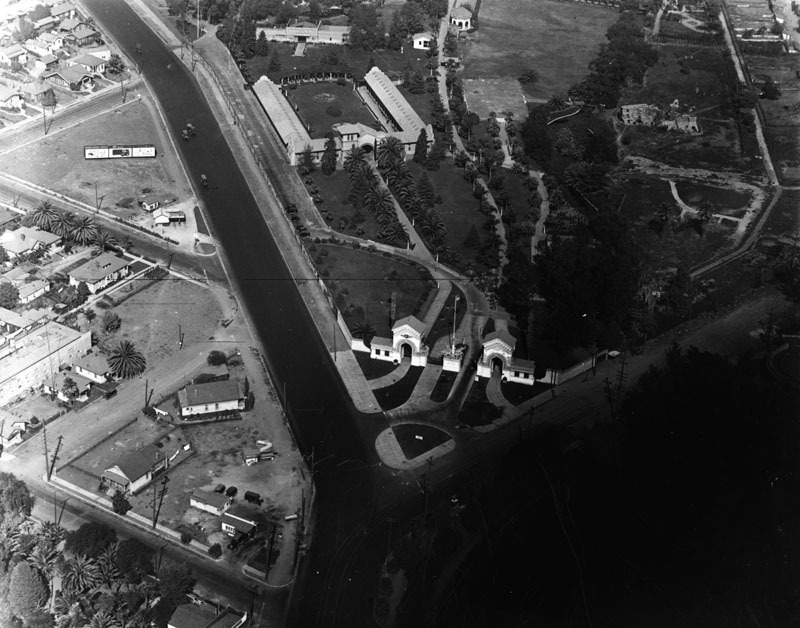 (1924)^ - Aerial view looking east from Western, towards Olympic Boulevard, La Cienega and Carthay Circle. 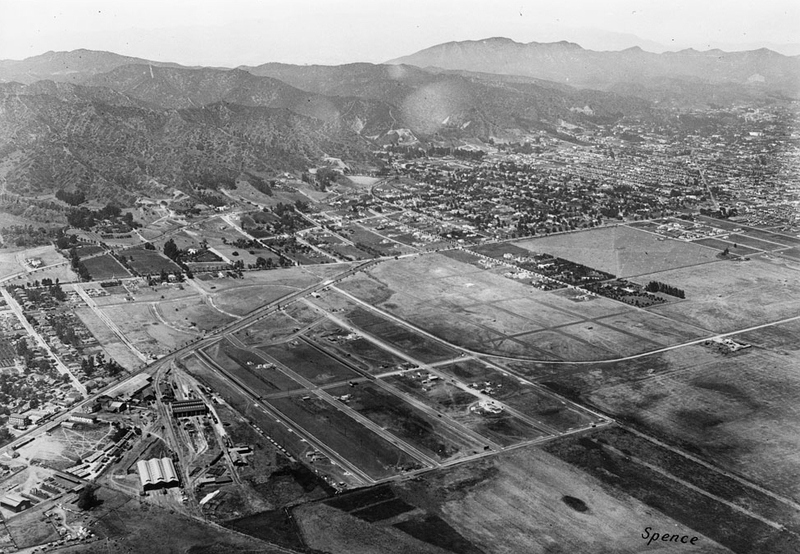 (1924)^ - Another aerial view looking east from Western, towards Olympic Boulevard, La Cienega and Carthay Circle. (ca. 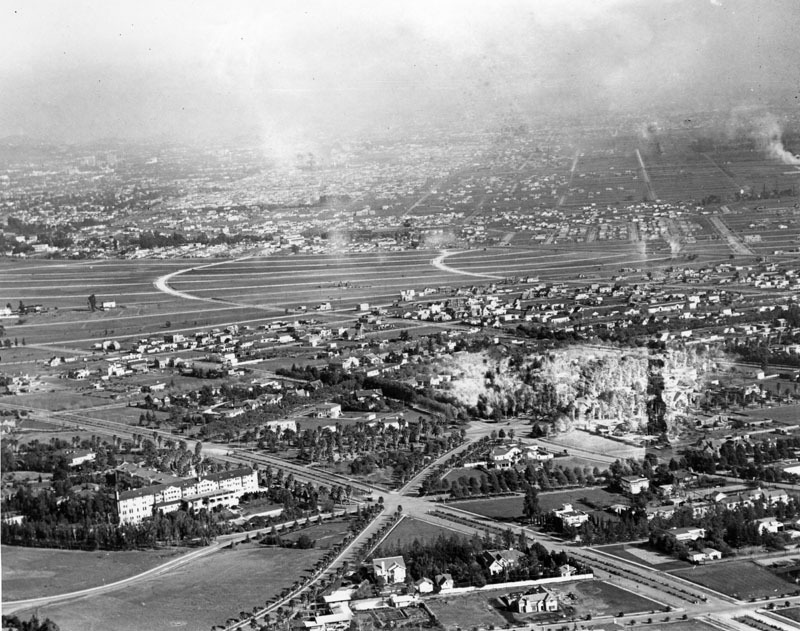 1924)^ - A panoramic view of Beverly Hills and neighboring cities, seen from an airplane. Especially noticeable is an area where 6 roads all meet. To the left of that intersection the Beverly Hills Hotel can be seen. (ca. 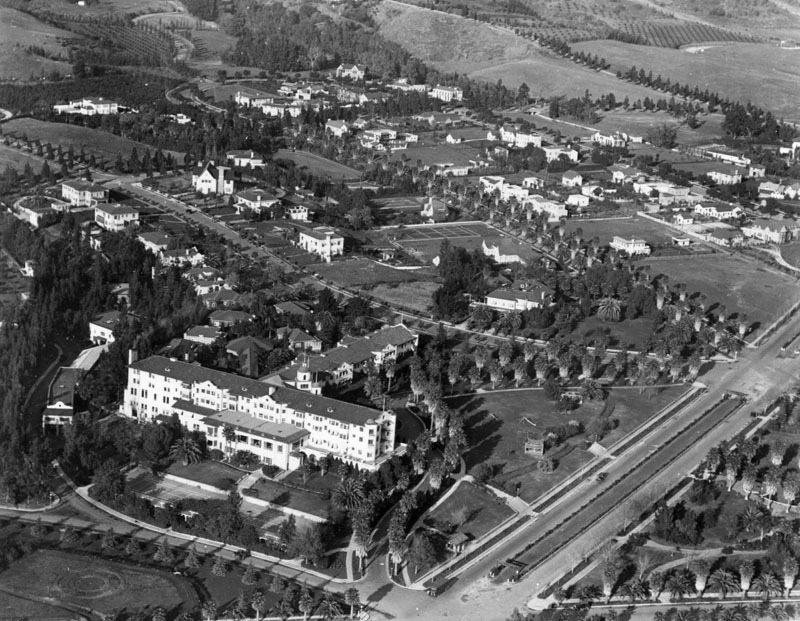 1924)^ - Aerial view of Beverly Hills, with the Beverly Hills Hotel in the foreground, located on Sunset Blvd. A number of homes have been built in the development. Elmer Grey was the architect of the hotel, built in Mission Revival style in 1911-1912. Click HERE to see more Early Views of Beverly Hills. (ca. 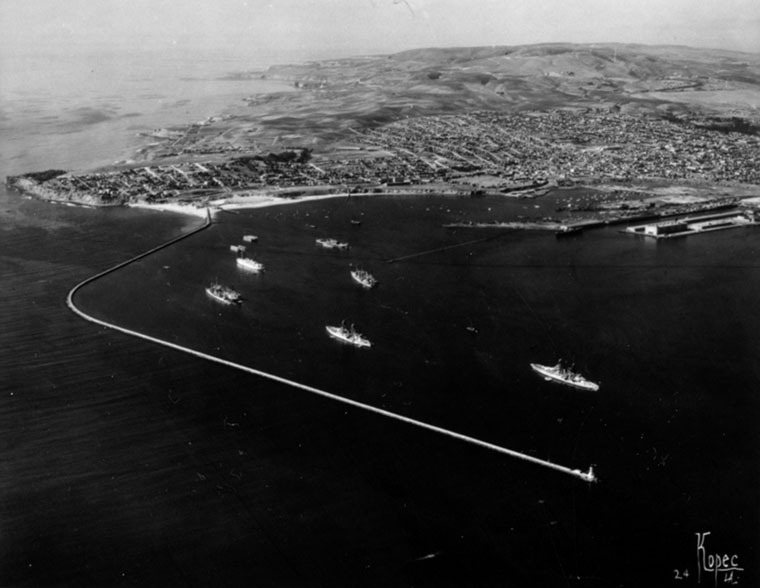 1924)^ - Aerial view of Point Fermin, Palos Verdes and hills, government breakwaters and the outer harbor. Ships can be seen in the harbor. 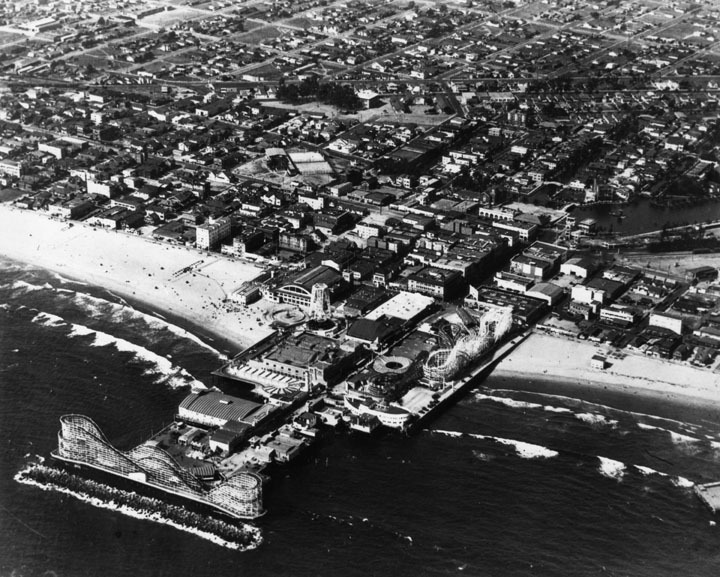 (1923)*#^ – Birdseye view of the Southland showing the beachfront communities between Santa Monica and Long Beach. Note the undeveloped land between Los Angeles and the ocean. At left can be seen the proposed site of a new Universtiy in Palos Verdes. Turns out this was one of the sites proposed for the UCLA campus. (ca. 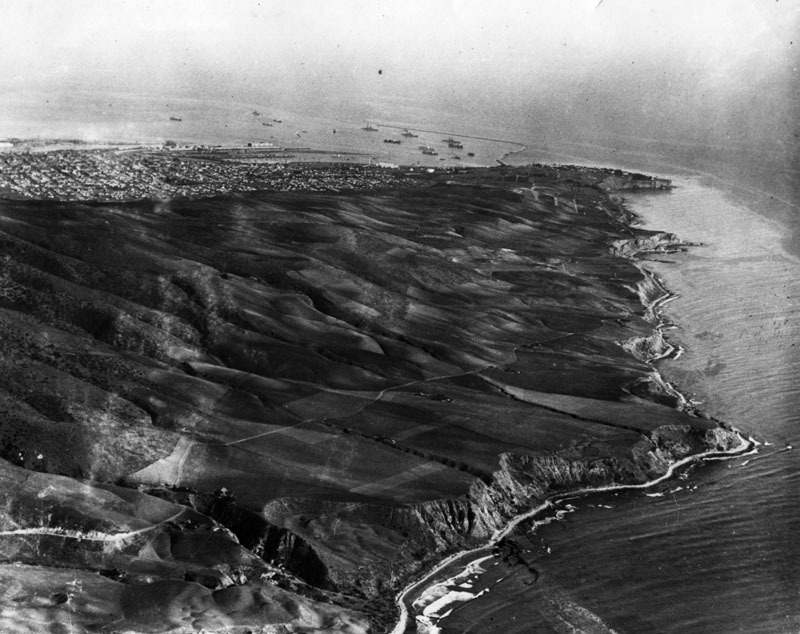 1920)^.^ - Aerial view looking north showing the Palos Verdes Peninsula. Click HERE for contemporary view. 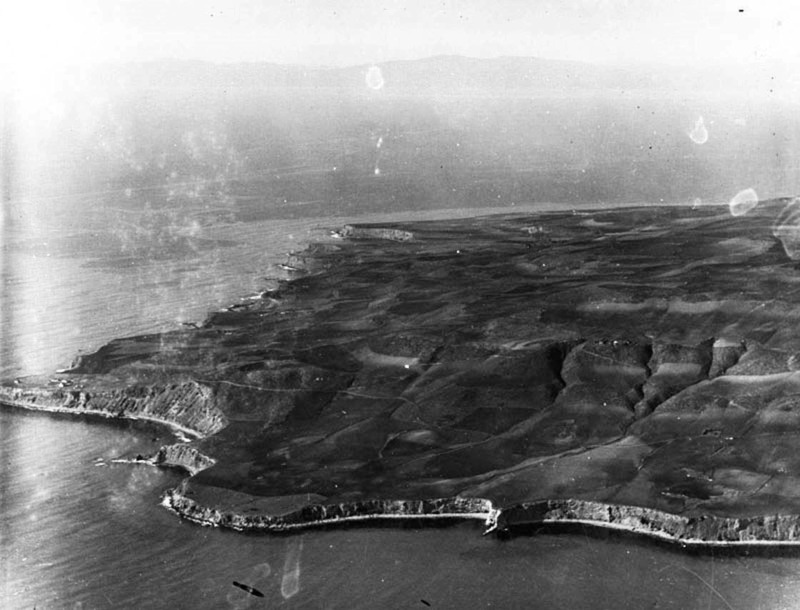 (1924)^ - Aerial view of the Palos Verdes Peninsula, looking southeast towards Point Fermin. San Pedro Harbor can be seen in the background. 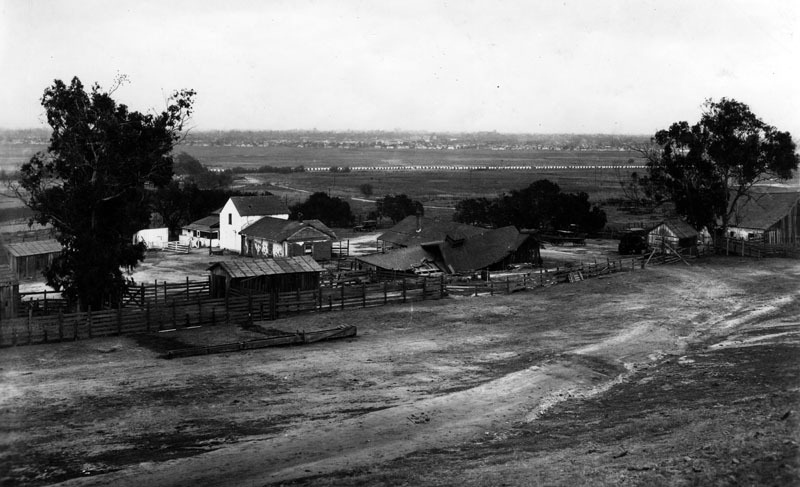 In 1882 ownership of the 16,000 acre hill was passed to Jotham Bixby who used the land as a cattle ranch and also leased Rancho De Los Palos Verdes to Japanese farmers who built the first roads on “the hill”. Bixby’s Forman Harry Phillips built the first permanent residence in 1894 and planted Eucalyptus trees. (1923)^ - Panoramic view from Palos Verdes Drive North looking southwestwardly toward the early construction of Malaga Cove Plaza. (ca. 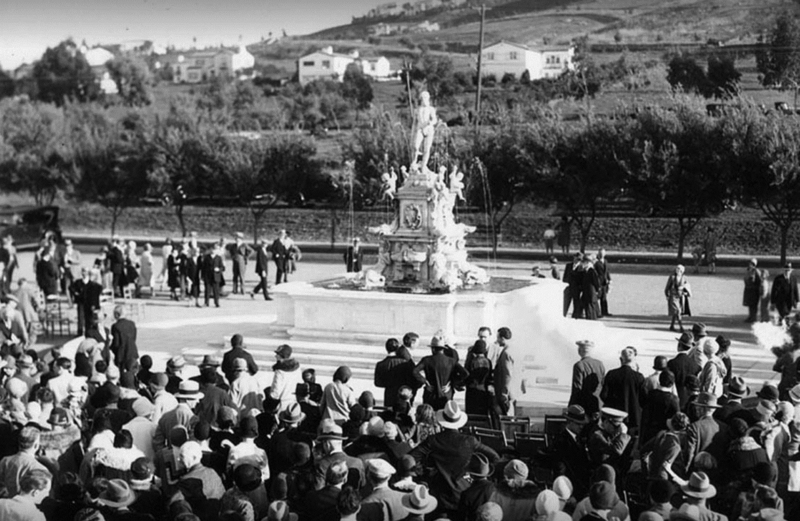 1928)^v^ - Dedication of the fountain at Malaga Cove Plaza. (ca. 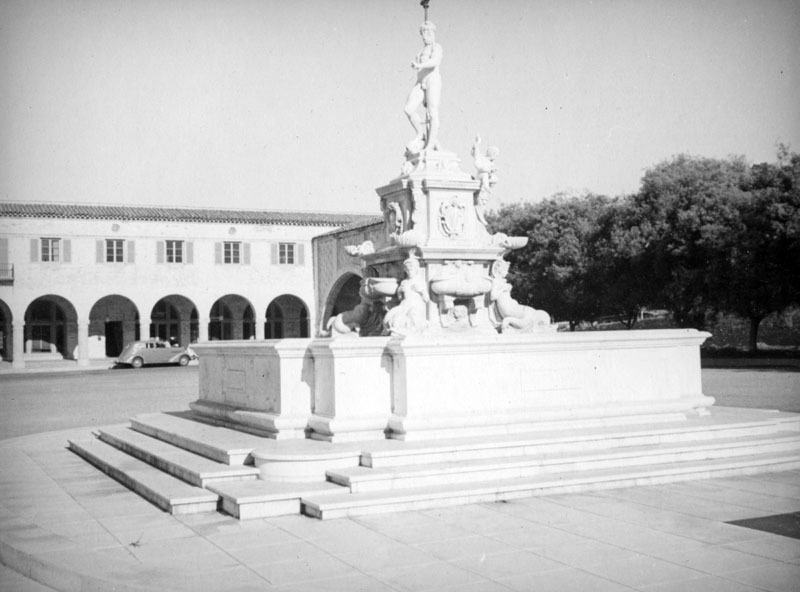 1937)^ - Close-up view showing the 19th century white marble fountain in the center of the Malaga Cove Plaza, decorated with dolphins, sea shells and a mermaid, and topped by the heroic figure of Neptune, the god of the sea who looks out at the ocean. 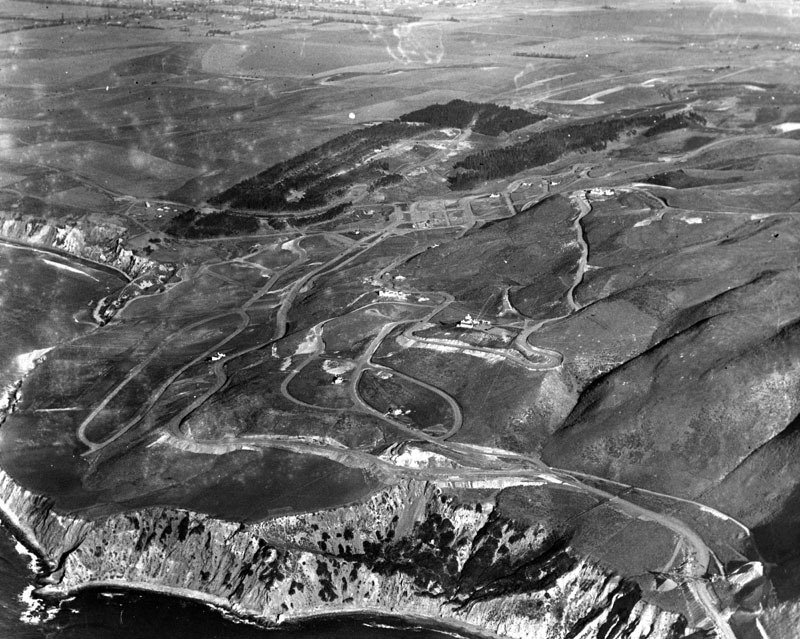 (1925)^ - Aerial view of Palos Verdes. Most of the land on the peninsula and beyond is yet to be developed. 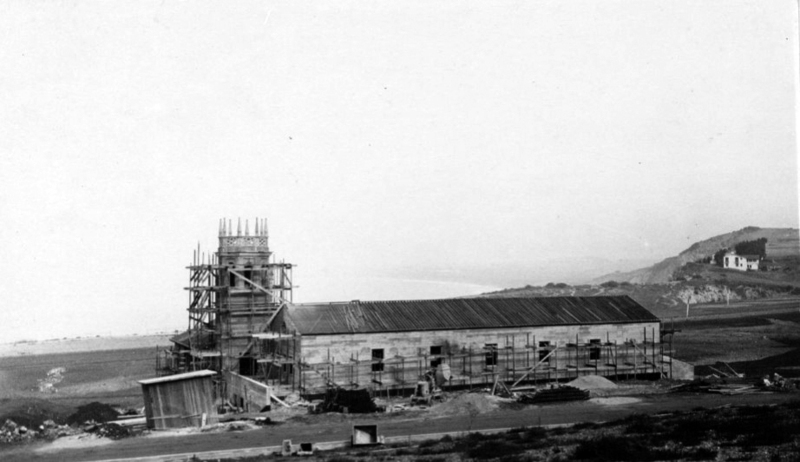 (1926)^*## – Panoramic view looking northeast showing the construction of Malaga Cove School, located at 385 Via Almar in Malaga Cove. Malaga Cove School opened on April 5, 1926. The roof is in place, and scaffolding surrounds the tower. Visible in background at far right is the Frederick Law Olmsted Jr. residence, located on Rosita Place, which was demolished in 1971 due to bluff erosion. By April of 1926 there were 35 students and 3 teachers at Malaga Cove School with 3 classrooms, a large 294 seated auditorium, dressing rooms, plus offices, toilet rooms, and a community kitchen. Malaga Cove School is now the hub of the hill and multiple events are at the school. 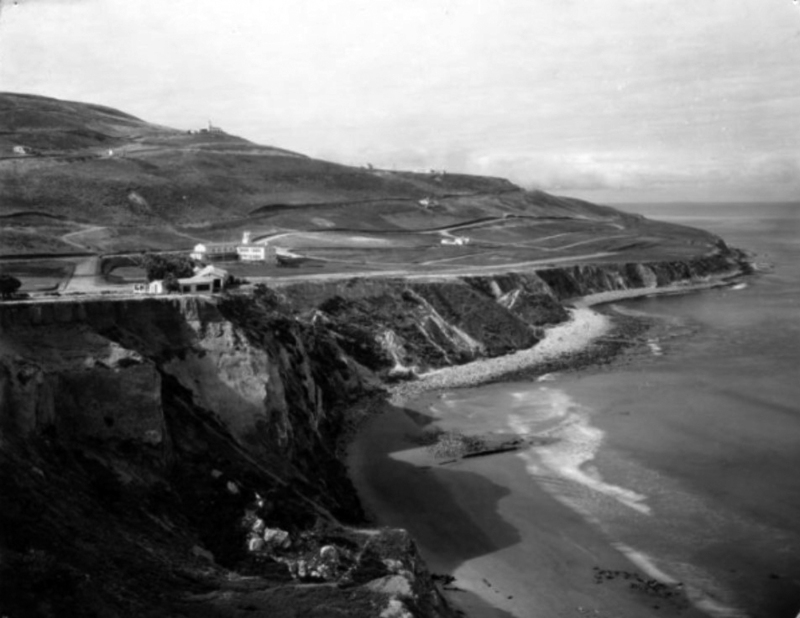 (1920s)^*## – Elevated view looking south with the Frederick Law Olmsted Jr. residence located on Rosita Place at far left overlooking the cliffs of Malaga Cove. The house was demolished in 1971 due to bluff erosion. 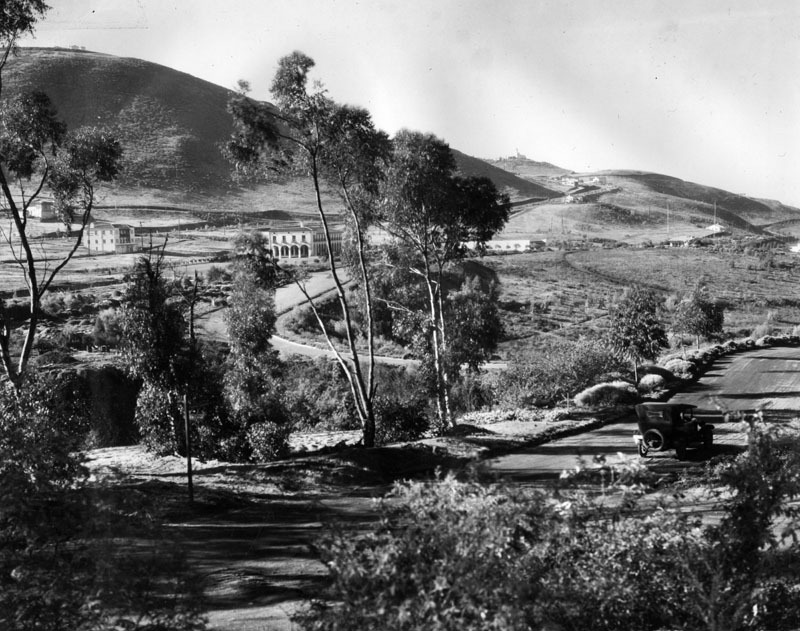 Malaga Cove School is beyond the Olmsted house, with La Venta Inn visible along hilltop in background. 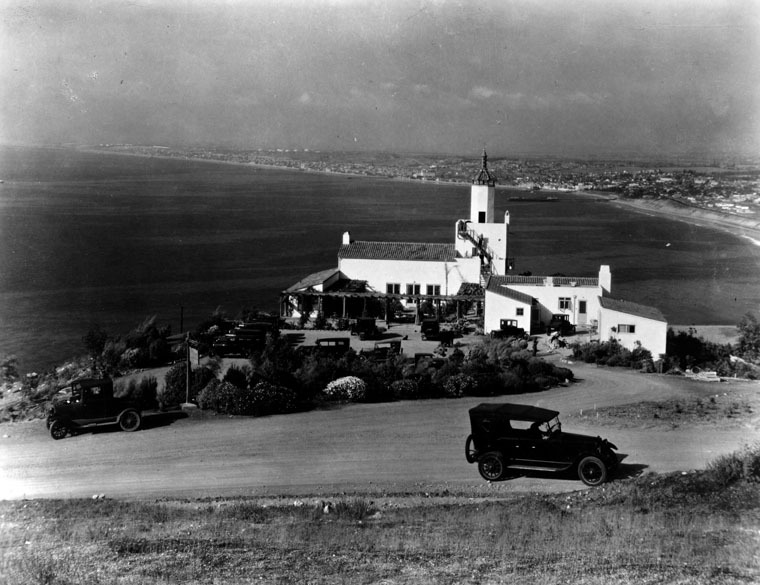 (1926)^ - A scenic point of the Palos Verdes Peninsula, showing La Venta Inn in Palos Verdes Estates and the coastline from Redondo Beach on. 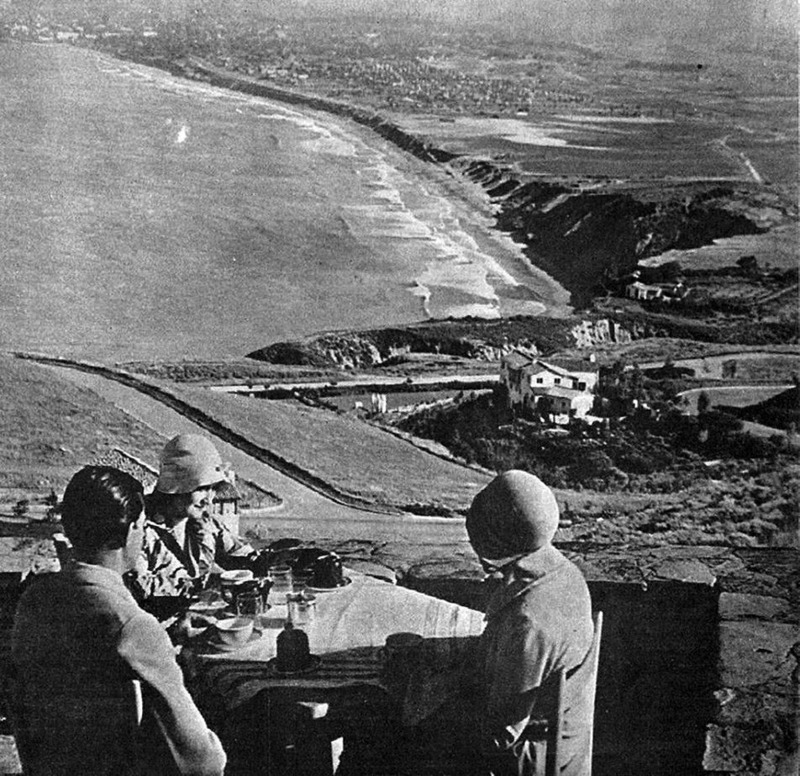 (1930s)^.^ - View looking north from the patio of La Venta Inn in Palos Verdes. 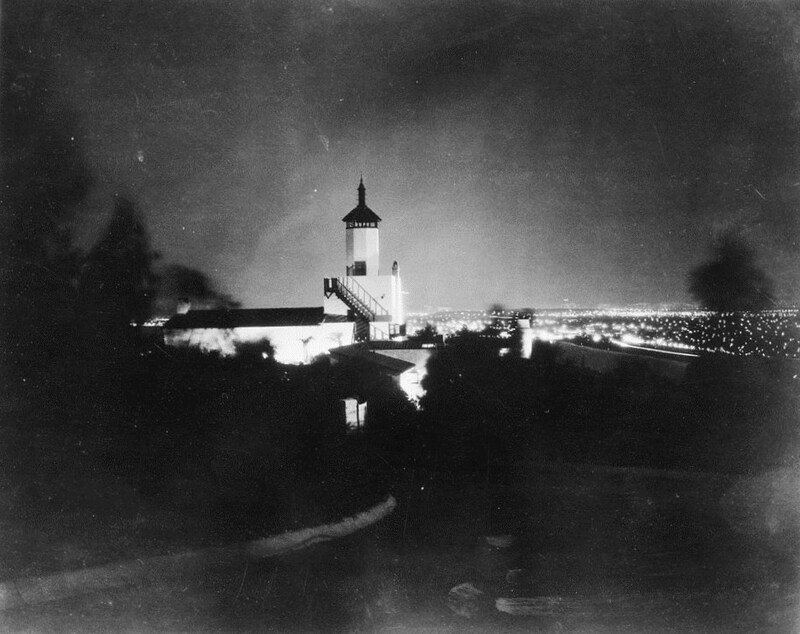 (1930)^^ - Exterior view of the La Venta Inn at night, Palos Verdes, April 1930. 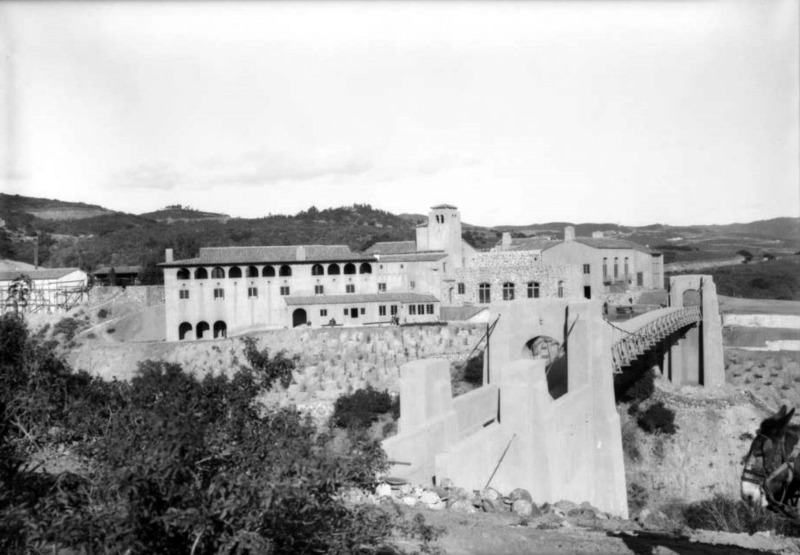 (1930s)^.^ – Close-up daytime view of the La Venta Inn. (ca. 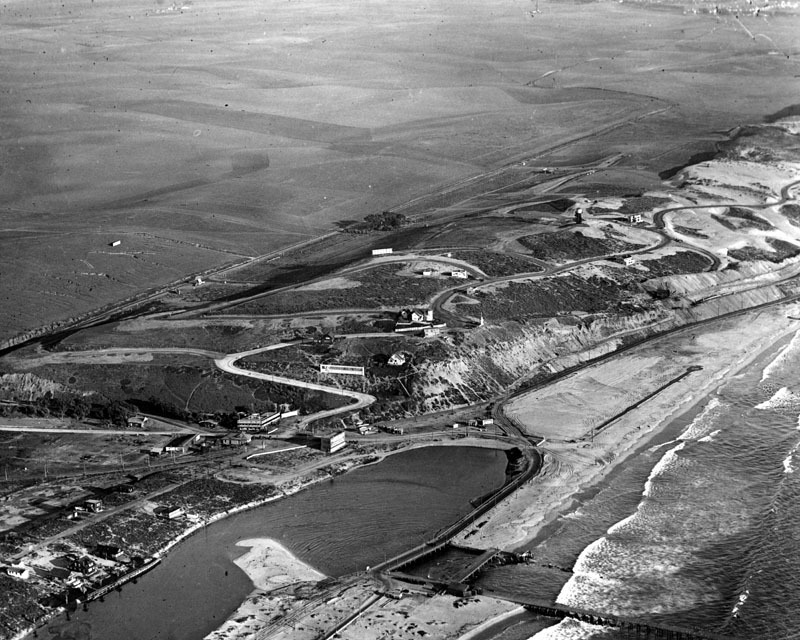 1924)^ - Aerial view of Playa Del Rey showing the area called "Surfridge". A small airfield opened to the east of Surfridge in 1928. It became a popular location for residents to see air shows. The growing number of commercial flights into Los Angeles following World War II meant a higher number of planes flying low over Surfridge. Many residents learned to co-exist with the noise from propeller planes, but jet engines were impossible to ignore. (1924)^ - Looking straight ahead at the houses you see a complex of rental bungalows known as United States Island. It was accessible only by the foot bridges seen on either side of it. In this view, looking north, Altair Canal is on the left and Cabrillo Canal on the right. 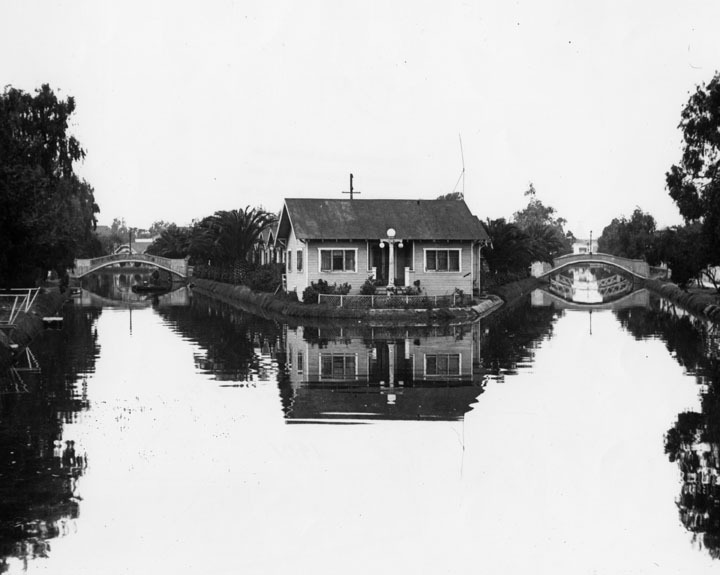 Click HERE to see more Early Views of the Venice Canals (1904+). 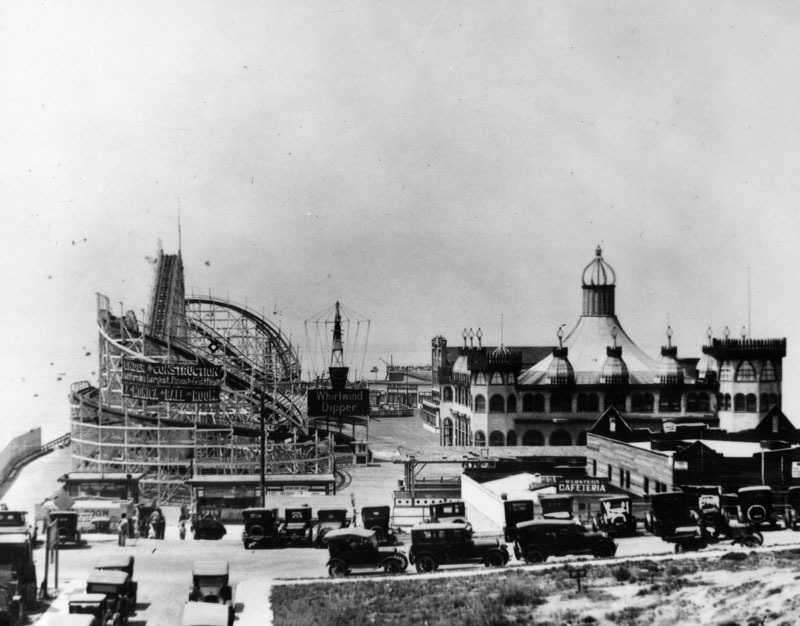 (1924)^ - View shows an amusement park, complete with wooden roller coaster, on the Santa Monica pier. In 1987, the Santa Monica Looff Hippodrome was added to the National Registry of Historic Places. (ca. 1925)^ - Aerial view of Venice, its beach and pier. The canals are visible at the extreme right. 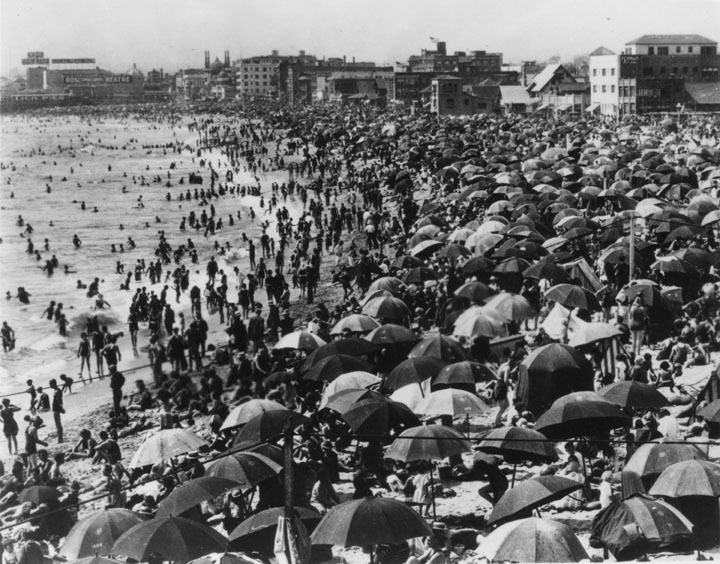 (1925)^ - The ocean water is filled with people swimming or playing, and the beach is likewise filled with people and umbrellas (to keep off the sun). The view is looking north towards Ocean Park where some buildings and part of Lick Pier are visible. 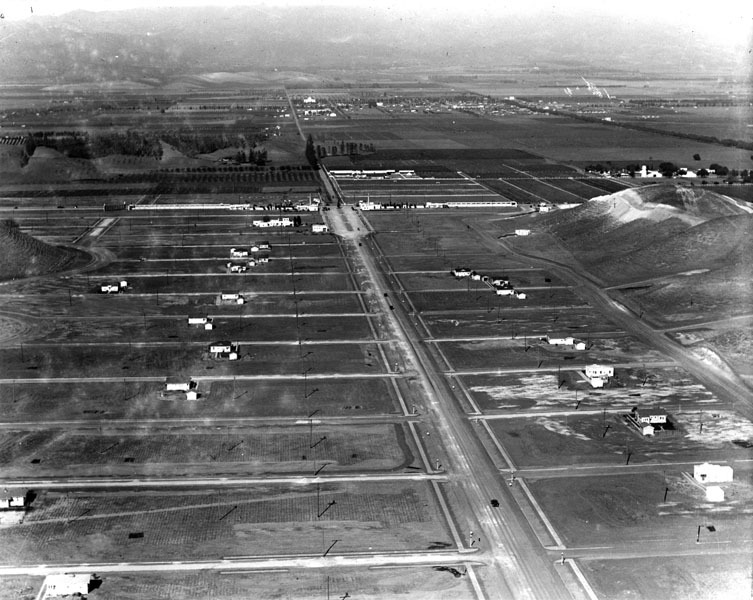 (1924)^ - Aerial view of Woodland Hills (Girard) in 1924. Victor Girard Kleinberger was a land huckster with big dreams. Born in Kentucky, he began his sales career peddling Persian rugs -- fakes, of course -- door to door. Girard's modus operandi was to shove the rolled-up rug into the door frame (thus preventing the door from being slammed shut on him) and begin coughing profusely -- all the while mumbling about tuberculosis and priceless rugs. 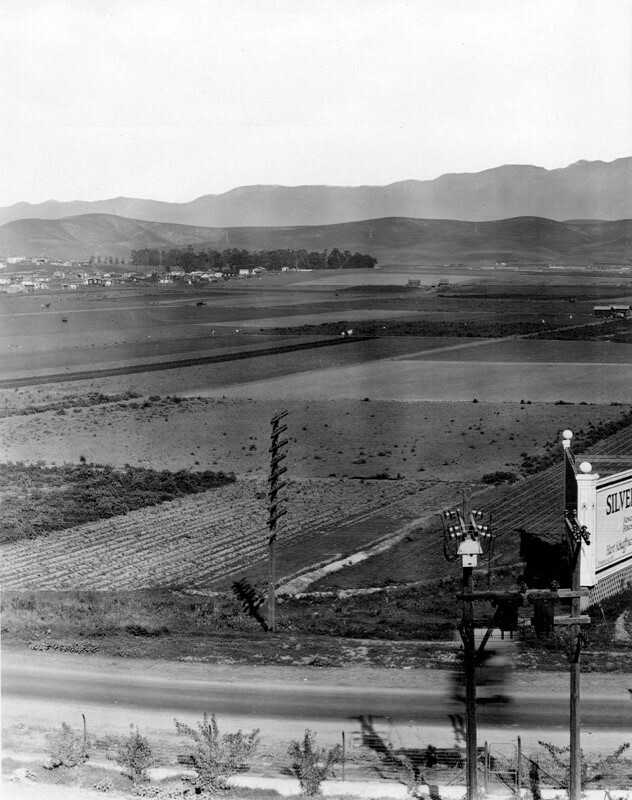 In 1922, Girard Kleinberger bought 2,886 acres in the west San Fernando Valley and founded the town of Girard. He sought to attract residents and businesses by developing an infrastructure, advertising in newspapers, and planting 120,000 trees. His 300 pepper trees forming an arch over Canoga Ave. between Ventura Boulevard and Saltillo St. are Los Angeles Historic-Cultural Monument #93 in 1972 (Click HERE to see the LA Historic-Cultural Monuments List***). (ca. 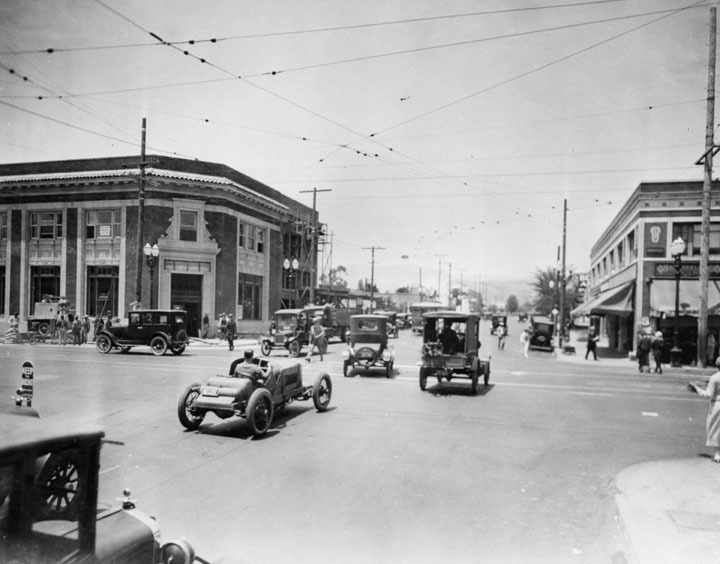 1924)^ - This is the intersection of today's Ventura Boulevard (foreground) and Topanga Canyon Boulevard, in the real estate development of Girard. 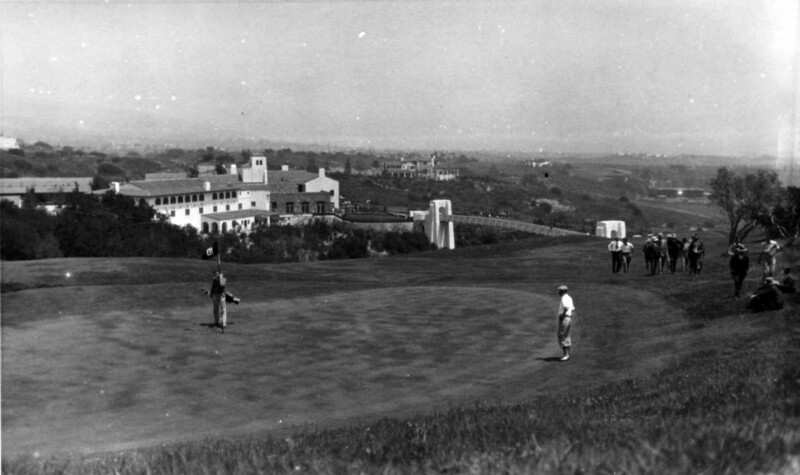 Although Girard Kleinberger's early efforts were criticized as providing only a dubious facade of economic activity (local lore has it that in order to attract development he erected false store fronts on Ventura Boulevard, for which he spent time in jail), the Girard Golf Course completed in 1925 continues to operate today as the Woodland Hills Country Club, and his scheme was ultimately successful in attracting interest in the community. 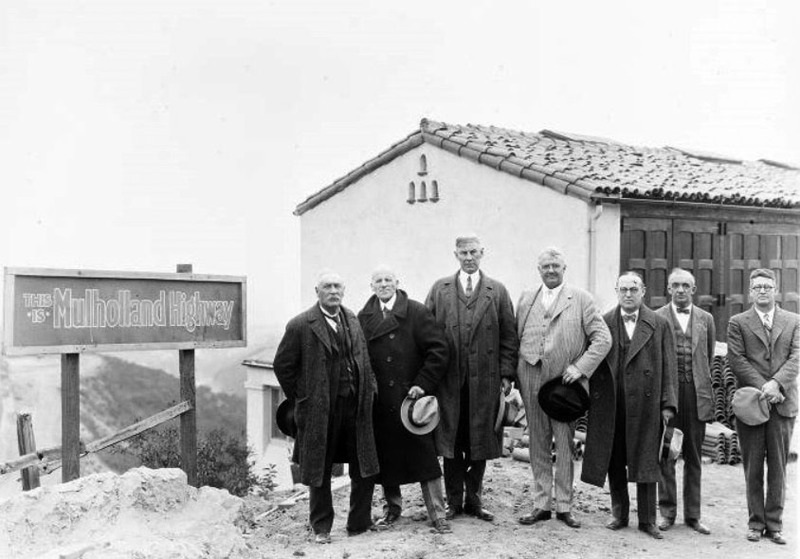 (1920s)*^#^ - William Mulholland (far left), Moses Sherman (2nd from left), Harry Chandler (center) and a group of men posing next to a "Mulholland Highway" sign while out examining the Mulholland Dam site. 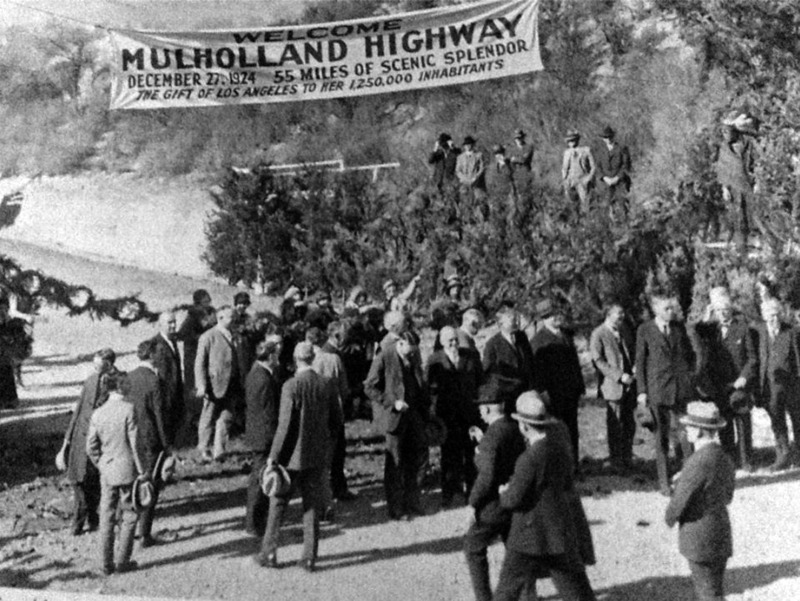 Mulholland Highway (later Mulholland Drive) has its origins in 1921 as a scenic drive, with the “working name” of Skyline Drive, engineered by DeWitt Reaburn. The scenic drive was engineered in small sections, with work actually beginning at several points along the route simultaneously. The road was originally planned to encompass a right of way of 200 feet and intended to be 20 miles long, taking a mere two years to complete. 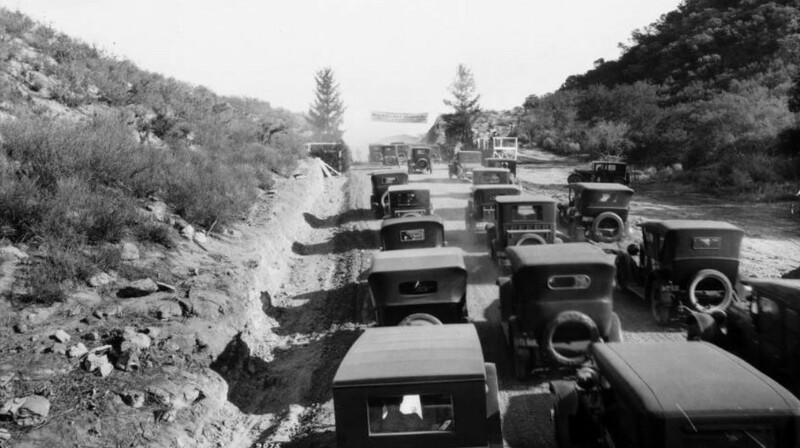 (1924)^^ - View of over a dozen early model cars clustered at the opening of the Mulholland Highway. Three rows of early automobiles make their way up the hill and through the mountains on the Mulholland Highway. Rocks and scrub vegetation cover the slopes to either side, a parked car and a wooden platform visible to the right, just off the road. At the peak of the hill, a banner is hung between two trees. 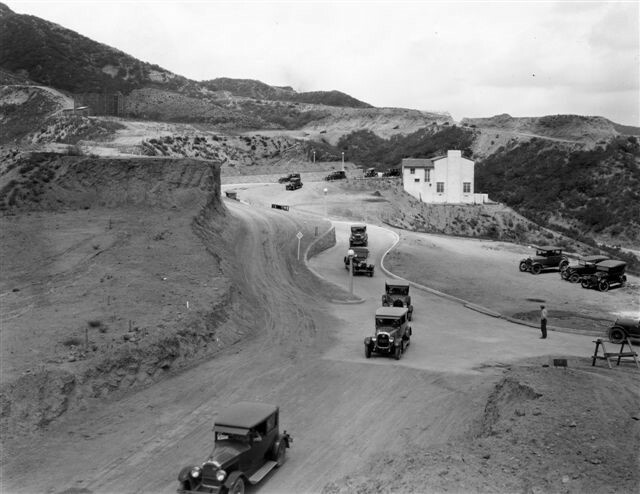 (1925)^ - View of Mulholland Highway under construction near Beachwood Canyon. Mulholland Highway curves around the western edge of Beachwood Canyon like a massive snake. A man-made thoroughfare buttressed by granite retaining walls, the Highway was built, like all the roads in Hollywoodland, in the mid-1920s. It contains both a split-level section (under construction in the photo above) and a cliff-side stretch locals call the blind curves. (ca. 1925)^*## – Postcard view showing two early model cars near the intersection of Mulholland Highway (later Drive) and Franklin Canyon. Curving ingeniously through the eastern Santa Monicas, the Mulholland Drive motorway once brought a heavy slew of Angelenos into the Valley. In the early 1970s, however, 5,000 local activists successfully prevented the cement paving of most of that stretch. 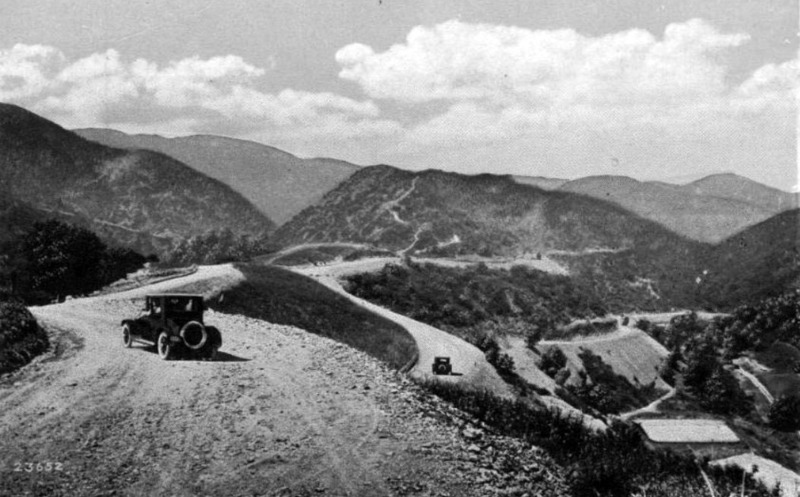 To this day, that section is known as 'Dirt Mulholland', and is only open to cyclists and pedestrians. From the famous Mulholland Bridge east, Mulholland Drive completes its creator's vision, and winds through the affluent Hollywood Hills to Mulholland Drive's easternmost terminus at Cahuenga Boulevard, near Universal Studios, until again becoming an unpaved footpath to Griffith Park. (ca. 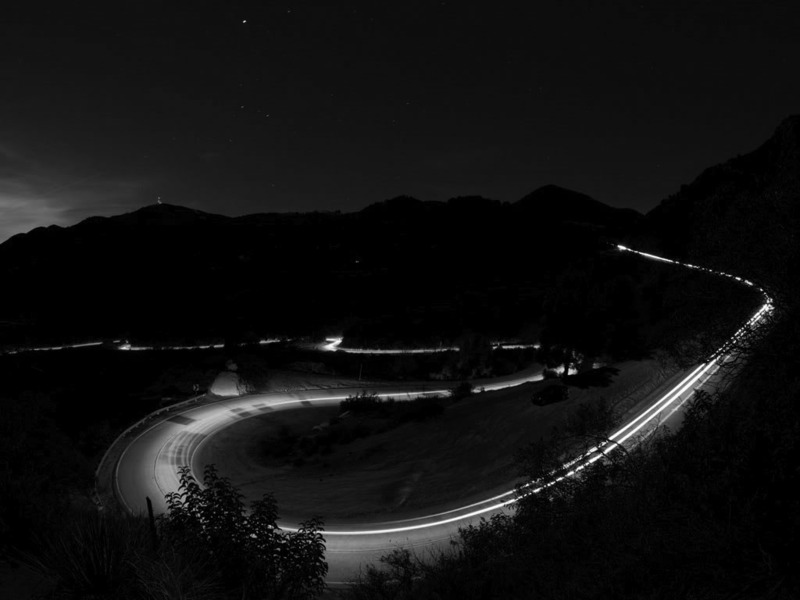 2011)+^+ – Time-lapse image showing Mulholland Drive at night. The road offers spectacular views of the Los Angeles Basin, the San Fernando Valley, and the Hollywood Sign. 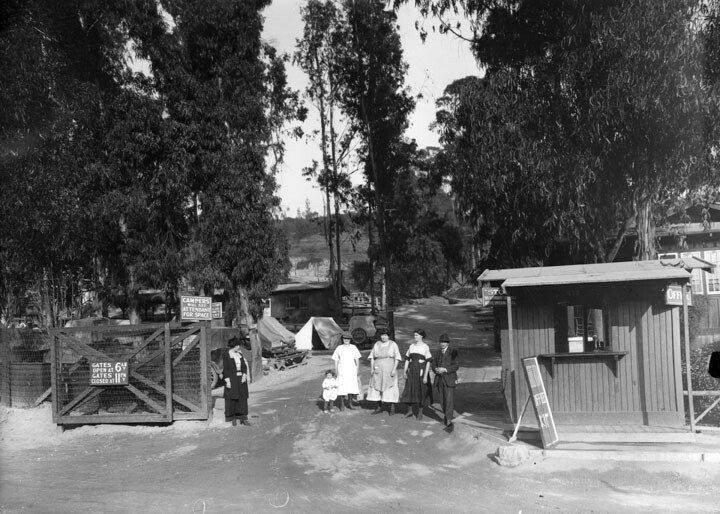 (1920s)^ - Five adults and a child stand at the entrance to a camping area in Elysian Park. Next to them is a wooden building with the sign "Office" on the end. The gates on the other side of them announce they open at 6 and close at 11. From humble beginnings, City Council created the Department of Parks in 1889. At that time the city owned several pieces of land that were believed suitable for park purposes. They turned over these properties to the newly-organized Department of Parks. 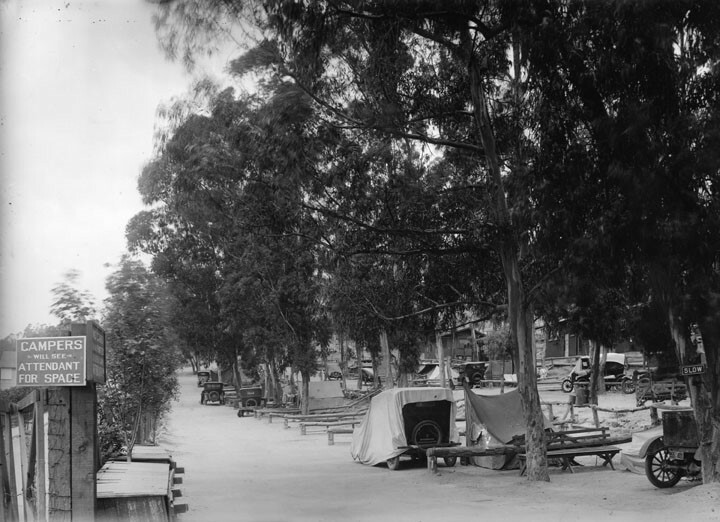 (1920s)^ - A view from the entrance gate down two rows of campsites at Elysian Park. A few tents and a few cars are already in place. At the entrance a sign notifies all that "Campers will see attendant for space". (1924)^ - View looking toward the NE corner of Sunset Boulevard and Figueroa Street showing lots of congestion. Note that there are no traffic lights at the intersection. Today, the Orsini Apartments stands on the NE corner, where the Gilmore Station was located. Click HERE for contemporary view. 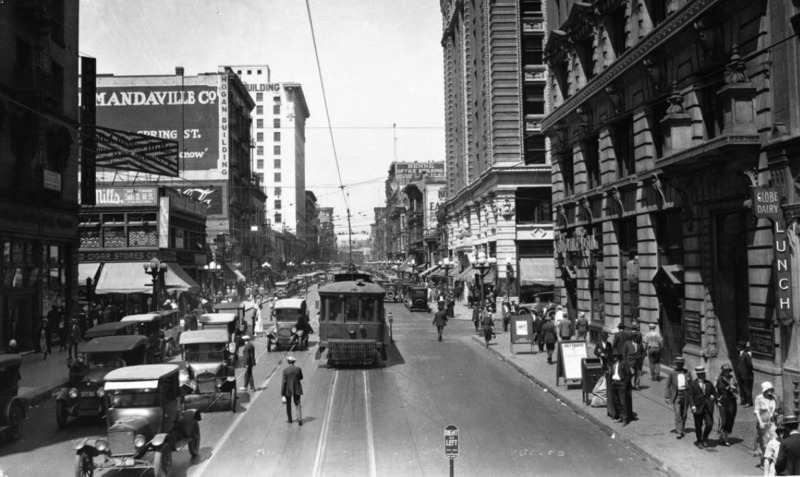 (1922)^^ – View looking east on 5th Street at Hill Street. Streetcars, autos, and pedestrians share the streets. Boos Bros. Cafeteria can be seen behind the streetcar. The building on the right is the Willoughby Hotel (S/E corner of 5th and Hill) which was built in 1898 and demolished in 1982. Pershing Square is across the street from the Willoughby out of view (to the right). In 1906, Horace Boos and three siblings opened one of Los Angeles' first cafeterias. Their idea of a fast food, self-service restaurant consisted of unheard-of impositions for that time: patrons would wait on themselves and return their trays and dishes to the kitchen. The brothers' downtown cafeteria was the first link, in a chain of seven that ultimately stretched from Los Angeles to San Francisco. They opened four more in the downtown area one in Santa Catalina Island, and two in San Francisco. By the 1920s, the chain of cafeterias had become widely known. When Horace Boos died in 1926, the surviving brothers sold the seven cafeterias for a record $7 million to the Childs Corp. In turn, Childs sold two of the cafeterias to Clifford E. Clinton, who launched the Clifton's Cafeteria Chain. Eventually, Henry Boos bought back two, one on Hill Street and the other in Avalon on Catalina Island. (ca. 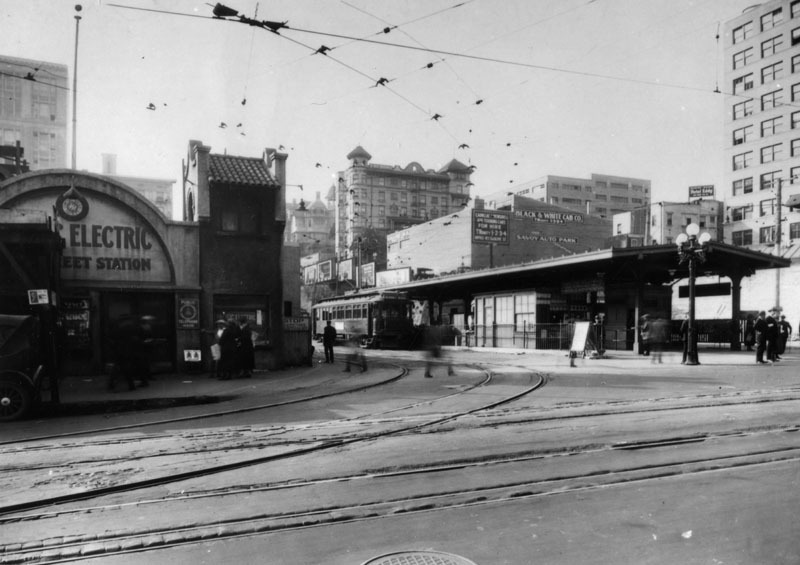 1920s)^## - Pacific Electric Hill Street Station & Masonic Bldg. West side of Hill St. between 4th & 5th Streets. (ca. 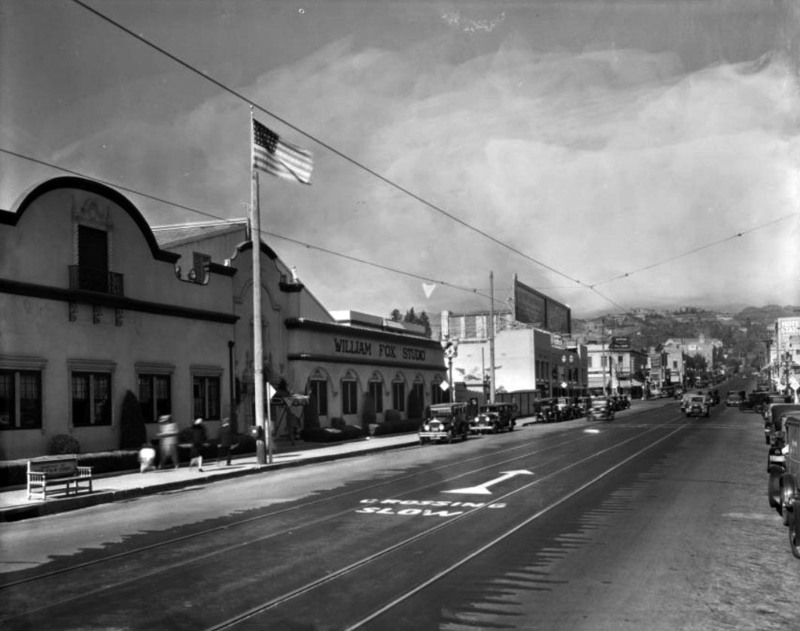 1922)^ - The Pacific Electric Hill Street station, located at 427 South Hill Street, between 1922 and 1925. (ca. 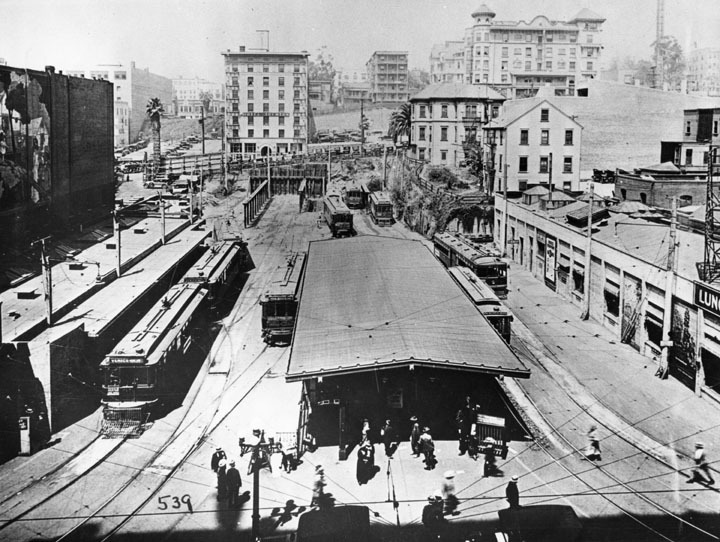 1920s)^ - The Hill Street station for electric cars during 1922 to 1925, before the Subway Terminal Building was built, looking west toward Bunker Hill. (1925)^.^ – View, looking west from Hill Street, of the construction site as the PE Hill Street Station is converted to a massive building and entrance to a subway tunnel which will cross Bunker Hill to Toluca Yard (1st/2nd/Beverly Boulevard/Glendale Boulevard). Here they have breached the Olive Street roadbed and spanned the vacated Olive Street School/Health Department property. The Trenton (on the left) and the Fremont (on the right) look on nervously. The Rose Mansion at 4th Street and Grand Avenue can be seen behind the Fremont Hotel. 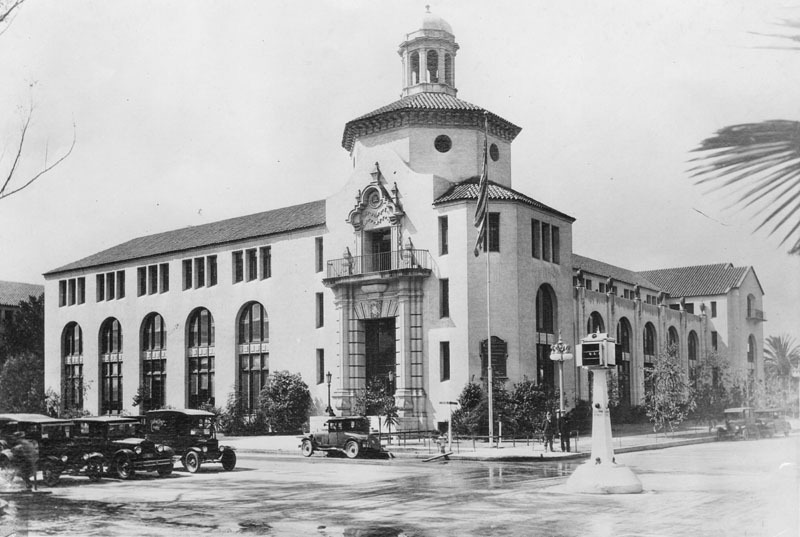 (1925)^ - View of the Subway Terminal Building and the Pacific Electric Railway Passenger Station in 1925, the year they were built. View is of the Hill Street side south of 4th Street. (ca. 1925)^## - View of the Subway Terminal main hall. (ca. 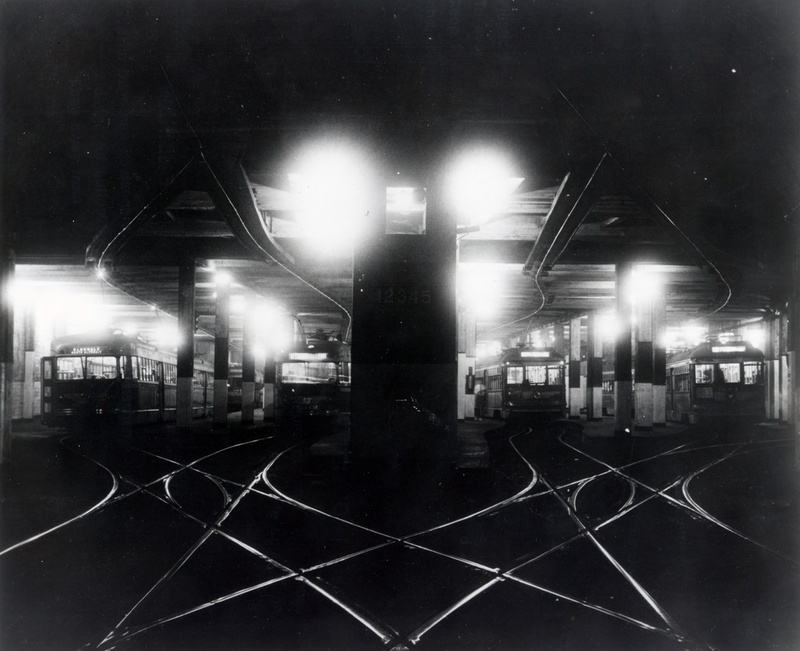 1925)^ - Interior view of the Subway Terminal Building in downtown Los Angeles, showing Pacific Electric car tracks running in various directions in the subway. (n.d.)^## - View of the symmetry in the tracks within the Pacific Electric Subway Building. 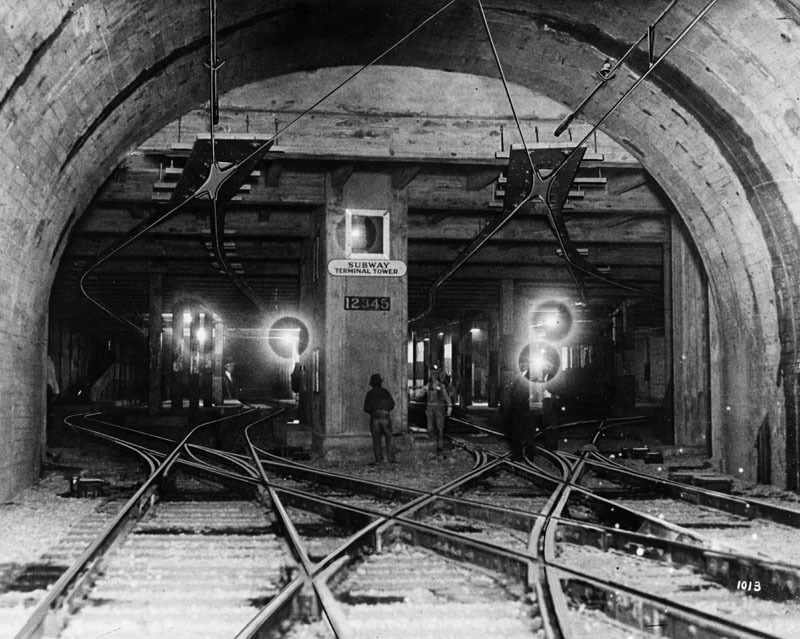 The subway was in operation from 1925 to 1955. 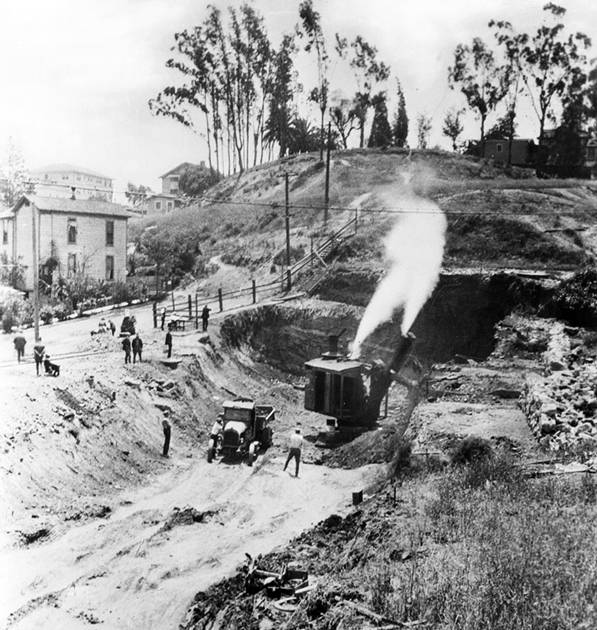 (1924)^^ - Construction of the western portal of the Pacific Electric subway tunnel at 1st and Glendale. Click HERE to see construction of the Eastern Portal of the PE Subway Tunnel. 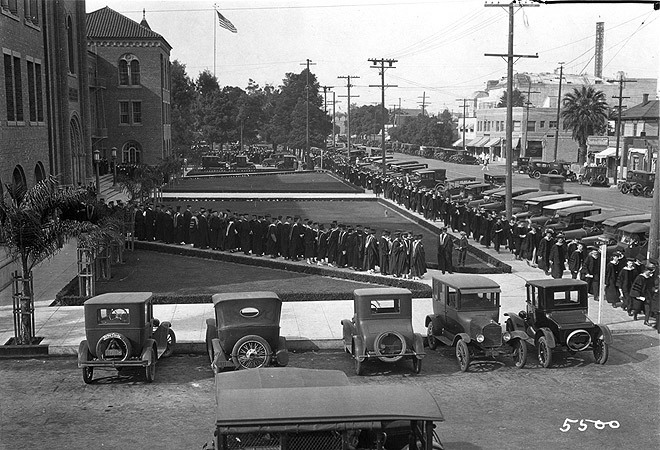 (1925)^ - Ceremonies commemorating the opening of the Pacific Electric tunnel under Bunker Hill, from Beverly Boulevard to 5th and Hill Street. 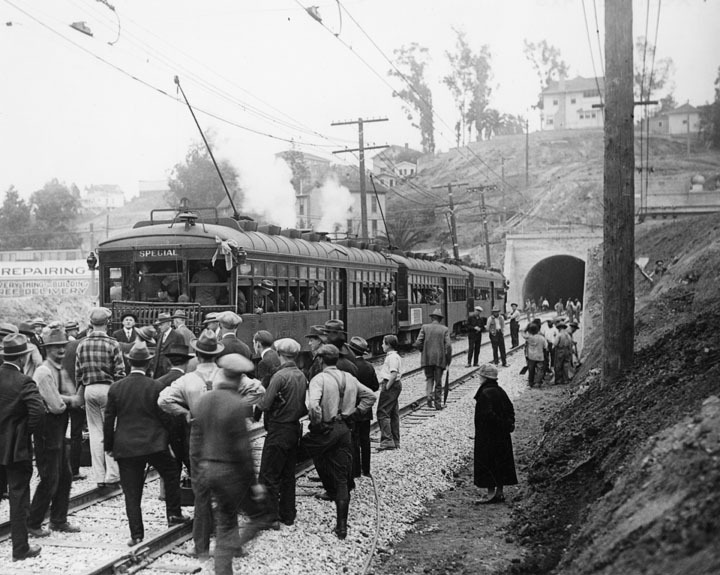 The "Hollywood Subway" officially opened to the public on December 1, 1925. 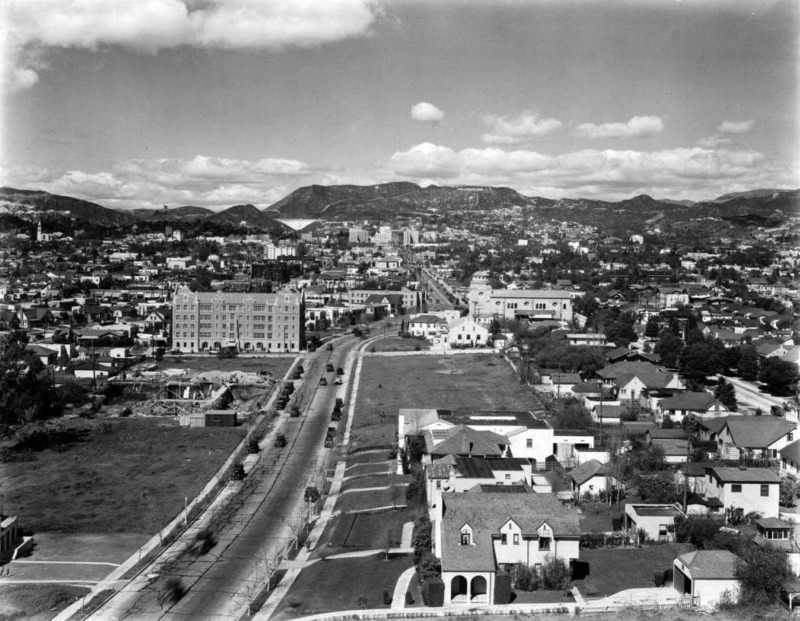 (1927)^## - View of Glendale bound No. 583 exiting from the Pacific Electric Subway Portal. 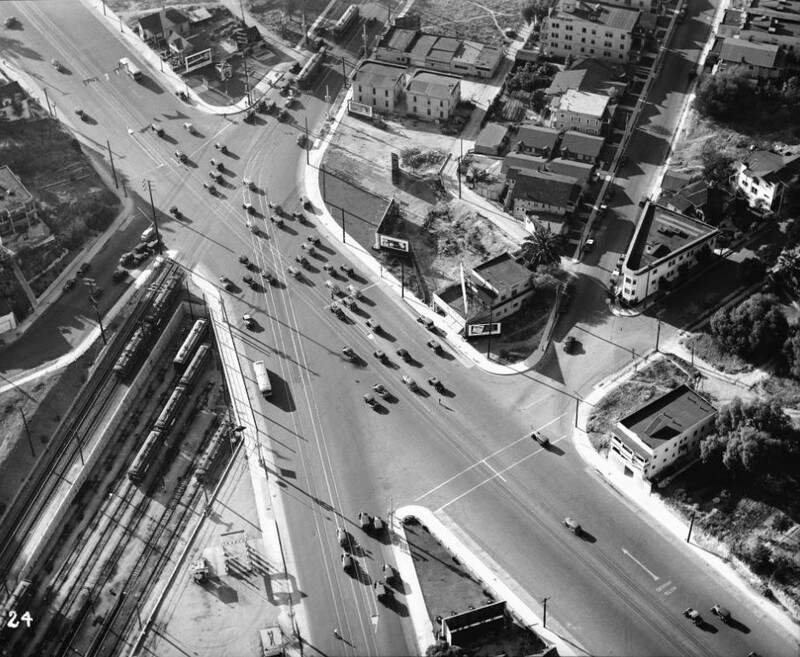 (1936)^^ - Aerial view of the intersection-First St, Second St, Beverly & Glendale Boulevards with the Pacific Electric Toluca Yard in lower left. 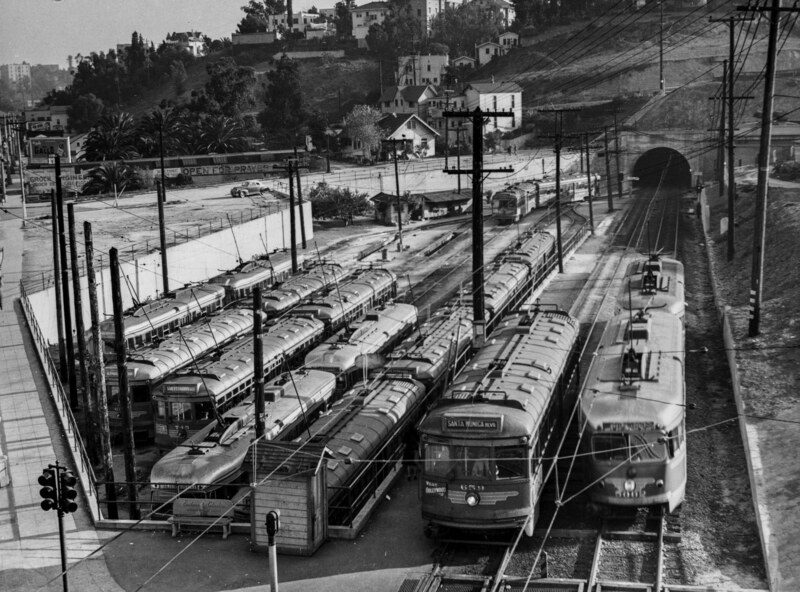 The Pacific Electric Subway Tunnel (aka Belmont Tunnel and Hollywood Tunnel) is also at lower-left but out of view. The view above is looking northwest at the confluence of 1st Street (lower right corner), 2nd Street (bottom/center), Beverly Boulevard (upper left corner/extension of 1st Street beyond intersection), and Glendale Boulevard (upper/center, extension of 2nd Street beyond intersection). P&E Toluca Yard at lower left. (1942)^.^ – View looking north from above the north portal of the PE tunnel as the new 1st Street/Beverly Boulevard viaduct is getting ready to open to automobile traffic. The Toluca Yard is seen at left. The above photo makes it easier to see how this complicated intersection worked. 1st Street and 2nd Street converged and met here at what was Lakeside Drive. As 1st Street crossed it became Beverly Boulevard, as 2nd Street crossed it turned north onto what had been Lakeside Drive and was now Glendale Boulevard. 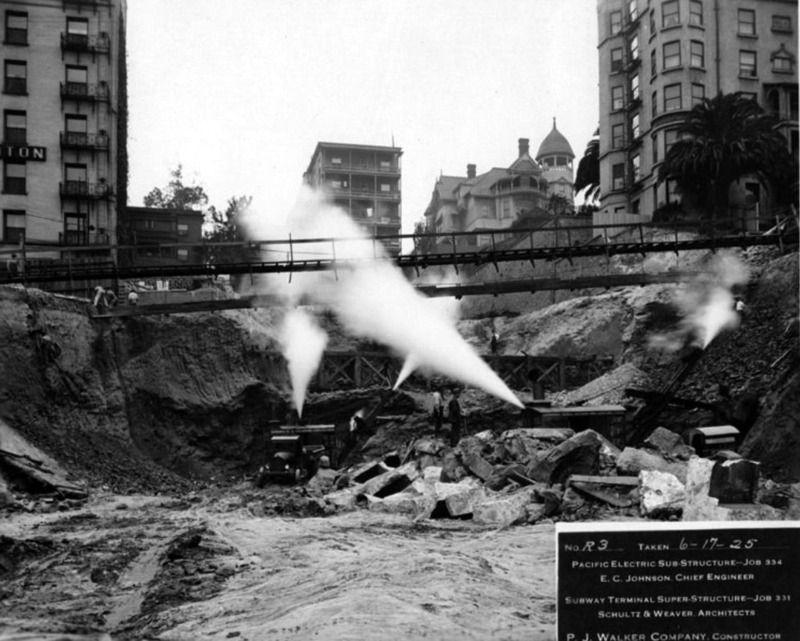 The PE tunnel originated at the PE 5th Street station on Hill Street just north of 5th. 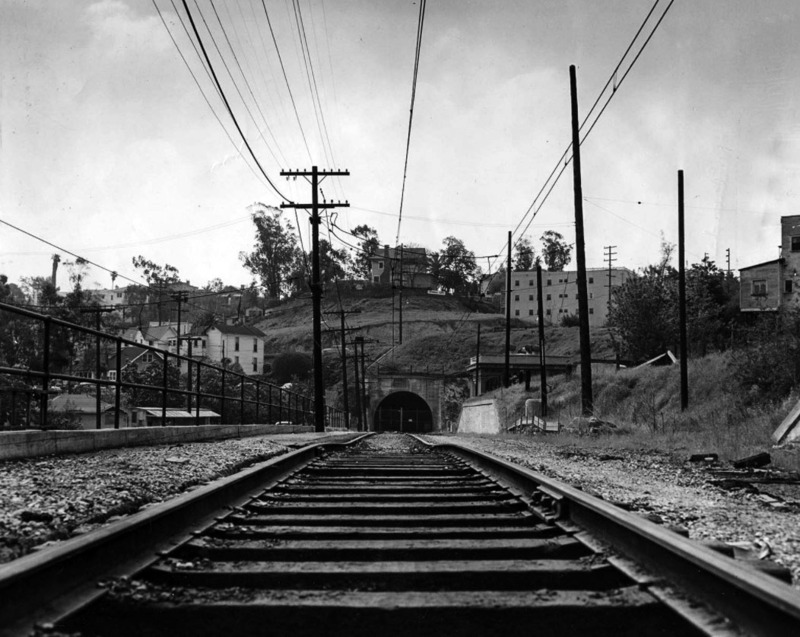 (1956)*## - View showing the old abandoned Pacific Electric tunnel through which interurban cars used to rumble from Glendale Blvd. to the Subway Terminal. 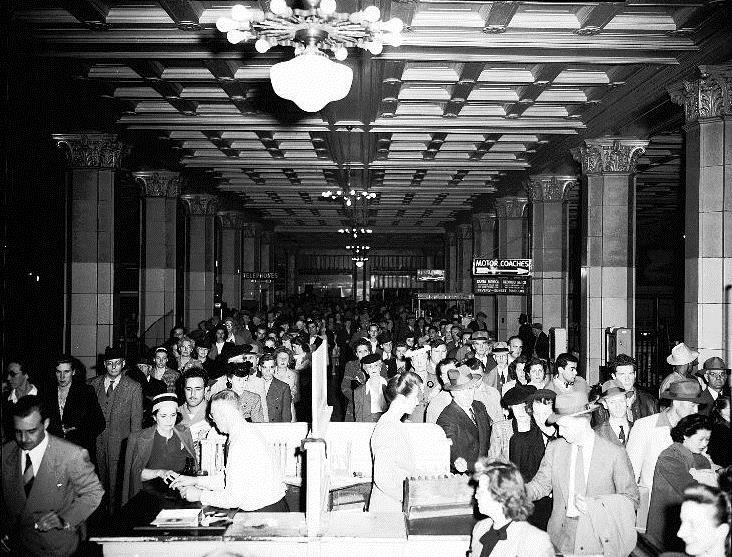 The subway closed in June 1955. 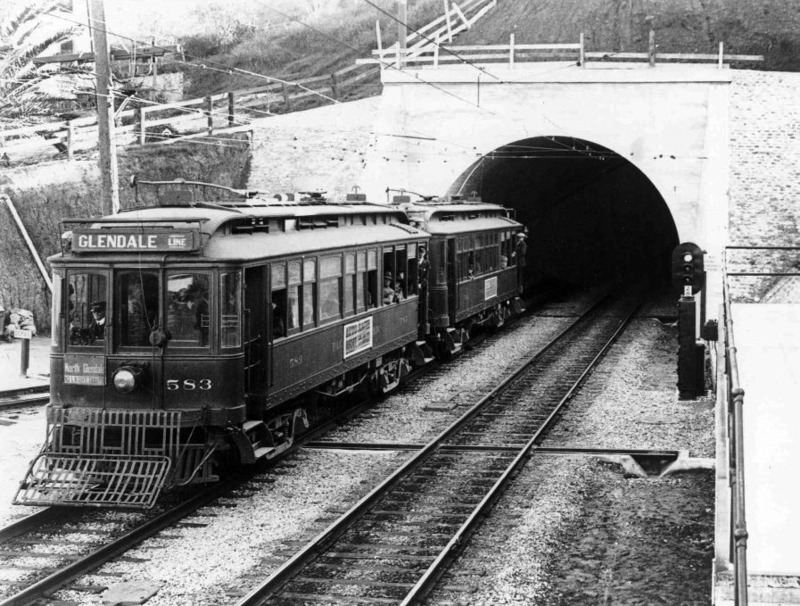 (2000)^x^ – View showing the 1925-built 1 mile Pacific Electric tunnel under Bunker Hill, before the north end of the tunnel was sealed off. 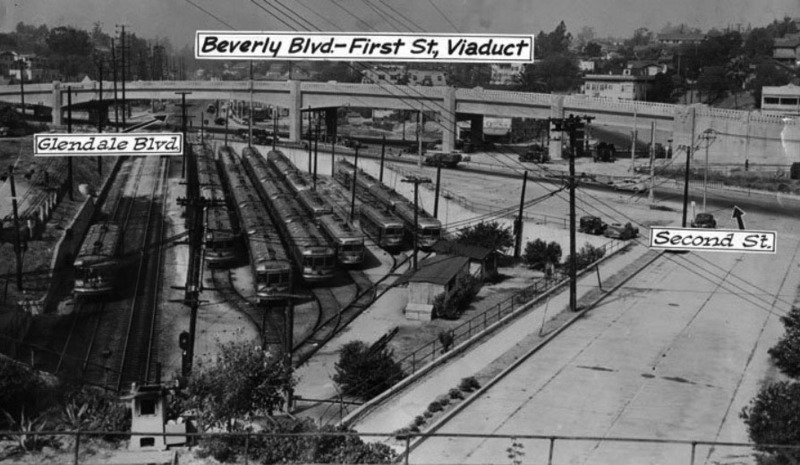 (1950s)++++ - Pacific Electric cars zip past rows of sisters at Belmont Yard, seen from LA's First Street Bridge. Within just a few years, the Belmont Yard would be shut down and abandoned. (ca. 2003)^x^ - View showing the Belmont Tunnel and Toluca Substation abandoned and covered with graffiti. For over 45 years the site was left largely neglected and its historical significance was overshadowed by its gritty, run-down appearance. The abandoned subway, substation and yard, left intact and open to public view, attracted many graffiti artists. The site also appealed to the homeless, who took refuge in the shelter provided by the subway and substation. There were also several underground "rave" parties in the 1990s, often with the power being supplied from one of the neighboring residential dwellings. 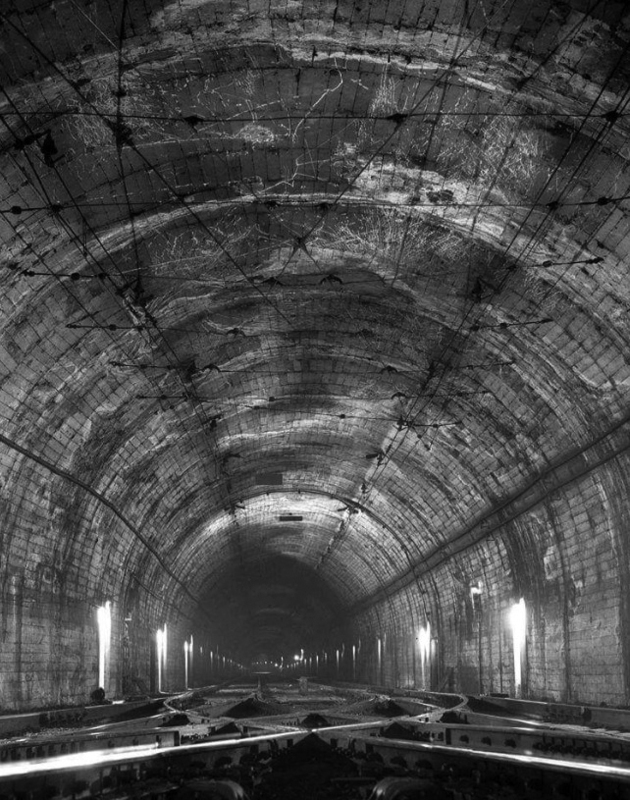 To locals and passers-by, the site - simply referred to as "The Tunnel" - has long blended into the landscape and is regarded as little more than another vacant lot. In 2002, West Los Angeles-based Meta Housing Corporation purchased the property and announced plans to construct a 276-unit apartment complex on the former Toluca yard. Belmont Station Apartments was completed in late 2008. The entrance to the subway has been sealed and painted with a mural of a Red Car, which glows in the dark, by artist Tait Roelofs. The substation remains next to the subway entrance at the back of the property, behind the new construction, and has been cleaned of the graffiti that adorned it for many decades. Click HERE for contemporary aerial view. (ca. 1924)^ - View of the Silver Lake Reservoir and surrounding area, with streets readied for houses. View is looking north. In 1896 Herman Silver was elected to the Los Angeles City Council and was soon voted its President – acting often as the Mayor pro tem of the city. In 1902, he City Council created a the 1st Water Commision and named Herman Silver as its Chairman. Silver was instrumental in planning a reservoir Northeast of Downtown that would combine stored water with a development of nice homes and parks. 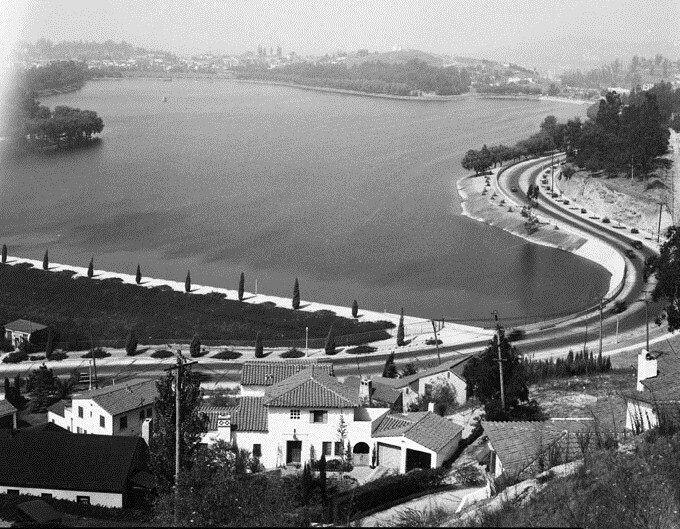 (1930)* - Silver Lake Reservoir - Silver Lake Reservoir was named for Herman Silver, first president of the Board of Commissioners, Domestic Water Works System. He served from 1902-1903. The reservoir is a earth fill dam, asphalt concrete, with paved slopes. It was put into service in May 1908. 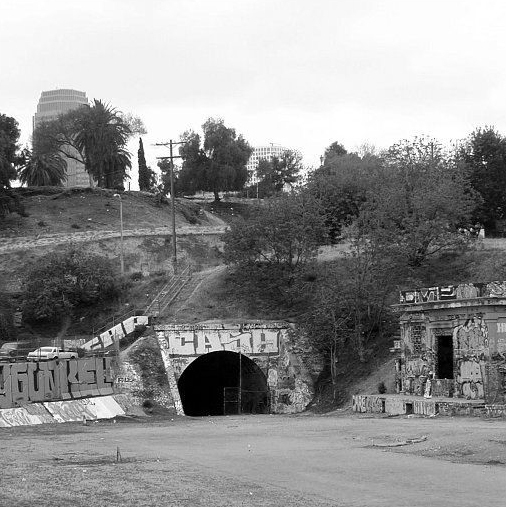 In 1989, the Silver Lake Reservoir was designated LA Historic-Cultural Monument No. 422 (Click HERE to see complete listing). (1922)^^+ – Aerial view looking east on Los Feliz Boulevard from above where Western Avenue makes a sharp turn into Los Feliz. Franklin Avenue runs away from the camera on the right. The west-east thoroughfare runs through Los Angeles and Glendale. It starts off at its east most point at Glendale Avenue as Los Feliz Road. After passing the railroad tracks in Glendale west most section, it enters Los Angeles and changes to Los Feliz Boulevard. Los Feliz passes through Atwater Village and Griffith Park. After Griffith Park, it swerves to a north-south street and ends. It then merges and becomes Western Avenue which in turns runs all the way down to the San Pedro area. (1920)^ – View showing two houses in a new tract south of Los Feliz Boulevard and east of Vermont Avenue which sold out in one day in 1920. It took two months to put in the streets. The Los Feliz neighborhood has been home to movie stars, musicians, and the Hollywood elite. It boasts some of the best-known residential architecture in the city, including two homes designed by Frank Lloyd Wright—the Ennis House and the Hollyhock House—and Richard Neutra's Lovell House. (ca. 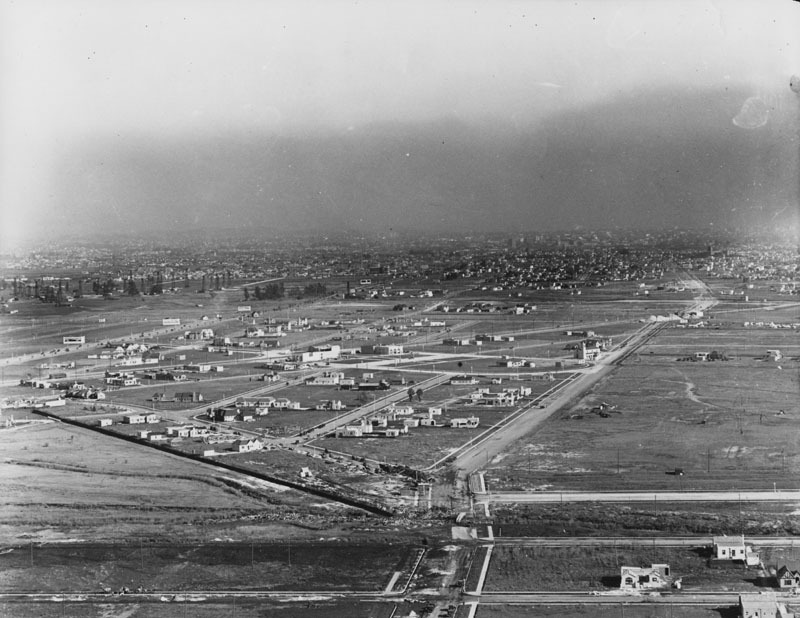 1924)^ – Aerial view looking northwest from above Los Feliz Boulevard in Atwater Village. 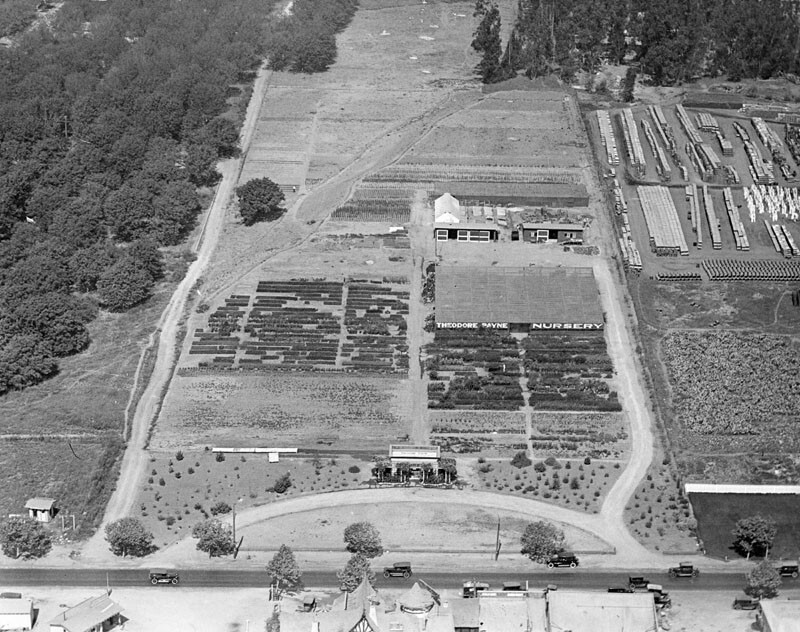 The Theodore Payne Nursery is seen, as well as part of Tam O'Shanter Restaurant (lower middle). Franciscan Pottery Manufacturing is at upper-right. Theodore Payne was an English horticulturist, gardener, landscape designer, and botanist. He is known for urging the use of California native plants and lecturing across the state on preserving the wild flowers and landscapes native to California. (2015)##^* – Google Earth view looking northwest from above the Tam O'Shanter Restaurant . The Franciscan Metro Shopping Center is now where the old Theodore Payne Nursery and Franciscan Tile Company used to be. (ca. 1920s)* - Service station on north Vermont Avenue shows three automobiles parked next to the gas pumps as two attendants fill them up with "filtered gasoline". Other services such as polishing and simonizing are offered at this station, possibly named "Ventura Gasoline". (ca. 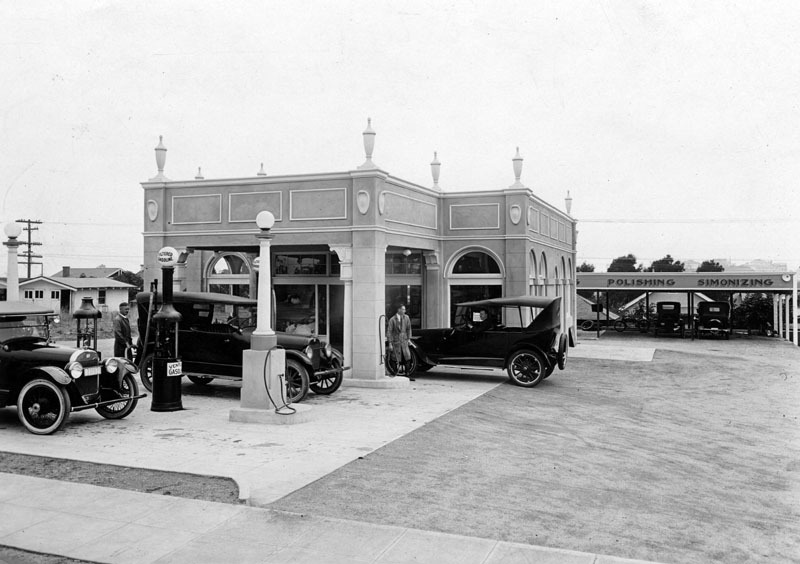 1925)^^ - Exterior view of a Richfield Service Station. 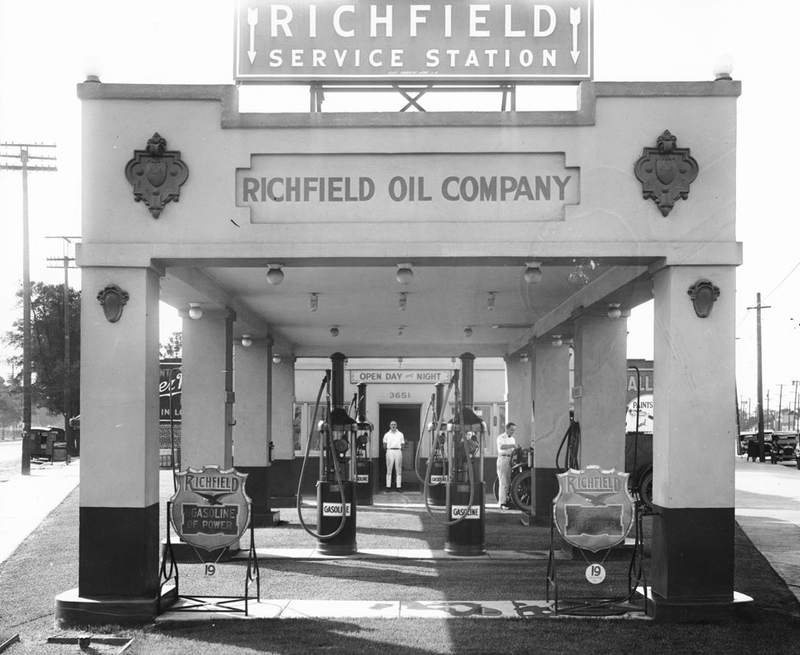 Four gasoline pumps stand below a large covering which reads "Richfield Service Station, Richfield Oil Company". Between the gasoline pumps a man in a lightly-colored uniform can be seen in the doorway of the shop which stands behind the station with the label "Open day and night". 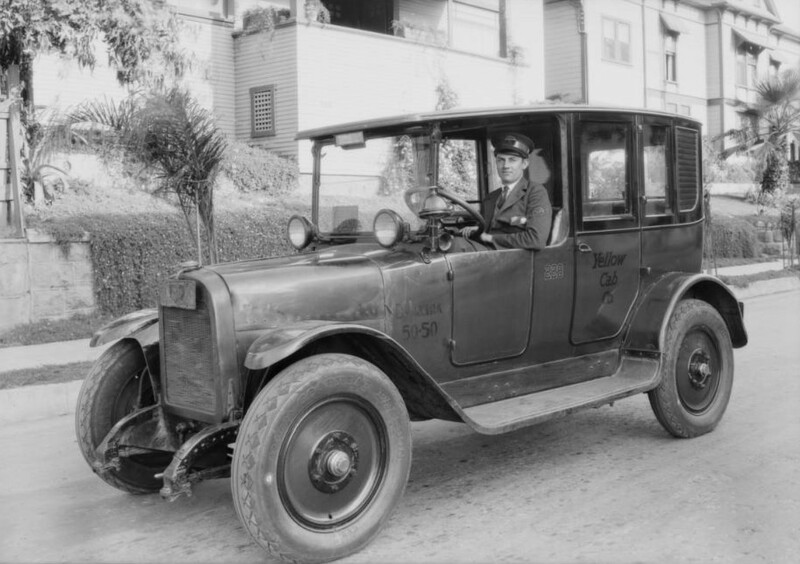 A second man in an identical uniform tends to an automobile on the right. 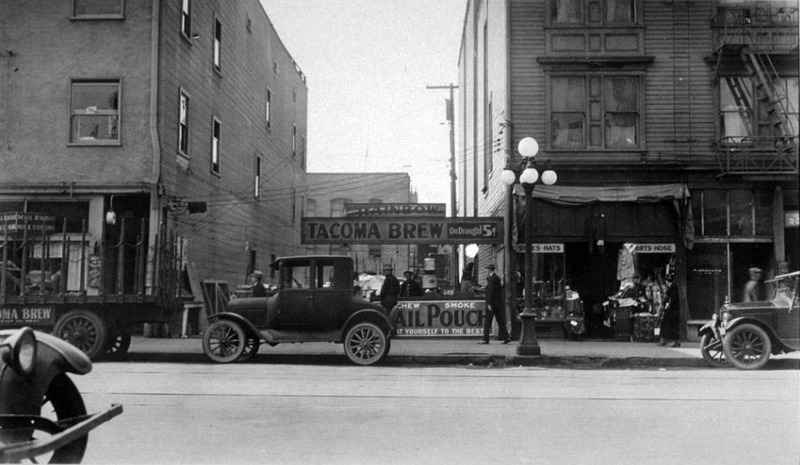 (1925)^^ - View showing a Yellow Cab with taxi driver inside, in front of a building at 427 South Normandie. (1925)^ - A wet policeman directs traffic in a flooded intersection at Main and 10th Streets in 1925. He is dressed in rain gear. The Hotel Apex is on the corner, as well as W. P. Fuller & Co., paints and glass. (ca. 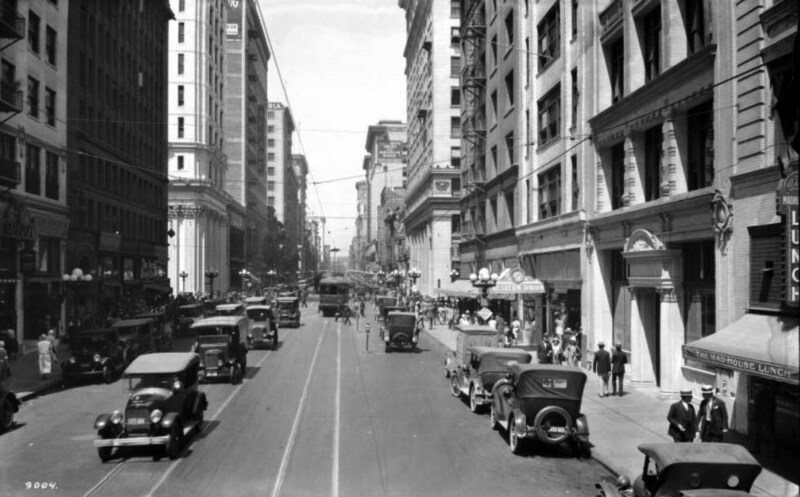 1925)^ – View looking south on Olive Street between 7th and 8th streets. The rear of the Stillwell Hotel shows at right, located at 838 So. Grand Ave. Another hotel is at left, and various small businesses and cars line the street. A pile of debris is in the street at left, and men are working. Note the ornate tower/steeple of the building on the southwest corner of Olive and 8th streets. 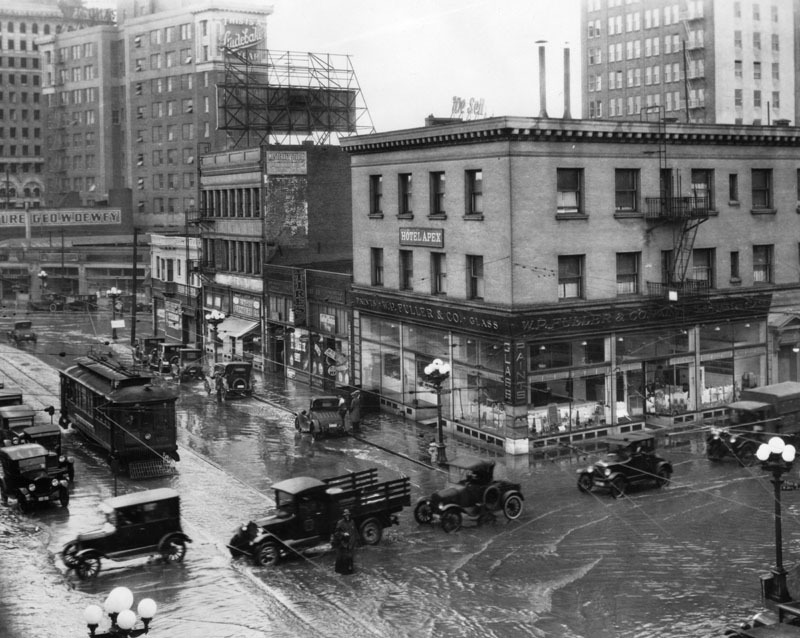 (1927)^– View looking at the northeast corner of Grand Avenue and 9th Street, where one end of the Stillwell Hotel can be seen on the left. "FIREPROOF HOTEL" is painted high on the wall, in large capital letters. Mid-photo in the background, a cupola peeks from behind another building, the sign on it reads: "Hill Street Theatre". This refers to the RKO Hill Street Theater, which occupied the northwest corner of 8th and Hill Street. On the corner stands Red Crown Gasoline station, offering Zerolene and Mobiloil. It’s owned and operated by Ed. Willumsen, a "correct lubrication specialist"; he possibly also owns Ed's Auto Livery, which is adjacent to the gasoline station. Several cars can be seen waiting for the light to change along 9th Street. The 250-room Stillwell Hotel was built in 1906 and is located at 838 S. Grand, between 8th and 9th. 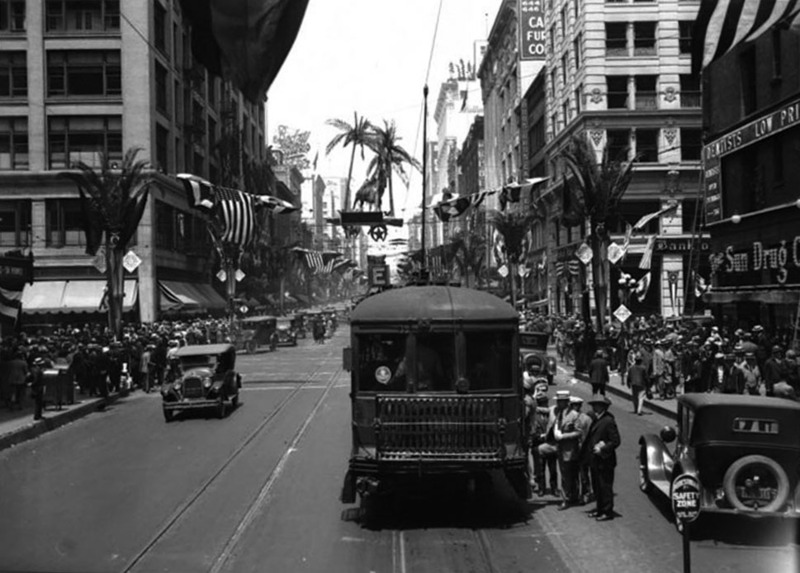 (1920s)++++ - View looking south on Broadway from 10th Street (later Olympic) showing two streetcars of the LA Railway's "M Line" with the Examiner Building in the background on the S/W corner of Broadway and 11th Street. 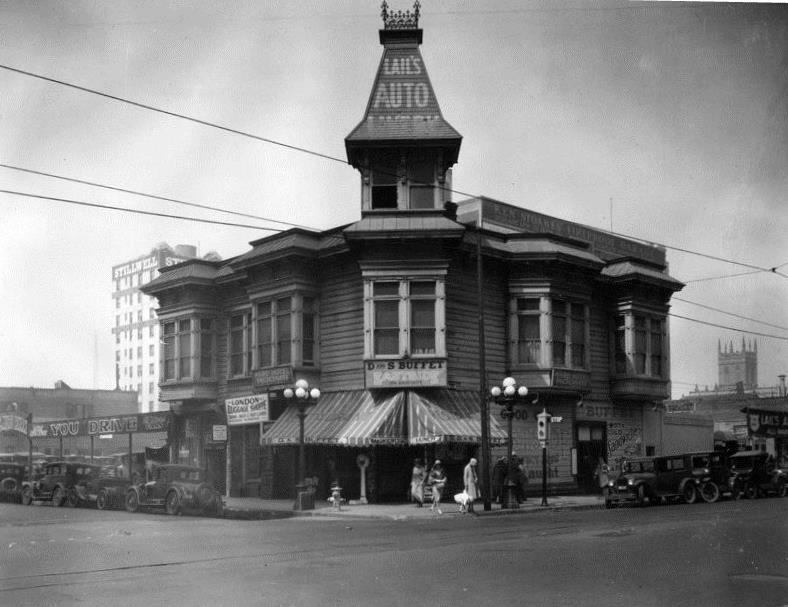 The Los Angeles Investment Co. and Western Auto Supply are at left, followed by the Paul G Hoffman Studebaker sales office. 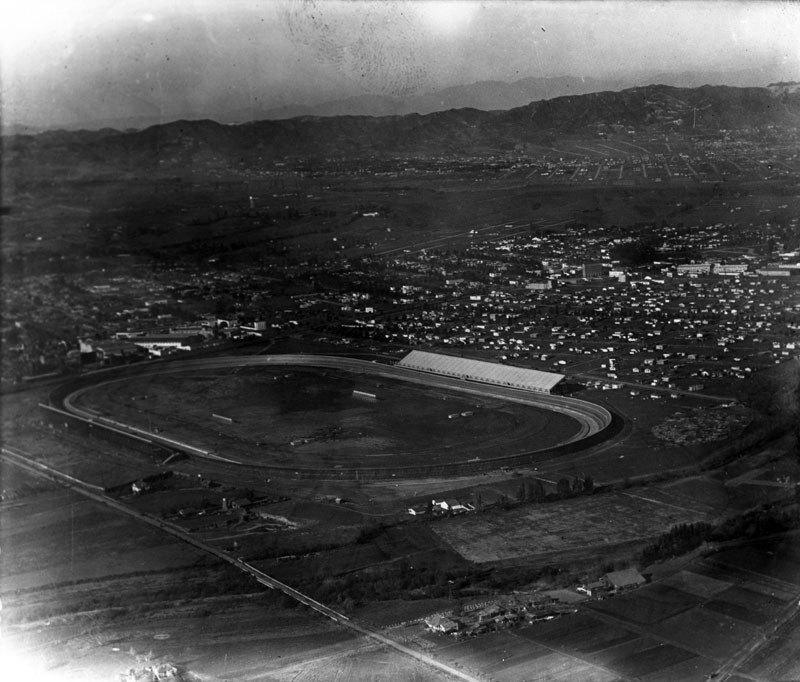 (1925)^ - Aerial view of the Legion Ascot Speedway located along Soto Street from Valley Blvd. to Multnomah St. 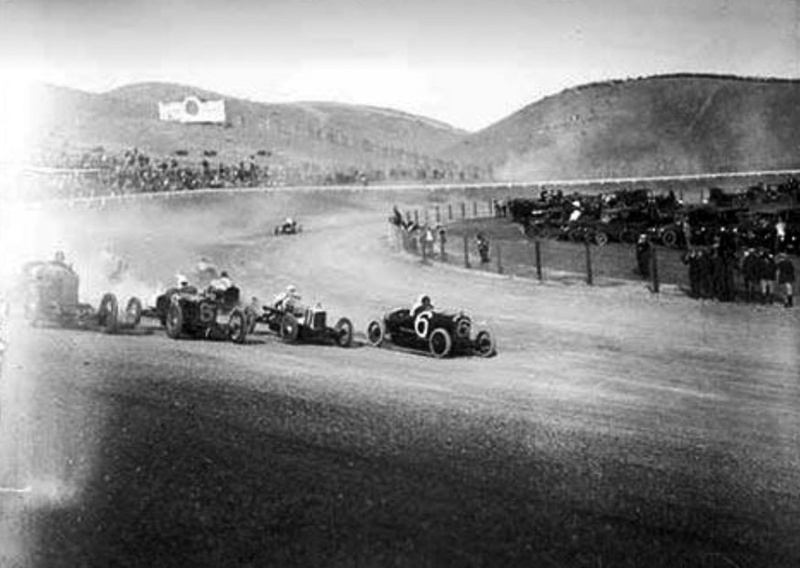 The speedway operated between 1924 and 1936 in the Lincoln Heights area. 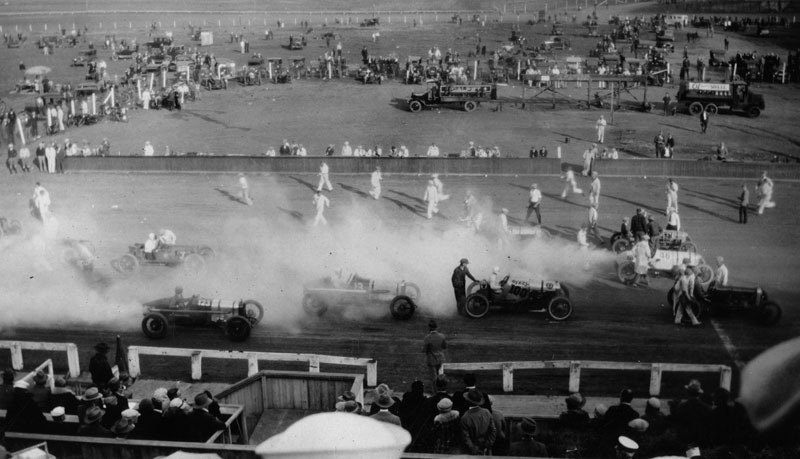 The five-eighths mile Ascot Speedway began life as the New Ascot Speedway on January 20, 1924. The banked oval that was originally dirt but constant applications of road oil soon produced a surface that was similar to pavement. The cars that raced at Ascot throughout the years were the ancestors of what we today call "sprint cars". (1935)^x^ - Crowd watching at the Legion Ascot Speedway as Bob Swanson and Rex Mays race. From 1924 there had been several people running the race track, but in 1928 the Glendale American Legion Post started promoting and bringing in cars and drivers from the American Automobile Association (AAA). In those days the AAA controlled all the major speedways including Indianapolis Speedway. A major speedway was born and it was called Legion Ascot Speedway. Under the promotion of the Legionnaires the crowds soon grew to over 10,000 making large purses and hot competition. Races were held on Sundays and Wednesday nights under the lights. 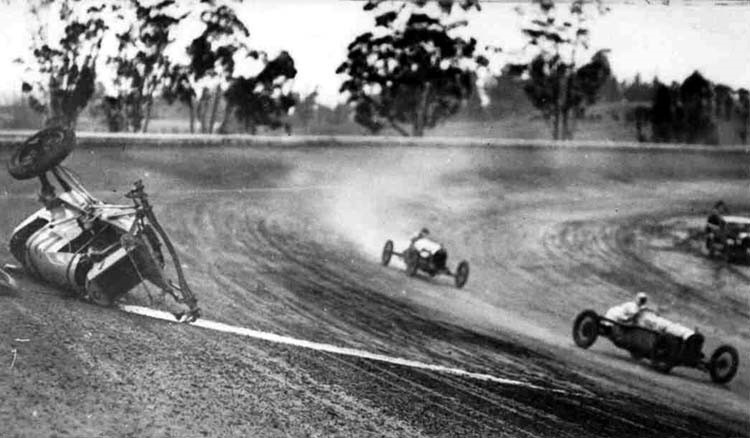 Auto racing (also motorcycle racing) was increasingly popular in the 1920s and 30s. Two speedways would also be built on the West Side of Los Angeles: Beverly Hills Speedway and Culver City Speedway. (1927)^- Crowds look on as drivers prepare to begin the 100 mile race at the Legion Ascot Speedway, located on Soto Street in Los Angeles. (n.d.)^x^ - Cars make the last turn before heading into the final stretch at Legion Ascot Speedway. 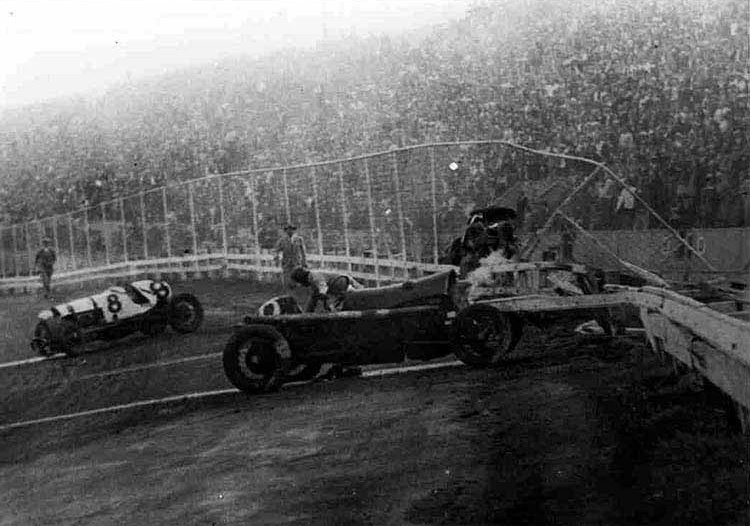 (n.d.)^x^ - Race car crashes after losing control on one of the turns at Legion Ascot Speedway. The death toll was one reason the Glendale American Legion bowed out of race promotion in early 1935---the other reason was the diminishment of crowds due to the emergence of midget auto racing at the time. Eleven years after it opened, the Ascot Legion Racetrack was shut down. Eight months later the grandstands of the abandoned speedway burned to the ground. The land was soon subdivided and sold off. 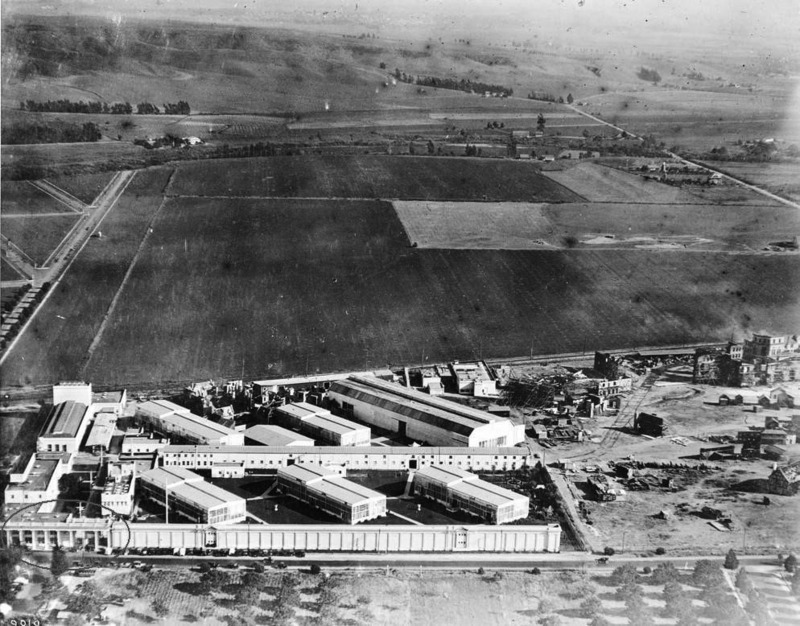 (1918)^^ - Aerial view of the Goldwyn Studios in Culver City looking south. At the bottom of the photo is the front entrance of the studio known as the Colonnade Building. The Colonnade runs parallel to Washington Boulevard. To the right of the studio buildings is what was known as Lot #2 where sets were constructed for the many films produced at Goldwyn Studios. The Main Gate (circled) and part of the Colonnade still stand today, most everything else has been replaced. 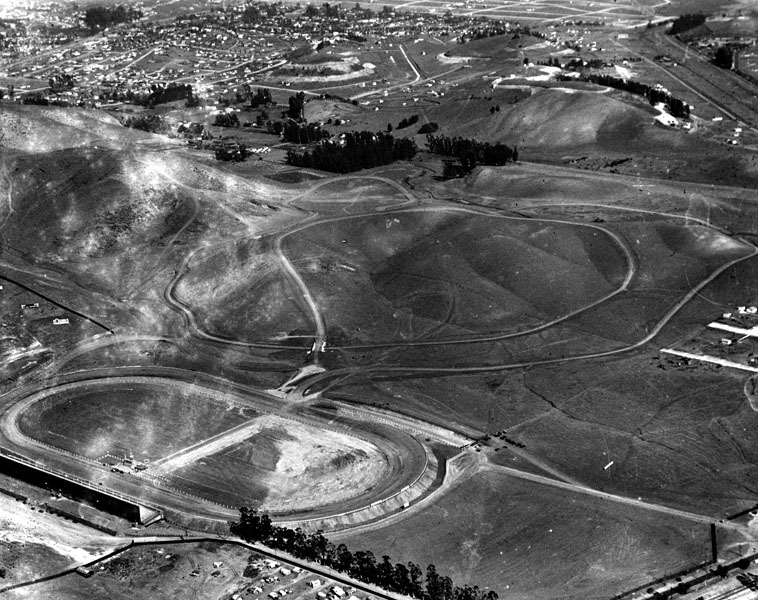 Behind the studios are empty fields which became home the the Culver City Speedway in 1924. 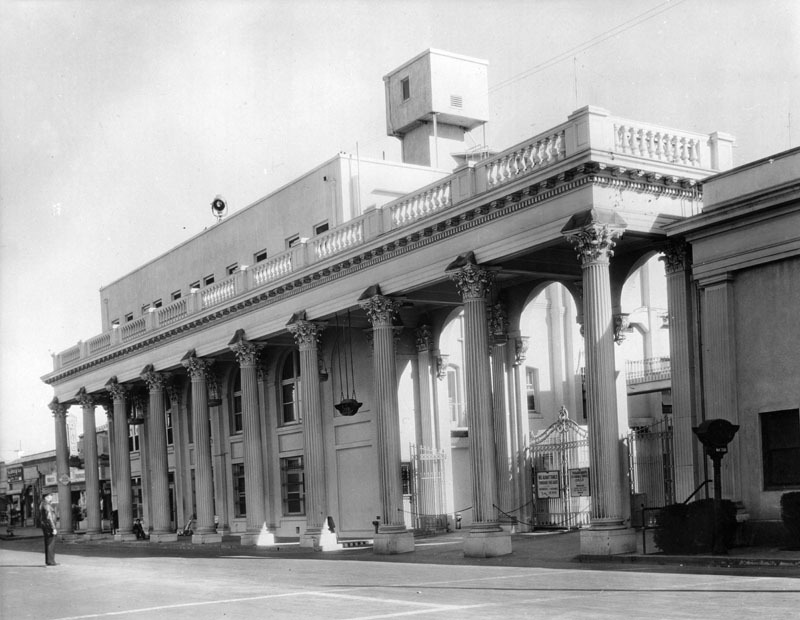 (1938)+^^ - Metro-Goldwyn Mayer Studios main gate entrance viewed from the left side showing of colonnade. (ca. 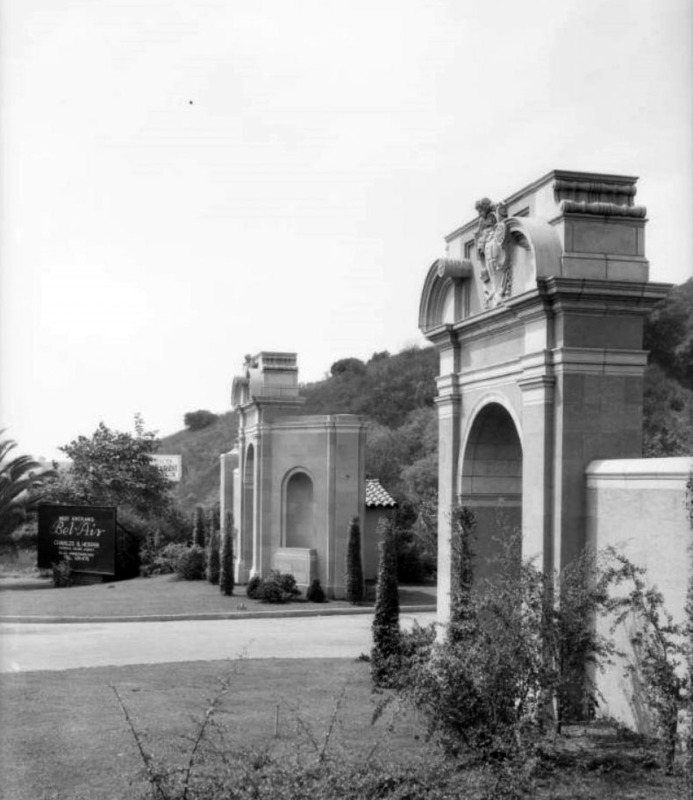 1920)^ - Close-up view of the Metro-Goldwyn-Mayer front entrance and main gate. 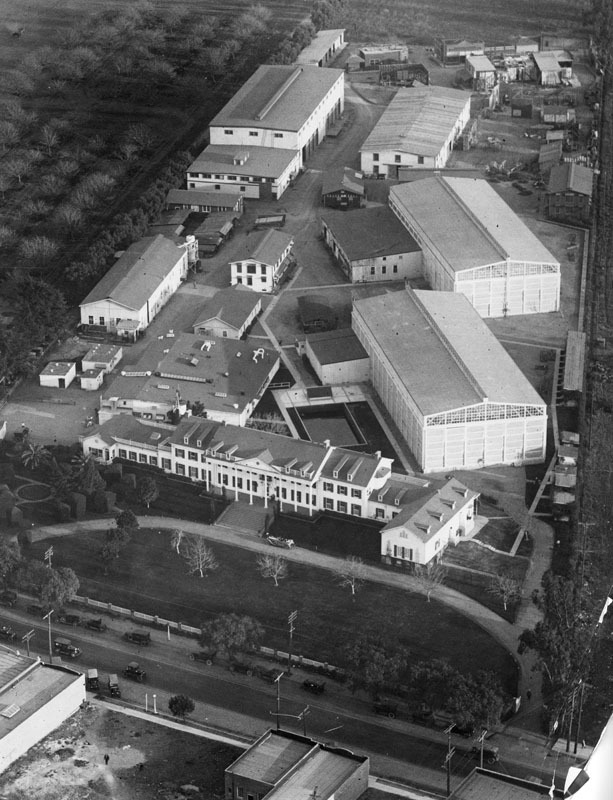 (1920s)^ - Aerial view of Ince Studios or the Pathe Exchange Studios (also known as Culver Studios) located on 9336 Washington Blvd. in Culver City. An elegant convertible is parked in front of the Colonial style building. Less elegant cars are in the street. Formal gardens front the Colonial Revival building that houses the offices, behind which are the actual studios. Culver City is still rural at this time; an orchard faces the studio on the left. (1935)^ - Exterior view of Selznick International Pictures offices, located on Washington Boulevard in Culver City. The Colonial style building has a long history: it was part of the Thomas Ince Studio, which Ince actually used as a movie set, was then converted into an office building by Cecil B. DeMille during his independent years and in 1935, it became the Selznick International Studio. In the 1950s, the lot was sold to Desilu productions. (ca. 1930s)^#^ - Close-up view of the Colonial style Ince Studio (later Selznick International Studios) offices. 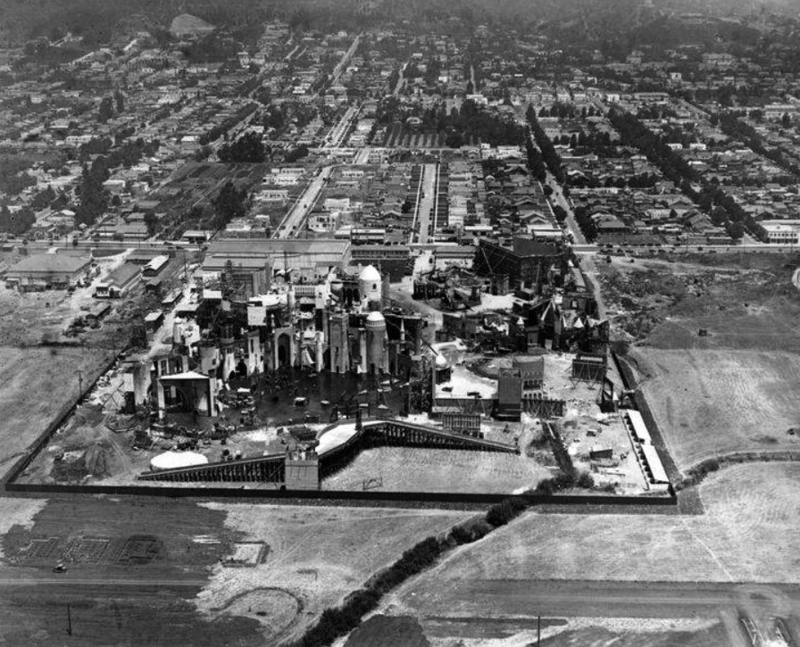 (1918)^^ - Aerial view of the Goldwyn Studios in Culver City looking south. At the bottom of the photo is the front entrance of the studio known as the Colonnade Building. The Colonnade runs parallel to Washington Boulevard. To the right of the studio buildings is what was known as Lot #2 where sets were constructed for the many films produced at Goldwyn Studios. The Main Gate (circled) and part of the Colonnade still stand today, most everything else has been replaced. (1960)* - Aerial view of the Metro Goldwyn Mayer Studio lot, located at 10202 Washington Boulevard in Culver City; view is looking southeast. Venice Boulevard is horizontally at foreground; Washington Boulevard is horizontally at center; Culver Boulevard is horizontally behind the studios; Overland Avenue is vertically along the right, followed by (r to l): Keystone Avenue, Mentone Avenue, Le Bourget Avenue, Motor Avenue, Vinton Avenue and Jasmine Avenue; Ballona Creek flows horizontally in the distance. 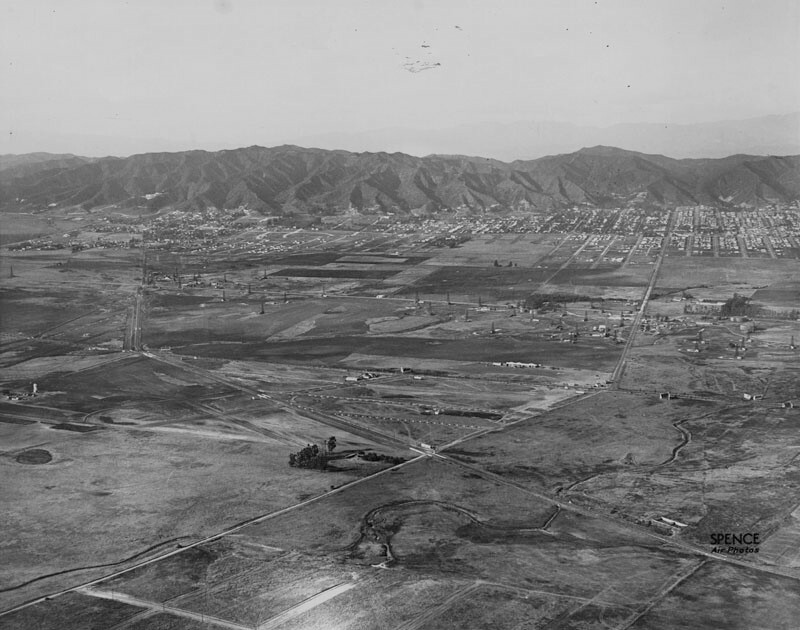 The top two photos show how the Culver City landscape was transformed over the years. However, there was one intermediary development that occurred between the time that these to images were taken. 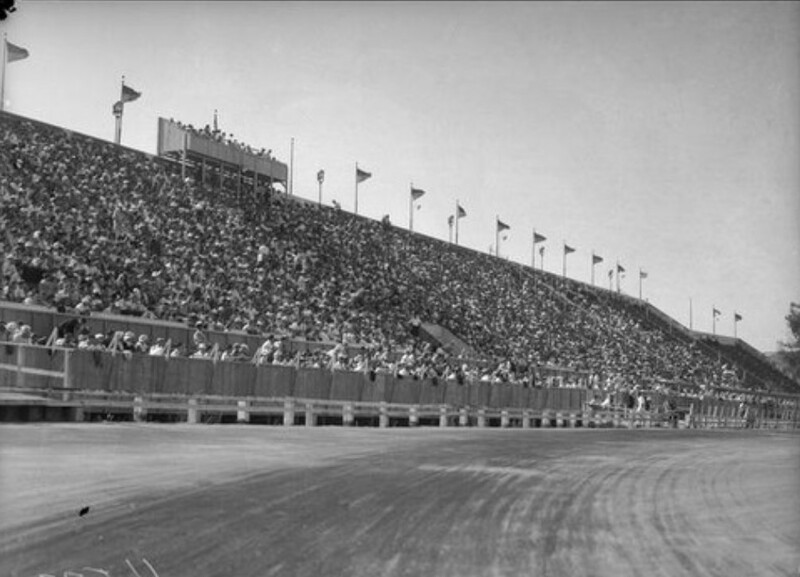 It was called the Culver City Speedway. 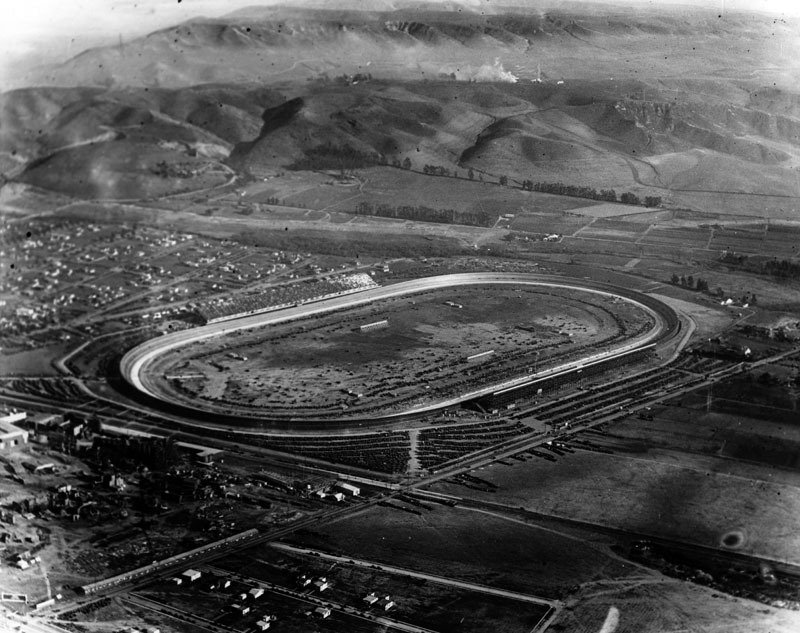 (1924)^ - Aerial view of the Culver City Speedway (aka Los Angeles Speedway) looking southeast. The racetrack was located at the intersection of Culver Blvd and Overland Blvd, right across the street from MGM Studios. It operated from 1924 to 1927. Jack Prince and Art Pillsbury original built the Beverly Hills Speedway near the intersection of Wilshire and Santa Monica boulevards. It was funded by a group of actors and others in the industry known as the Beverly Hills Speedway Association. 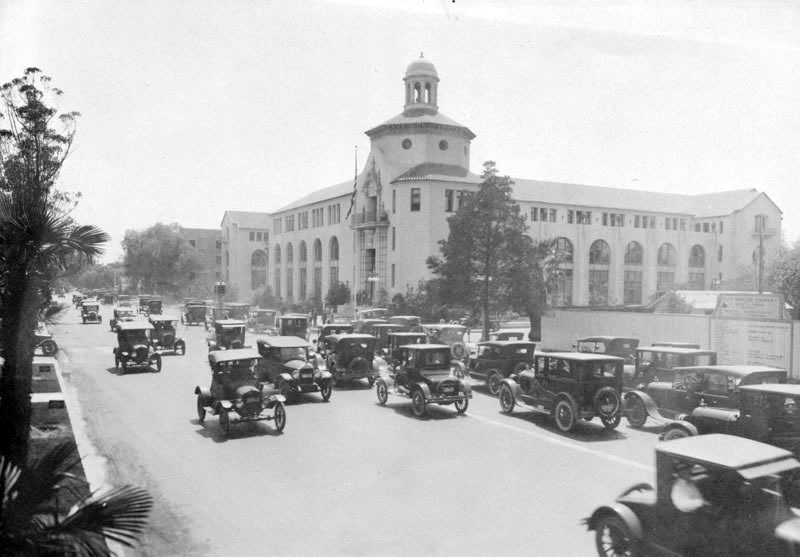 The track was inaugurated on February 28, 1920, but after only four years the 70,000-seat stadium was disassembled to make room for other improvements in the newly incorporated city of Beverly Hills. 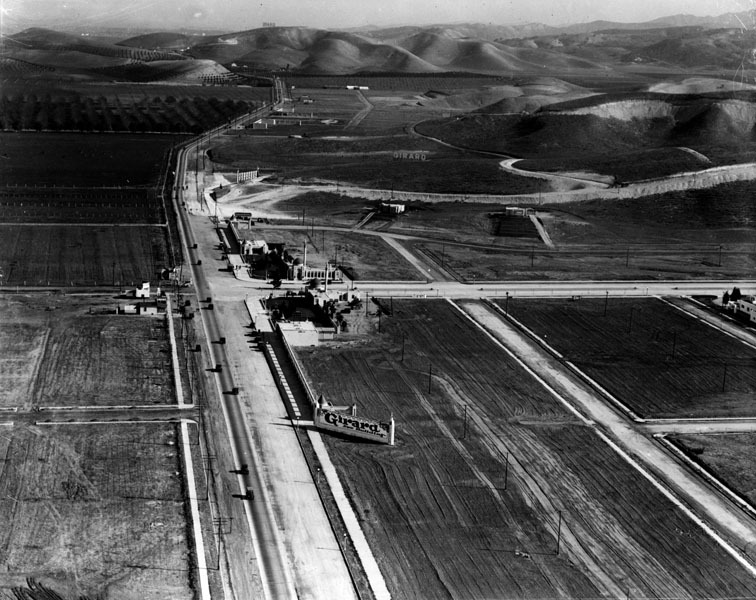 (1924)^ - Aerial view of the Culver City Speedway looking north toward Beverly HIlls. 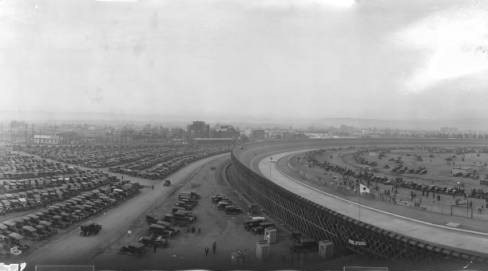 The large, gray, slanted structure on the right of the racetrack is the grandstand, and another one appears to be directly across on the other side. Hundreds of homes are visible past the racetrack, scattered throughout the city. (1924)^ - Aerial view of the Culver City Speedway showing a cluster of cars neatly aligned behind a white "hash mark" that is most likely the finish line. The large structure with multi-color tile is the grand stand and the smaller building to the right of it might be a clubhouse or restaurant under construction. (1924)*^#^ - View of the short-lived Culver City Speedway showing the banked board track near the corner of what are now Culver Boulevard and Overland Avenue. The adjacent parking lot is full of cars. 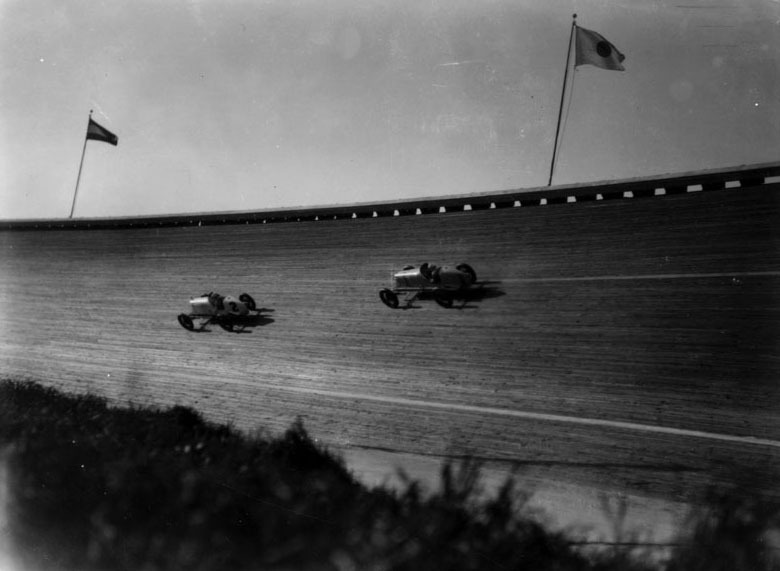 After its closing in 1927, the Culver City Speedway was eventually removed to make way for movie studios, housing and a public park. 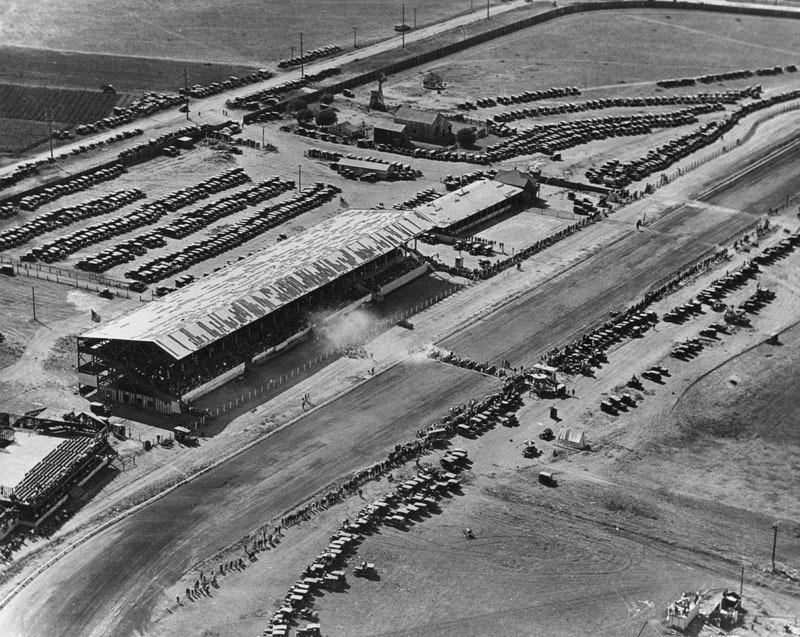 (1927)^ - Partial view of the Culver City Speedway (also called Los Angeles Speedway), which was in existence as an auto racing venue from December 14, 1924, until March 6, 1927. This photograph shows car number 1 pursuing car number 2 on a steep bank of the track. 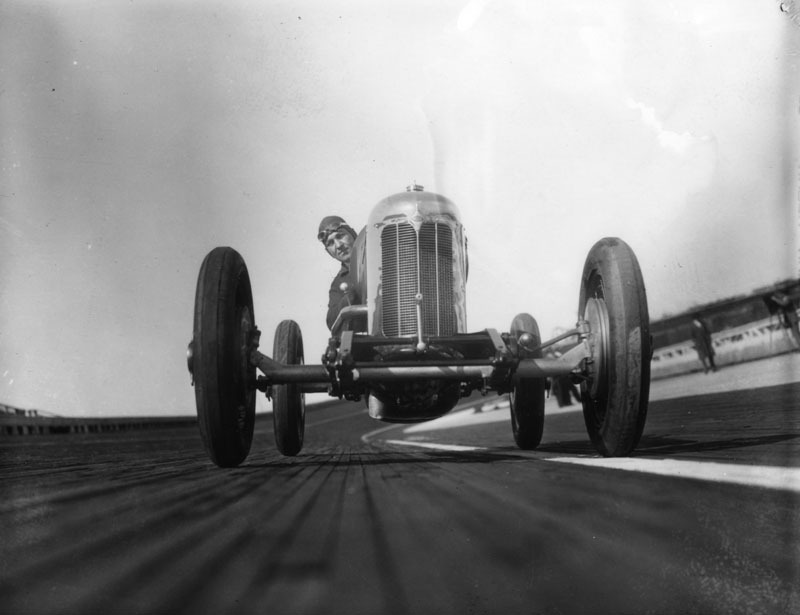 (1927)^ - Photo taken of a driver sitting in his race car, on the Los Angeles Speedway in Culver City.